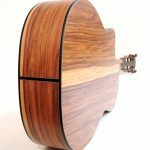 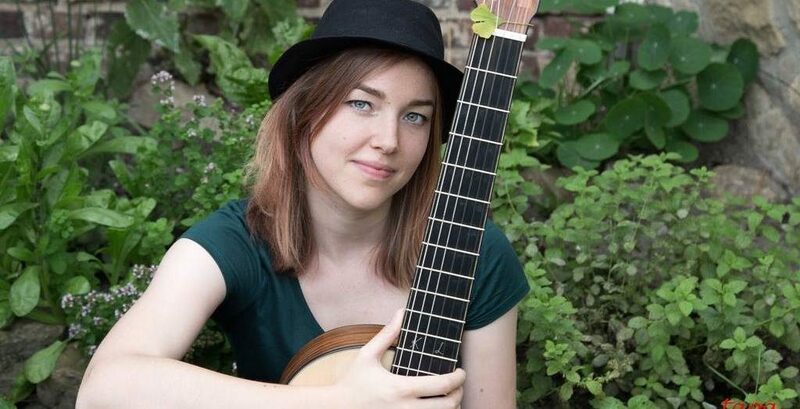 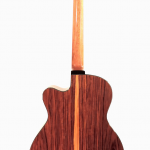 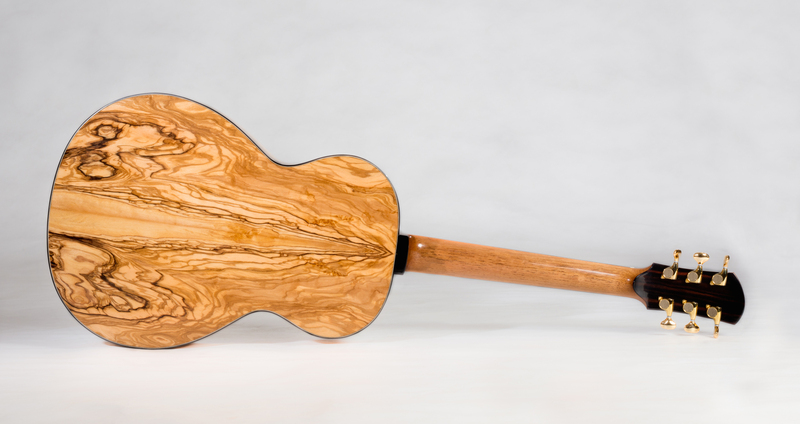 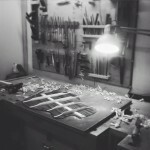 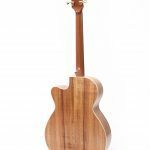 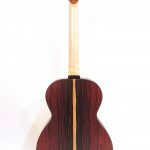 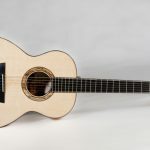 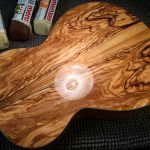 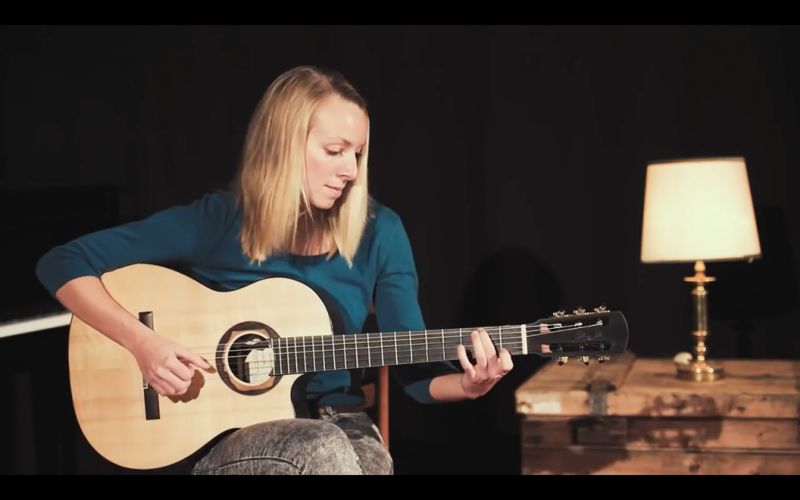 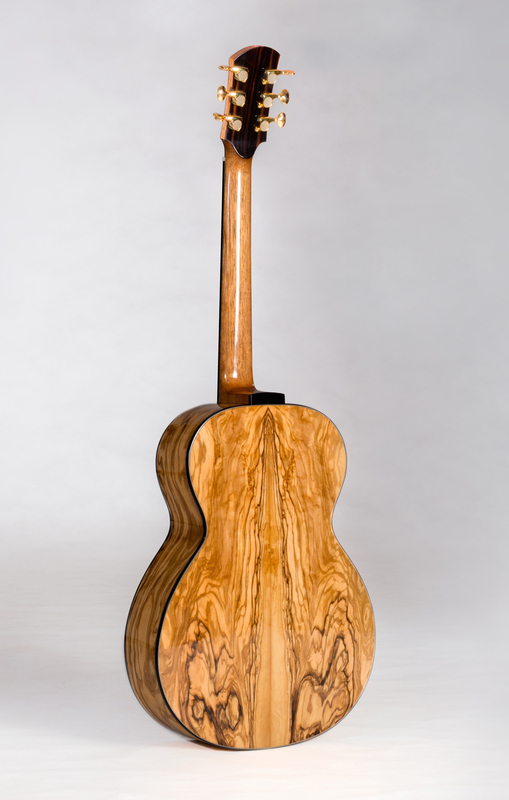 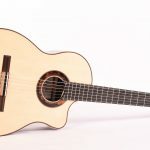 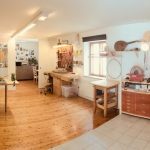 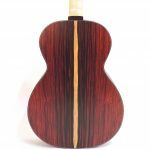 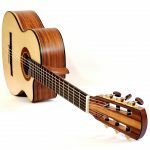 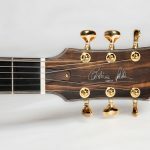 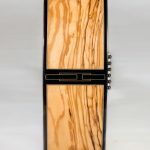 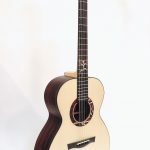 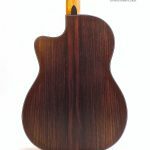 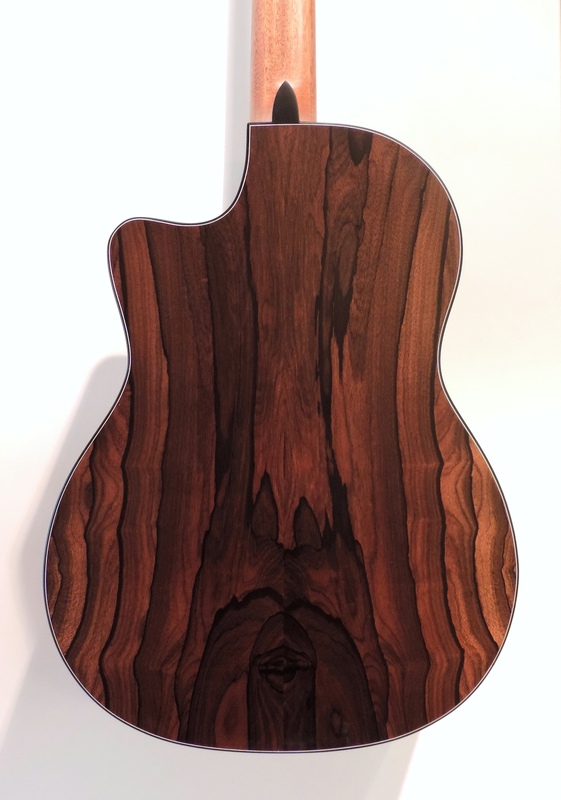 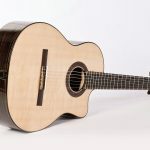 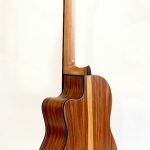 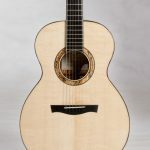 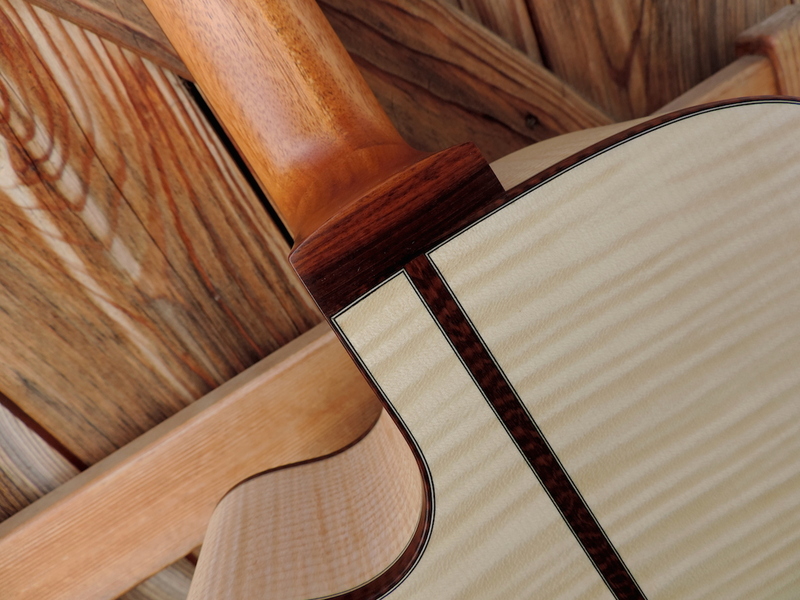 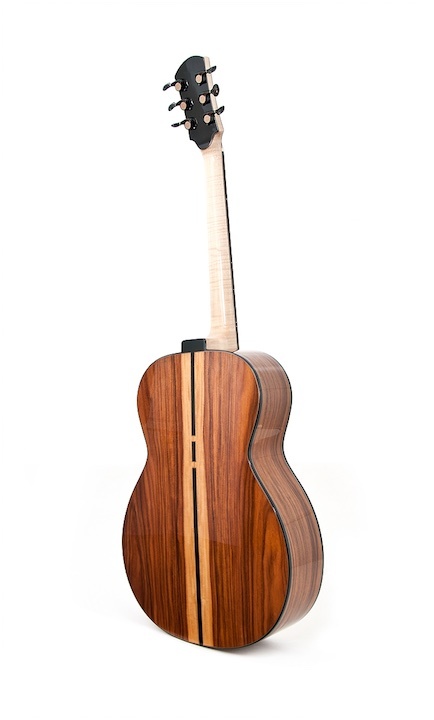 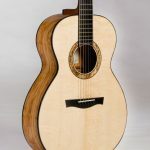 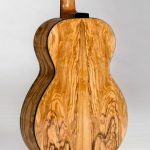 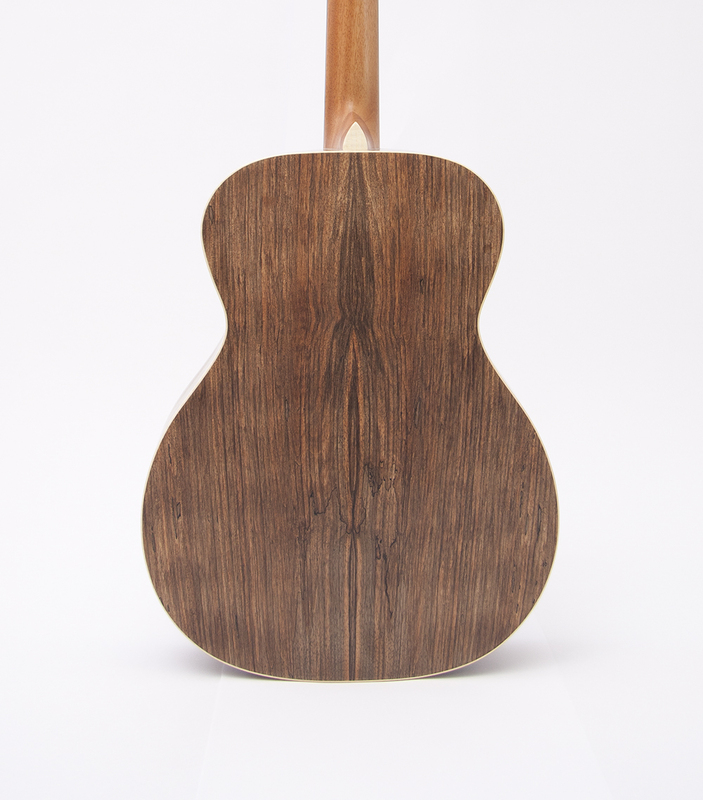 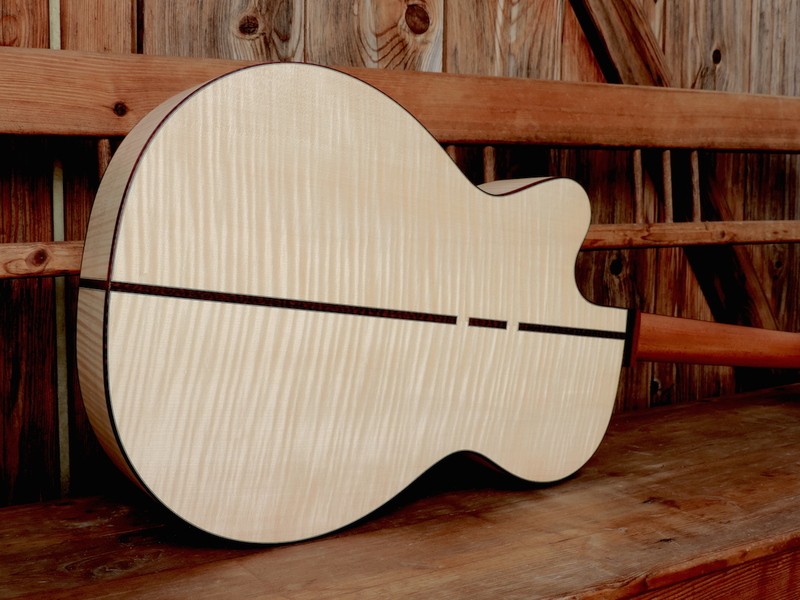 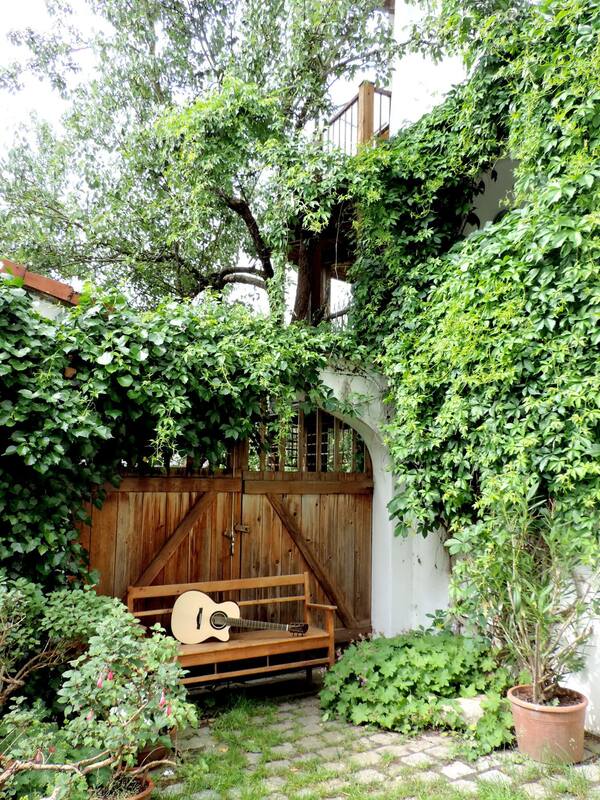 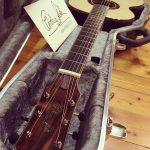 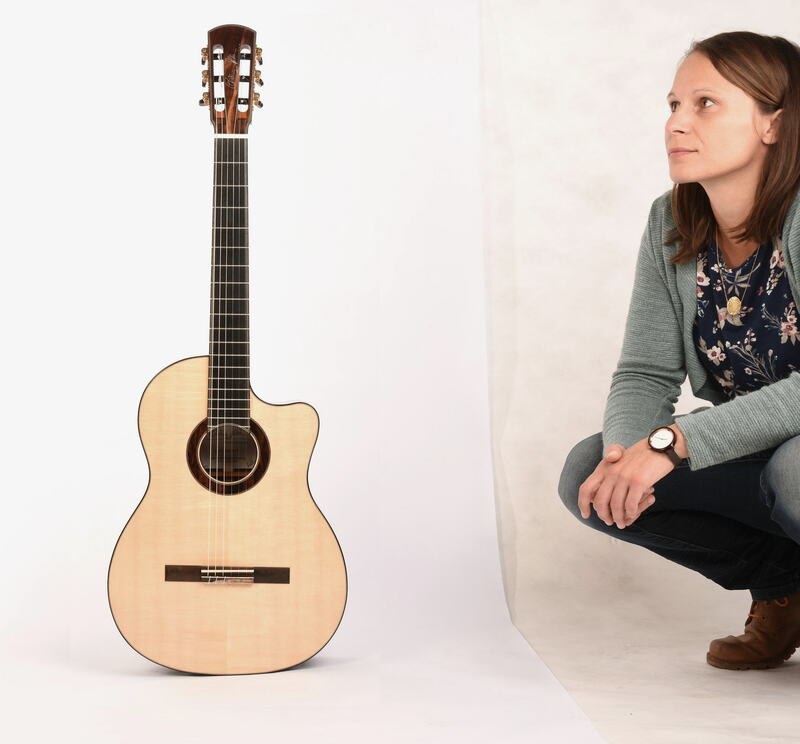 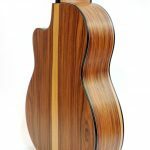 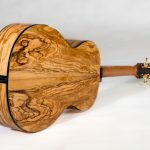 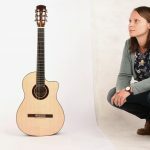 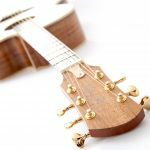 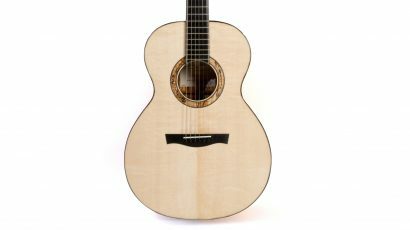 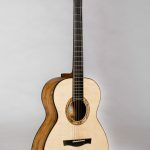 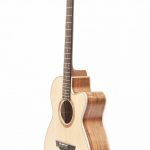 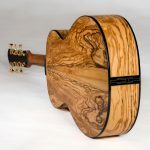 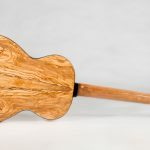 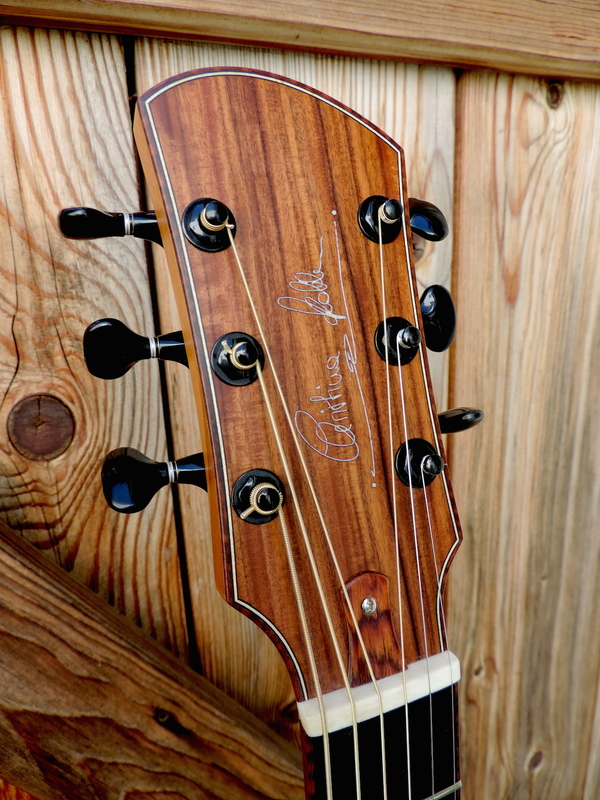 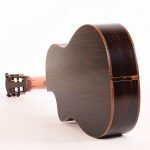 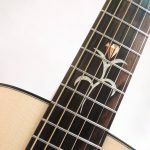 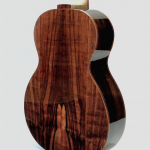 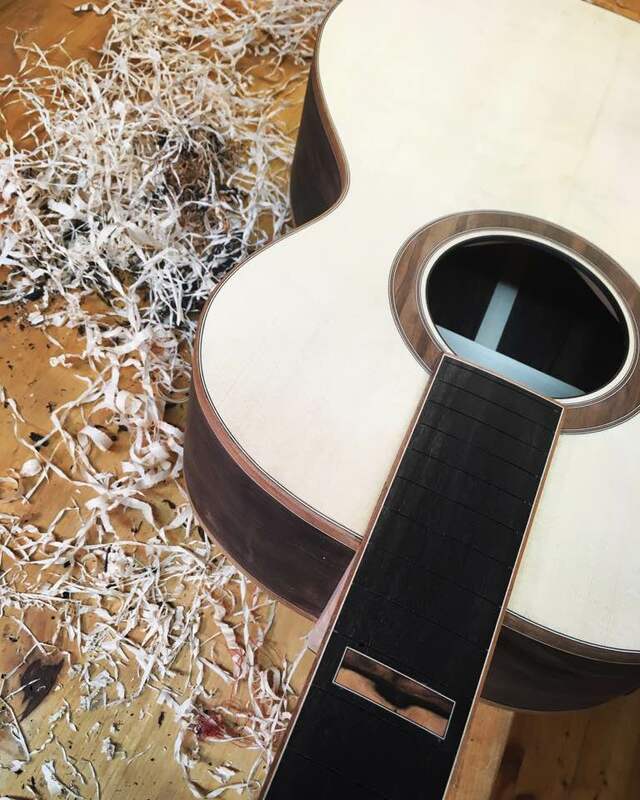 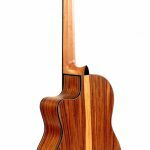 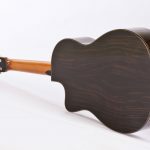 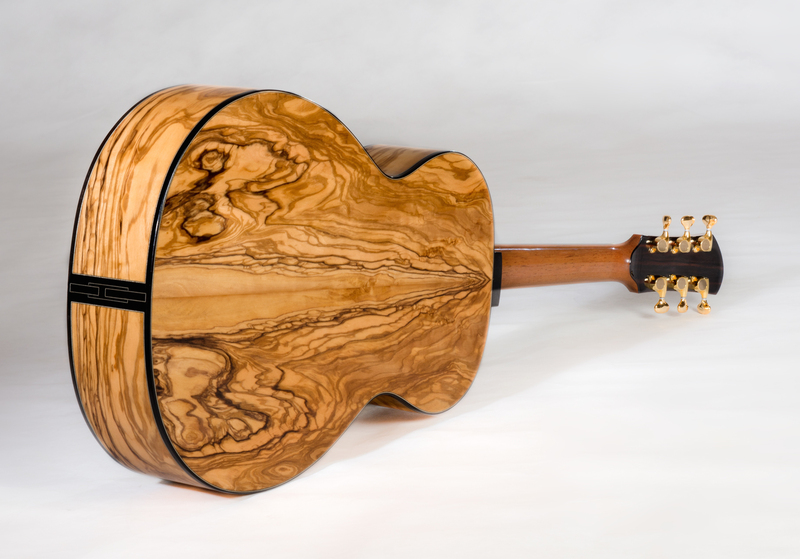 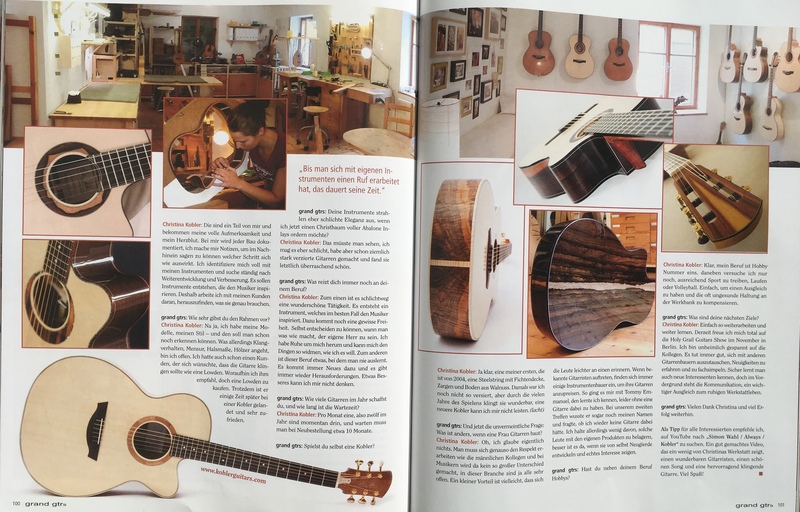 My love of guitar building grew out of my interests in playing the guitar and working enthusiastically with wood in my grandfather’s joiner’s workshop at a very young age. 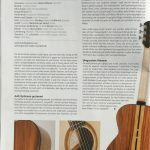 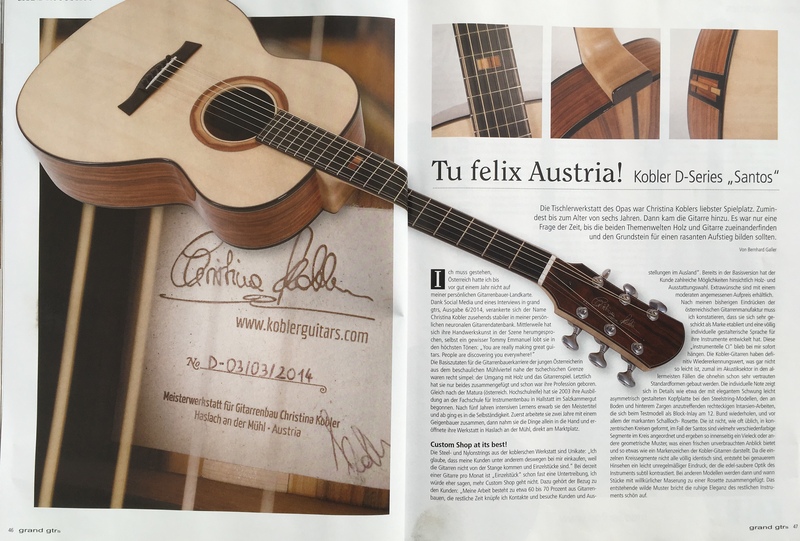 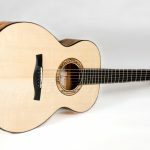 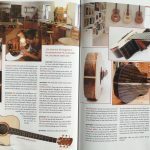 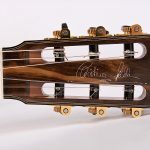 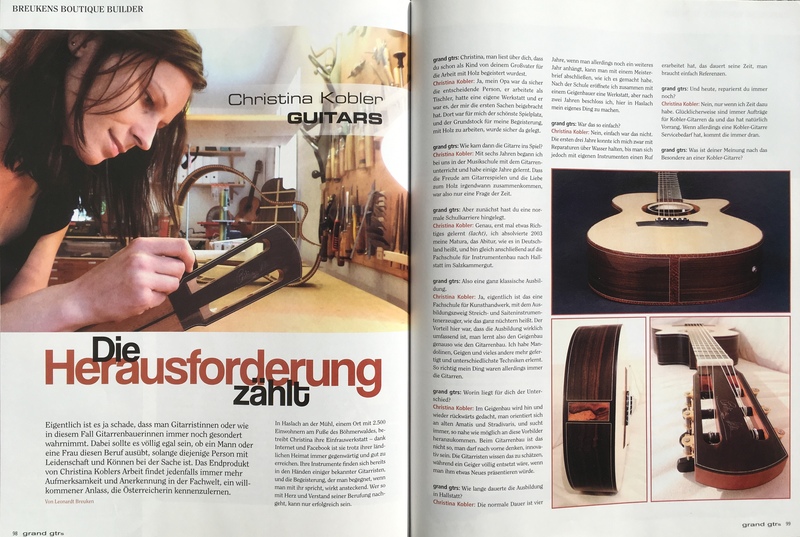 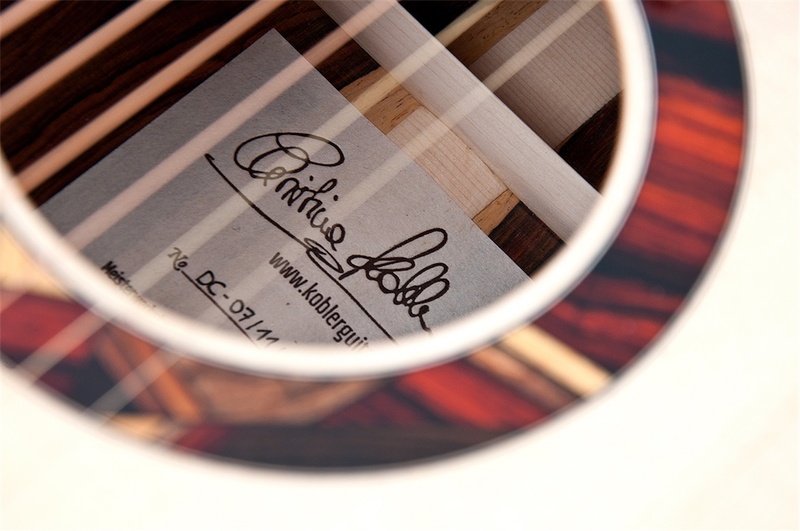 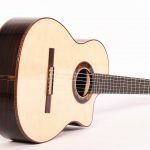 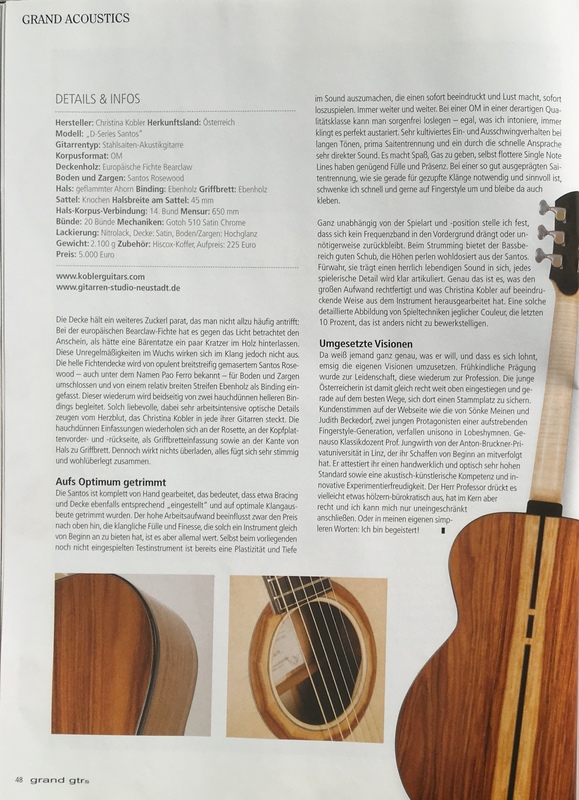 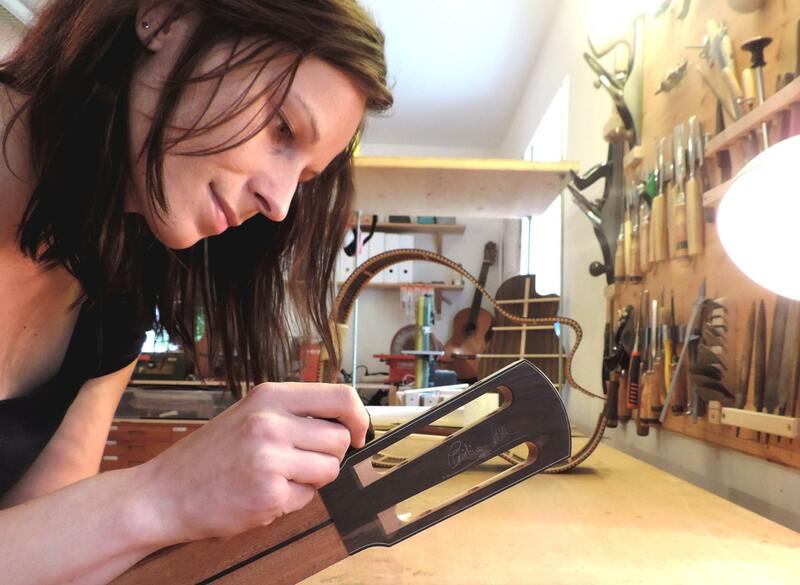 Along the way, I had the opportunity to study a 5 year full-time guitar building course at the luthier school (Fachschule für Instrumentenbau) in Hallstatt/Austria. 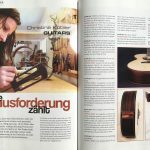 In 2008, after achieving my master degree, and acquiring a license to run my own business, I set up my workshop in Haslach. 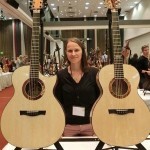 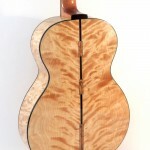 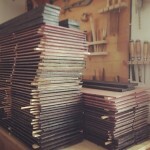 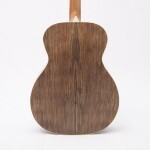 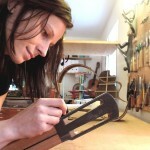 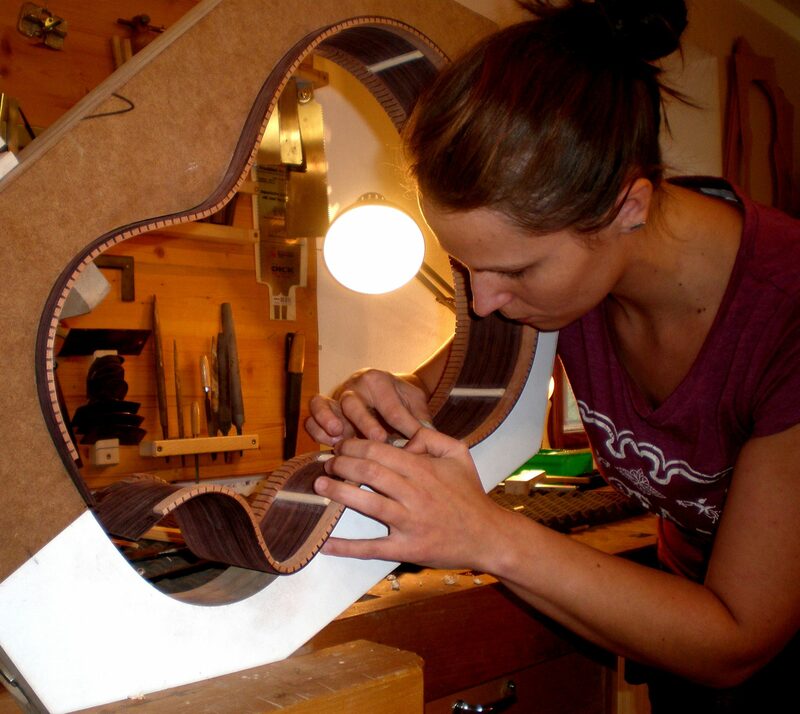 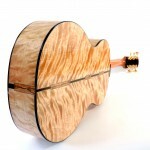 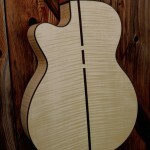 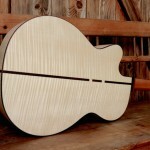 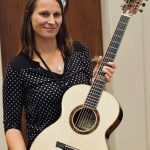 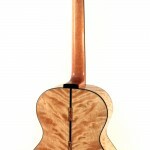 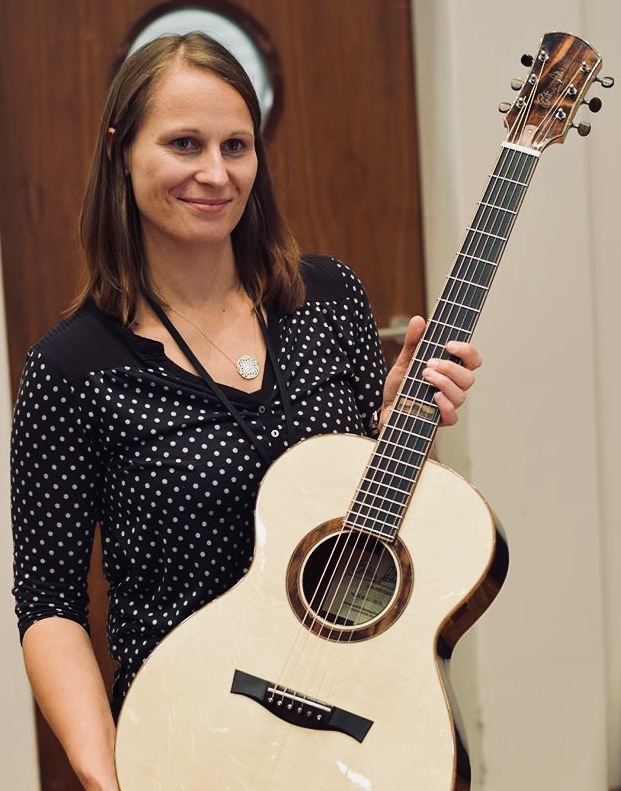 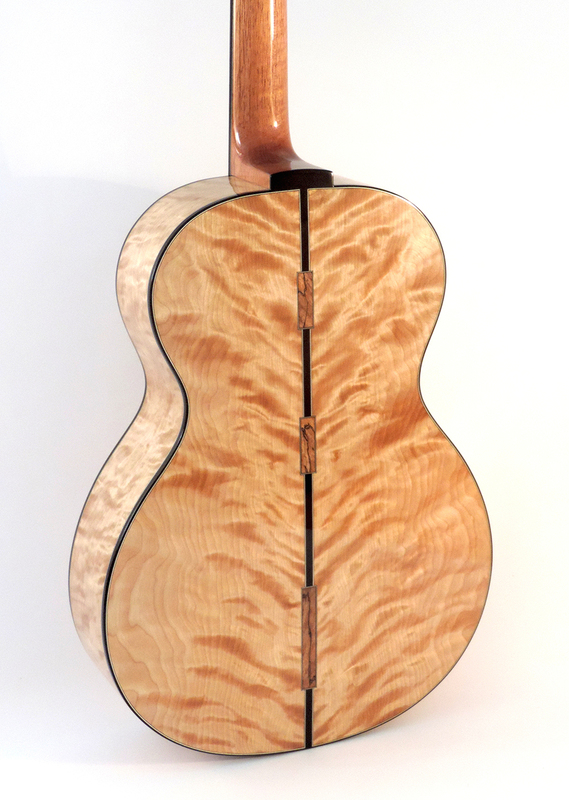 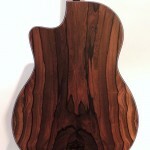 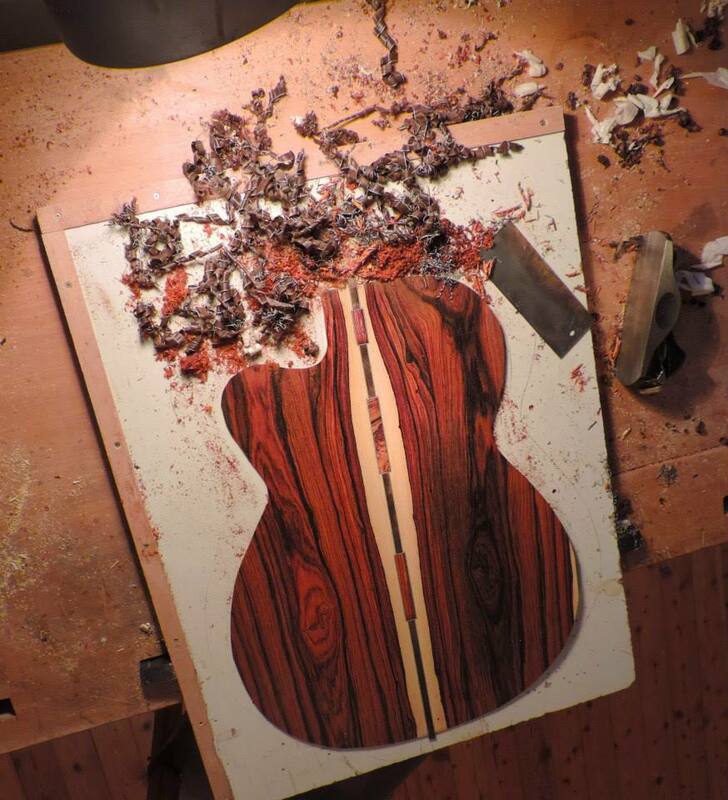 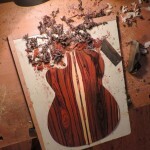 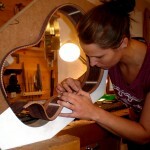 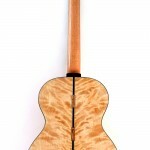 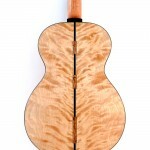 I am a „one woman shop“ by choice and I am currently creating 8-10 guitars annually. 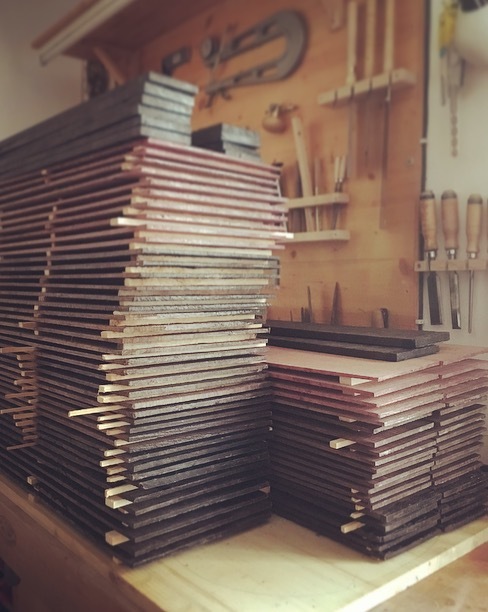 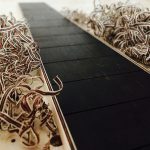 Not only do I stress the importance of professional workmanship, I also choose the highest quality of available materials and see to their perfect storage. 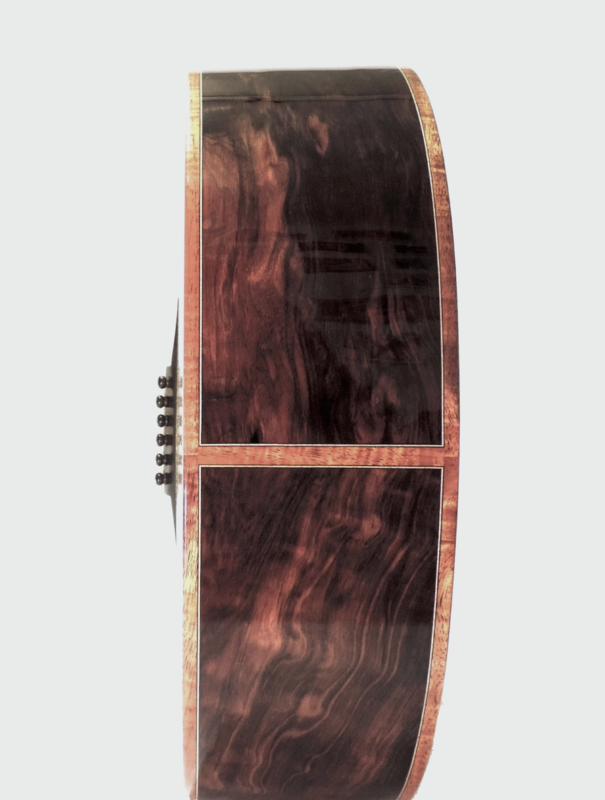 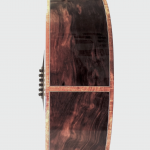 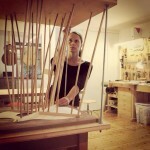 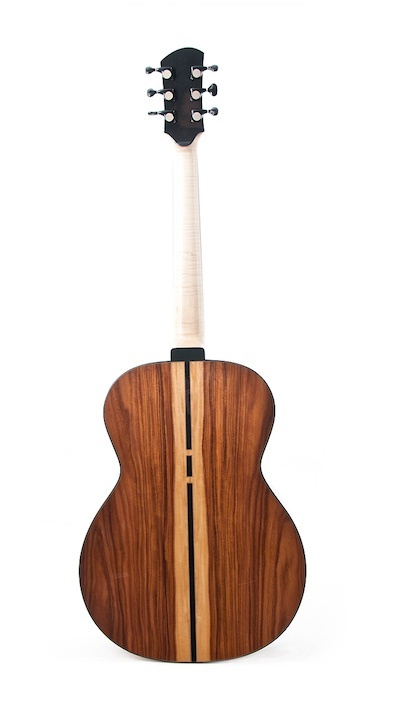 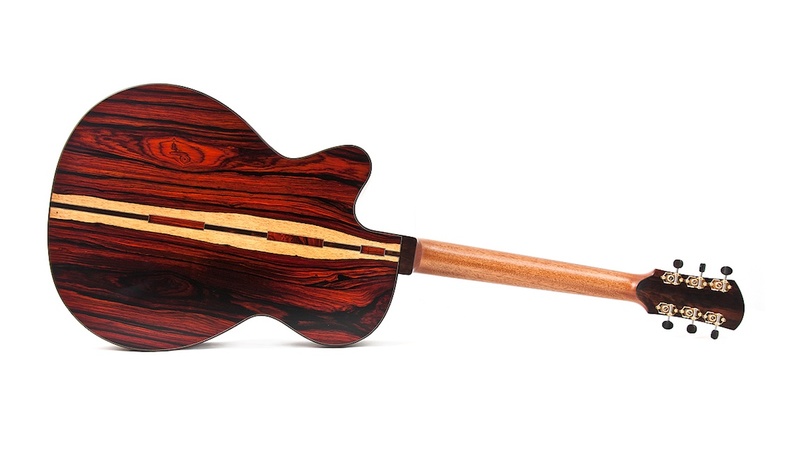 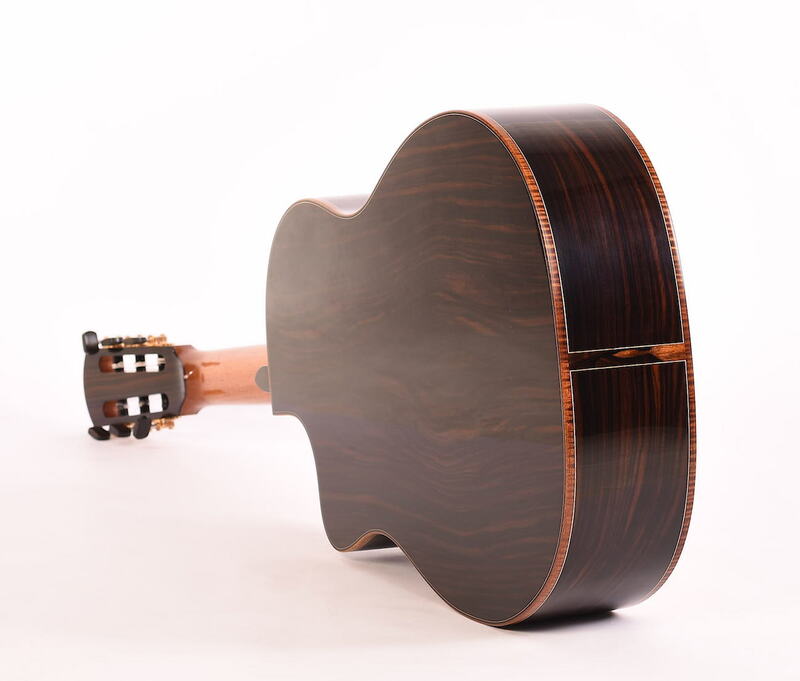 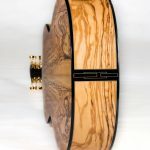 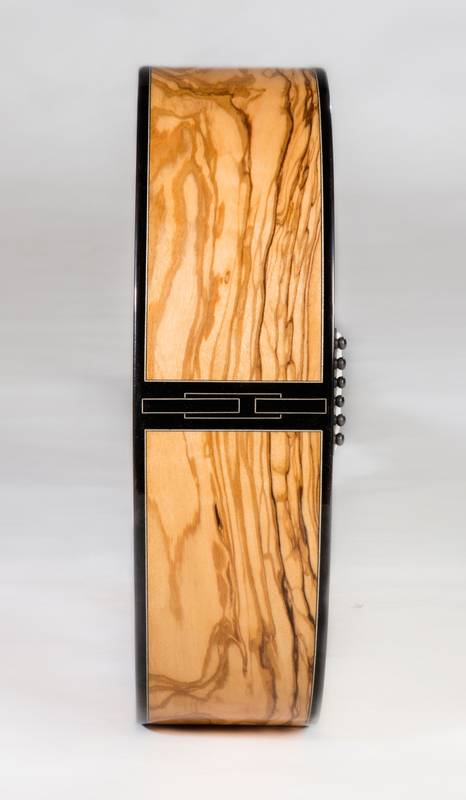 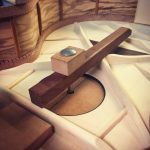 Each instrument is unique, produced by using age-old craftsmanship. 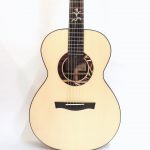 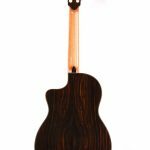 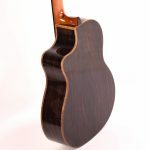 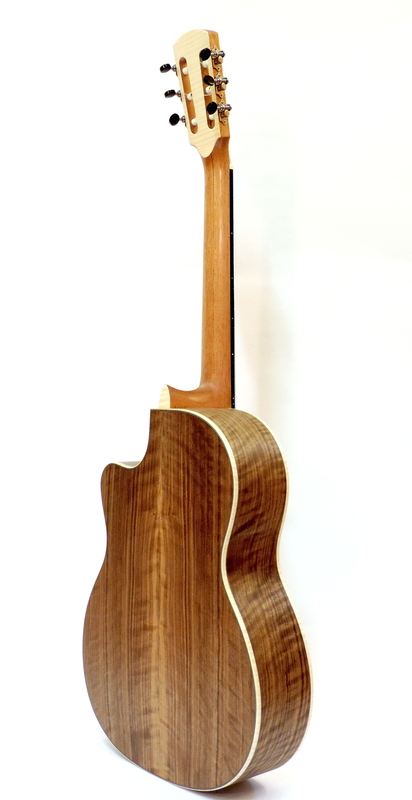 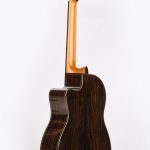 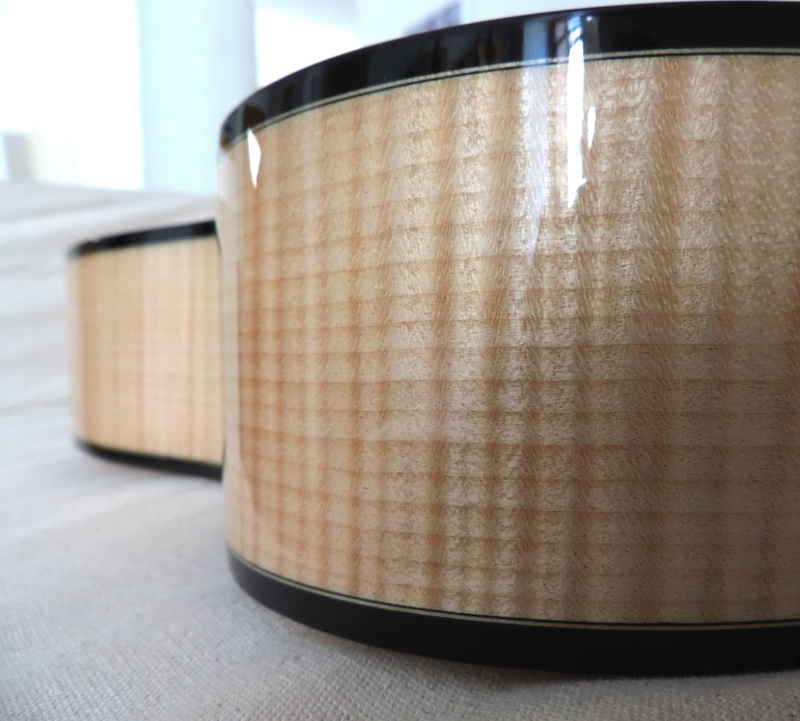 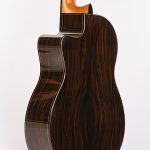 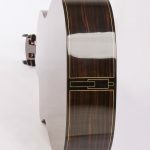 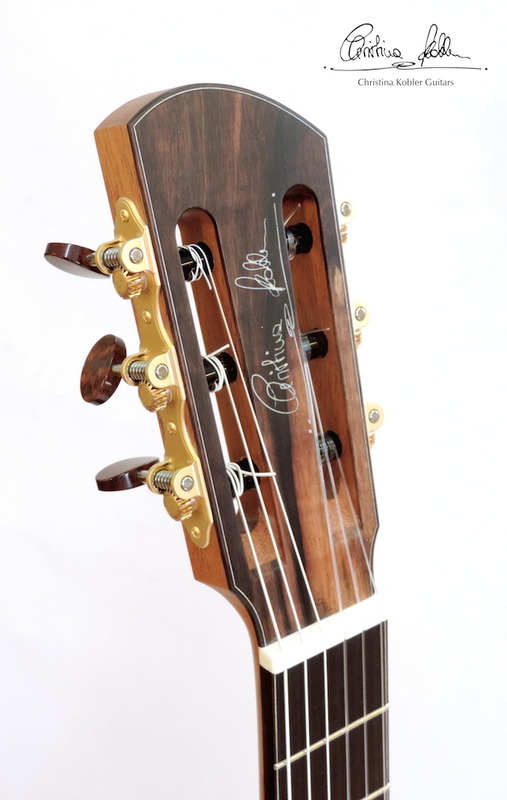 It is a collaboration between the customer and myself from the beginning to the delivery of the guitar once it is finished. 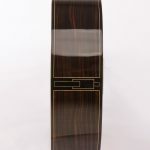 Optical and aesthetic details, in addition to diverse measurements and settings, are fashioned according to the customer’s individual preferences. 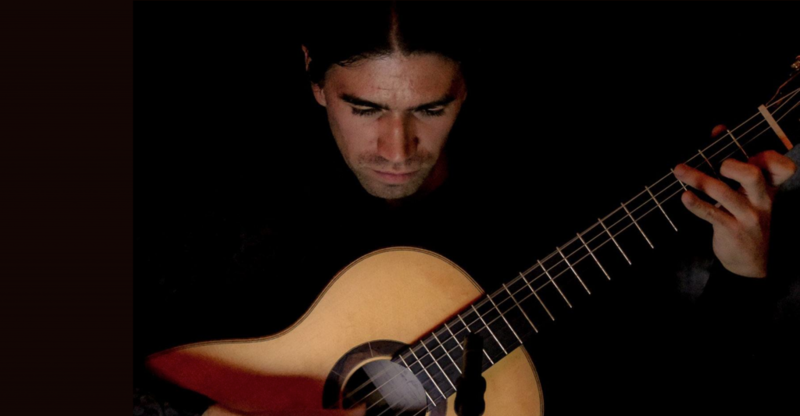 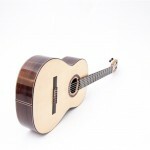 My sincere aim is that the musician is inspired by the guitar. 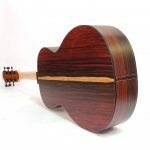 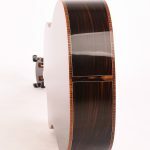 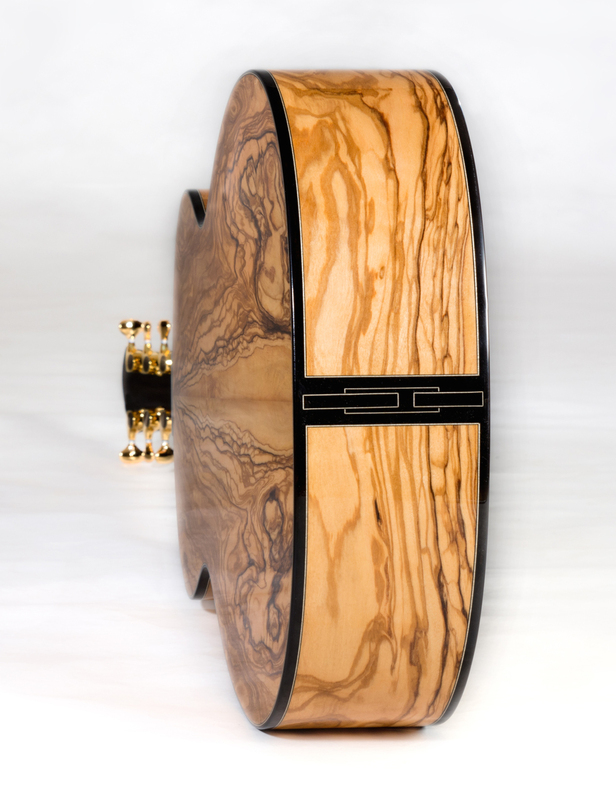 It is my desire to provide instruments tailored to your own special needs. 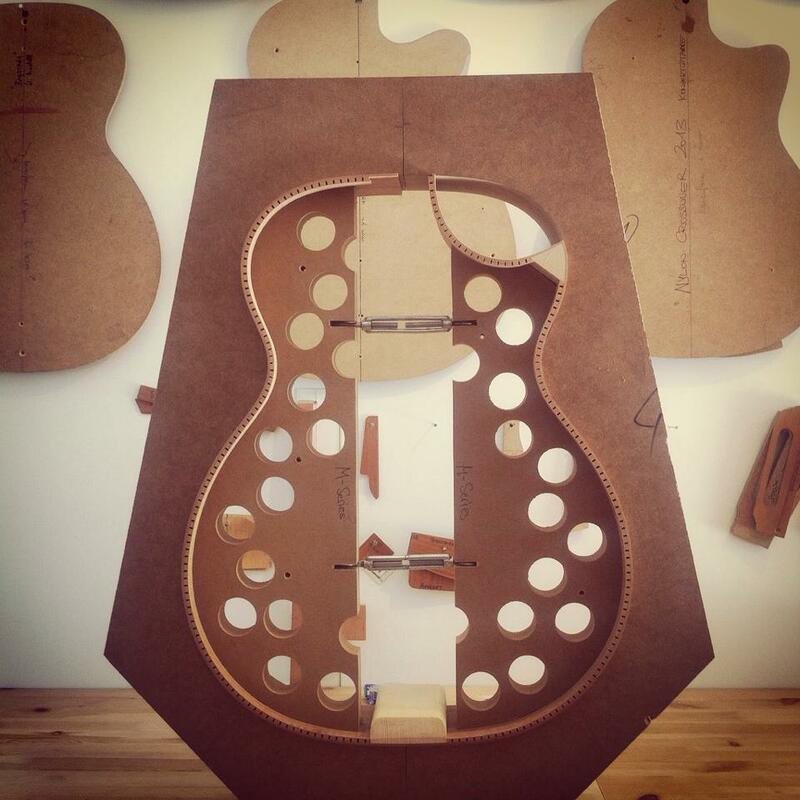 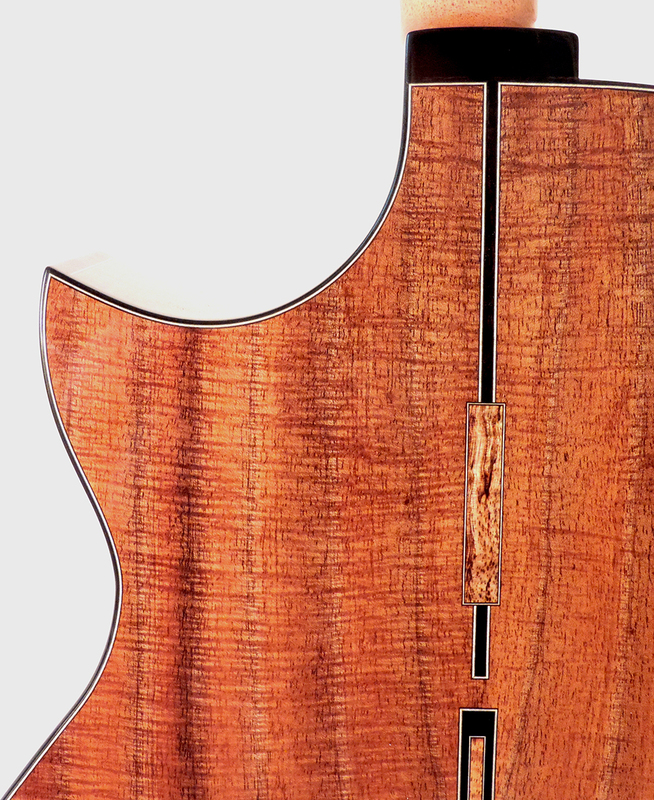 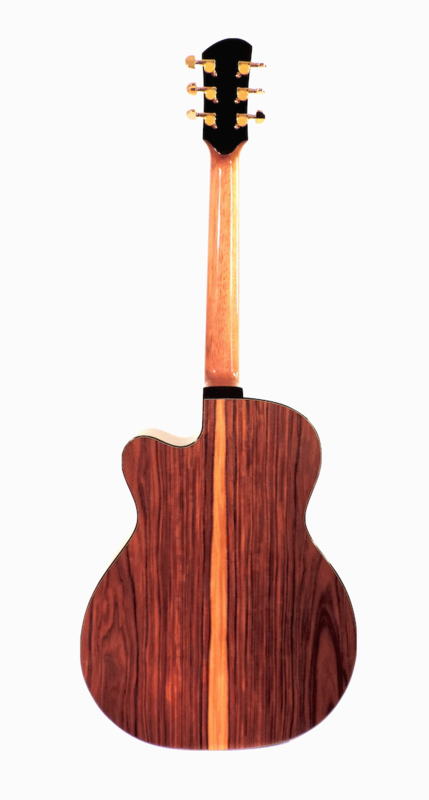 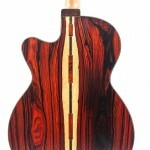 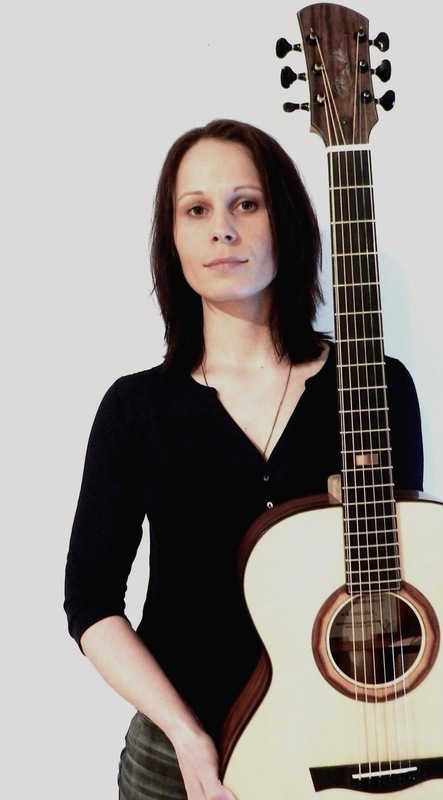 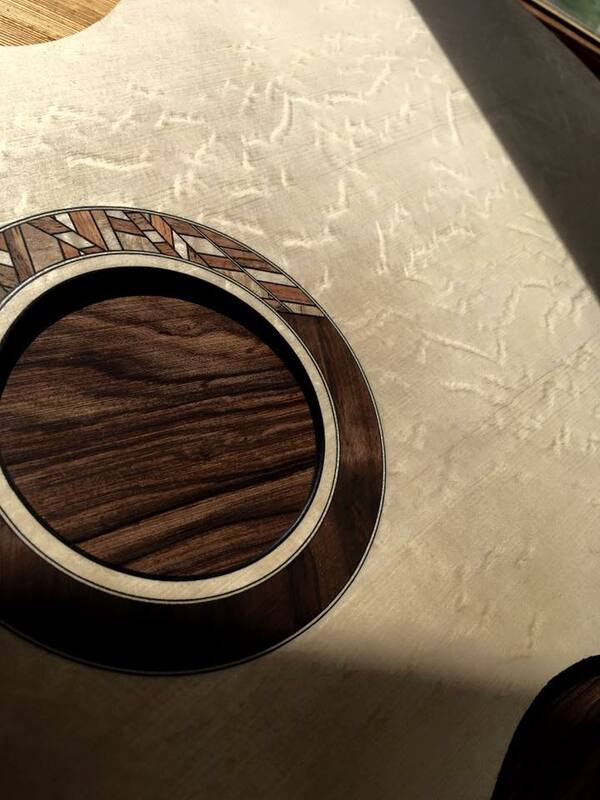 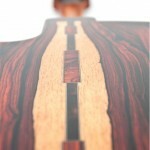 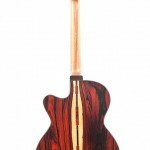 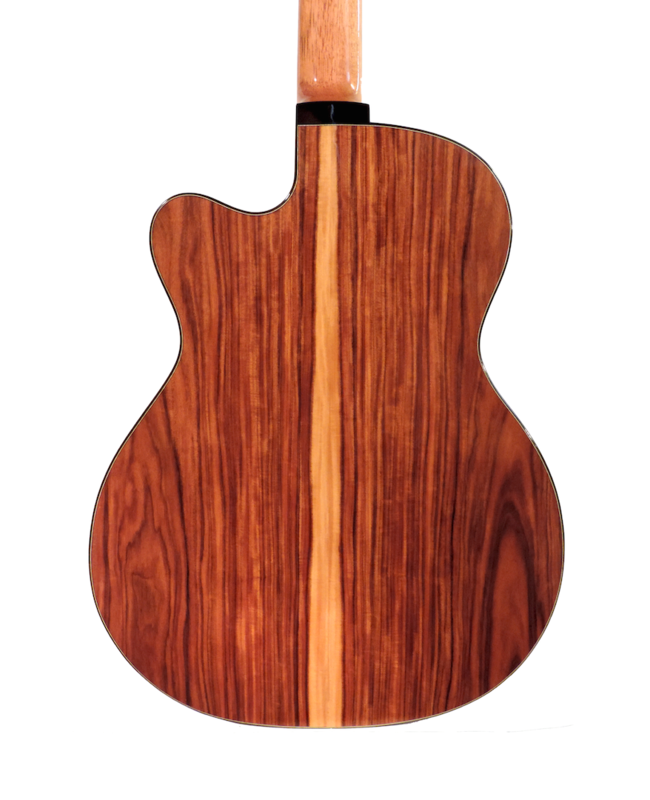 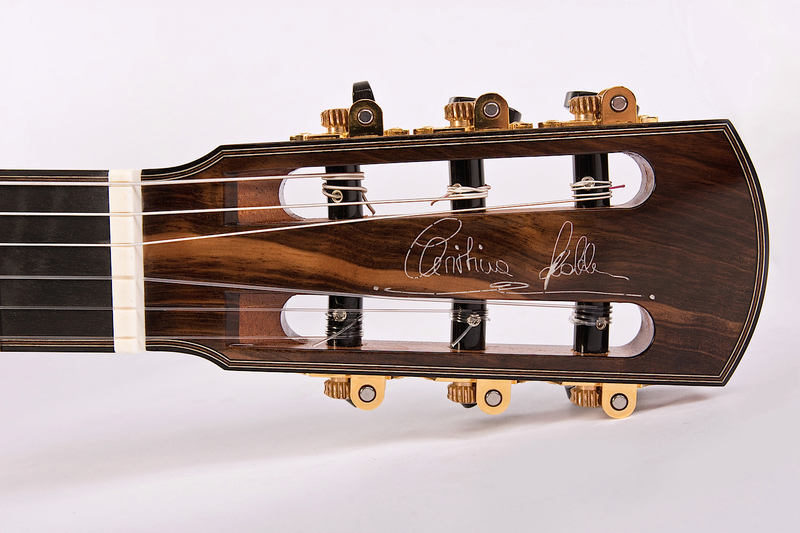 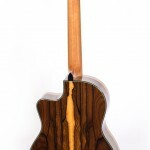 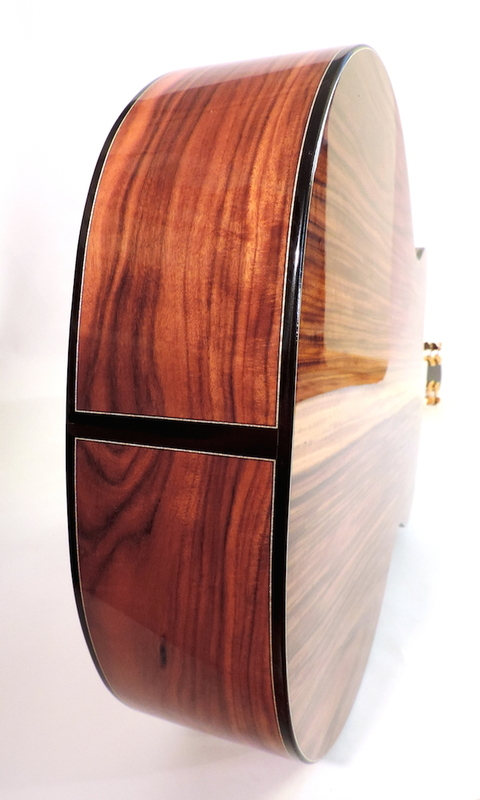 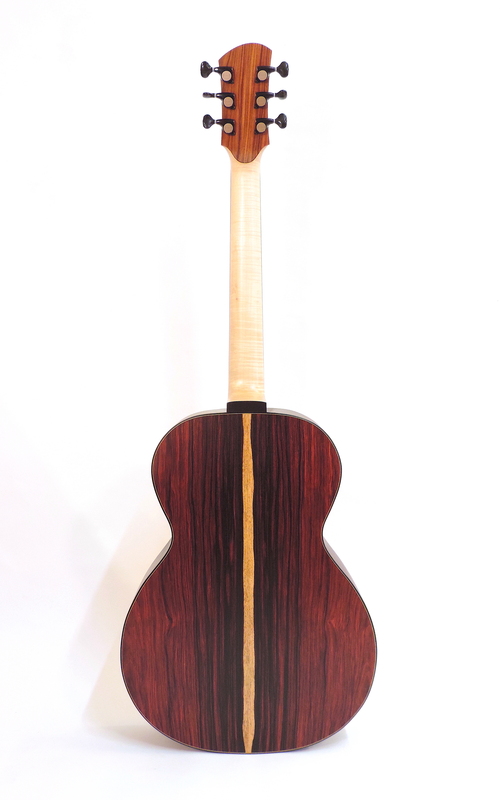 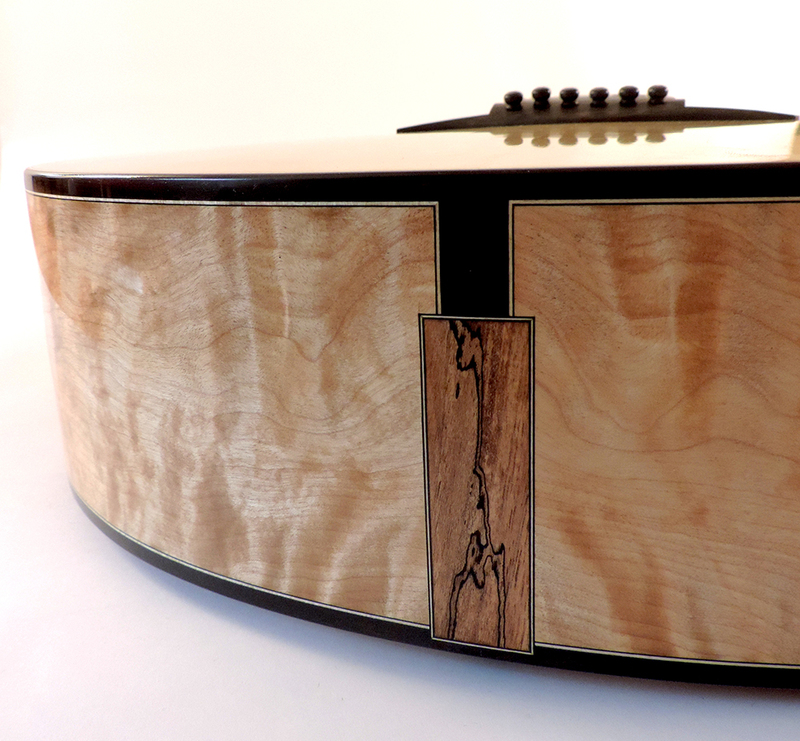 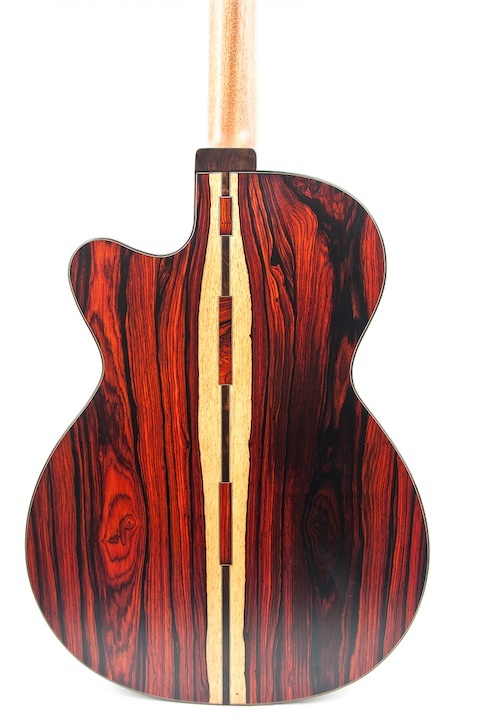 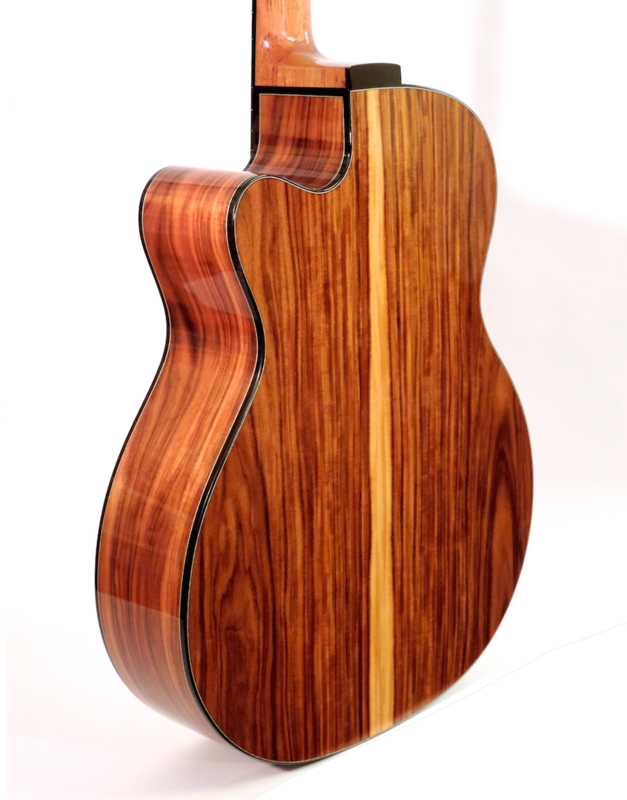 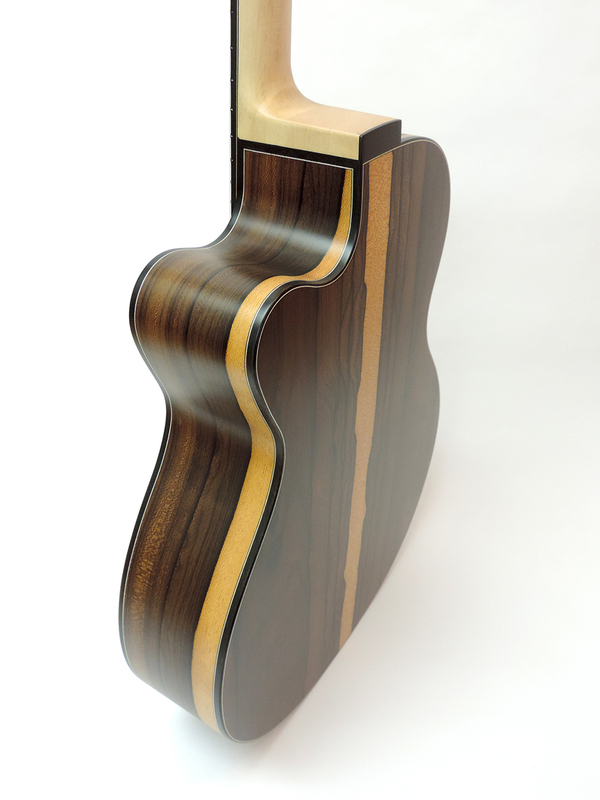 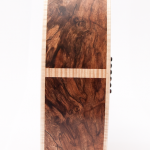 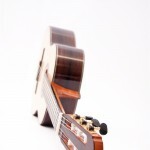 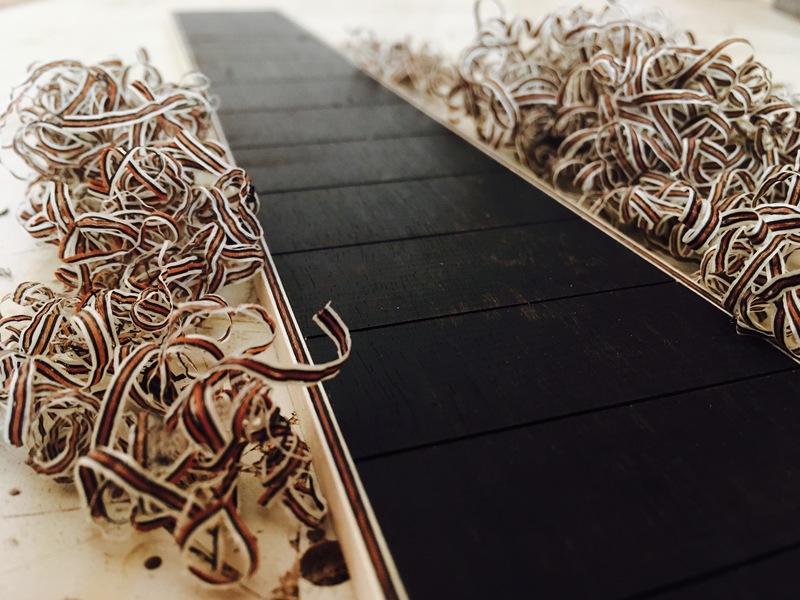 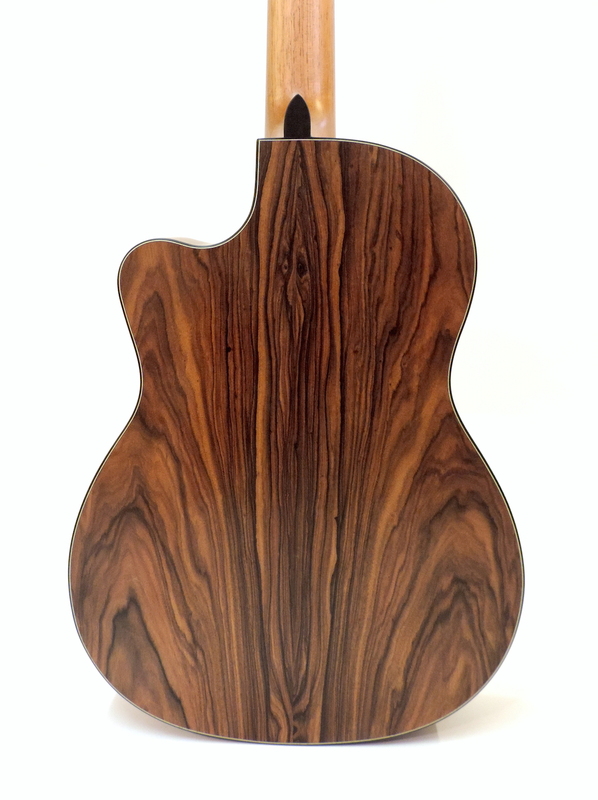 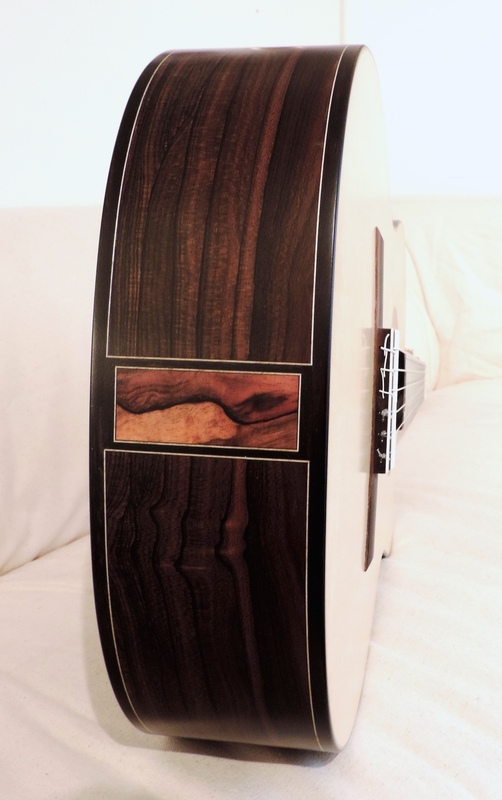 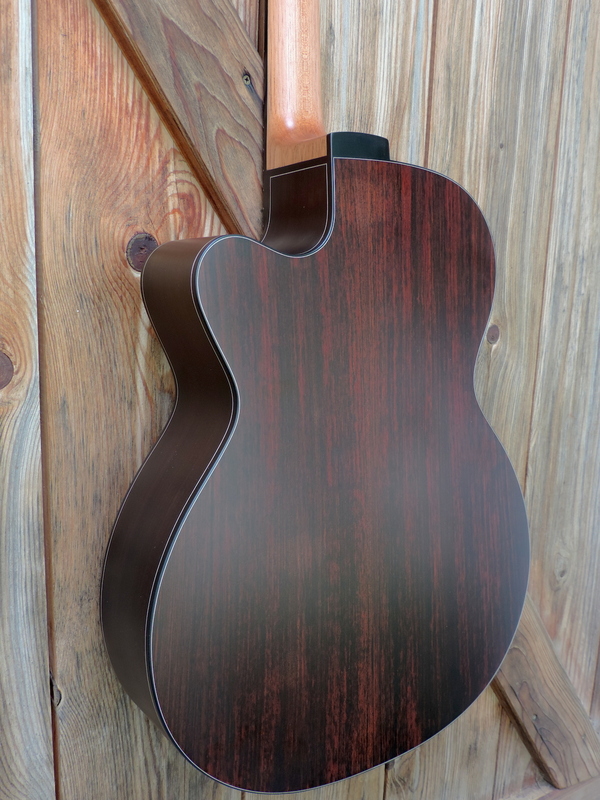 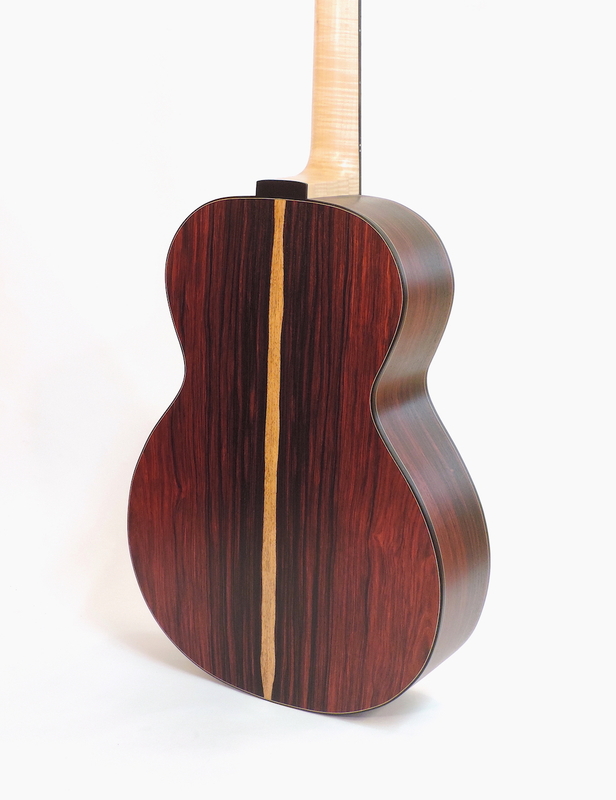 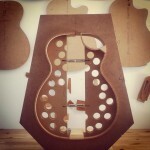 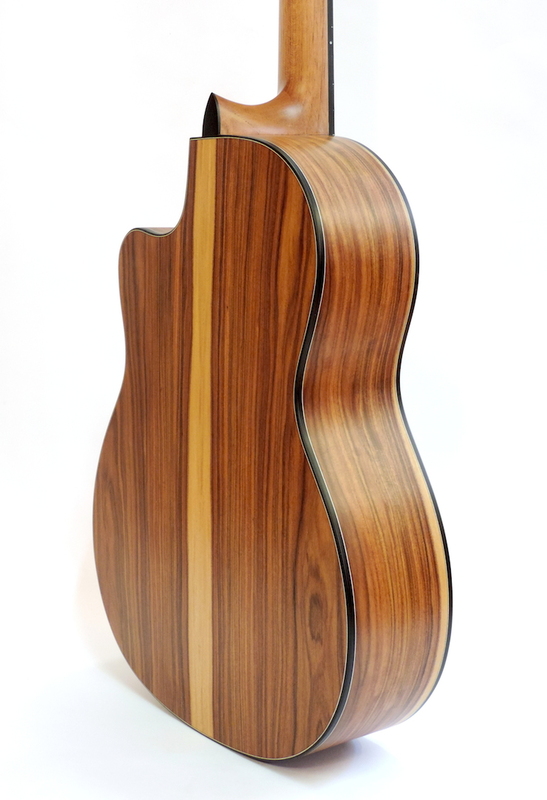 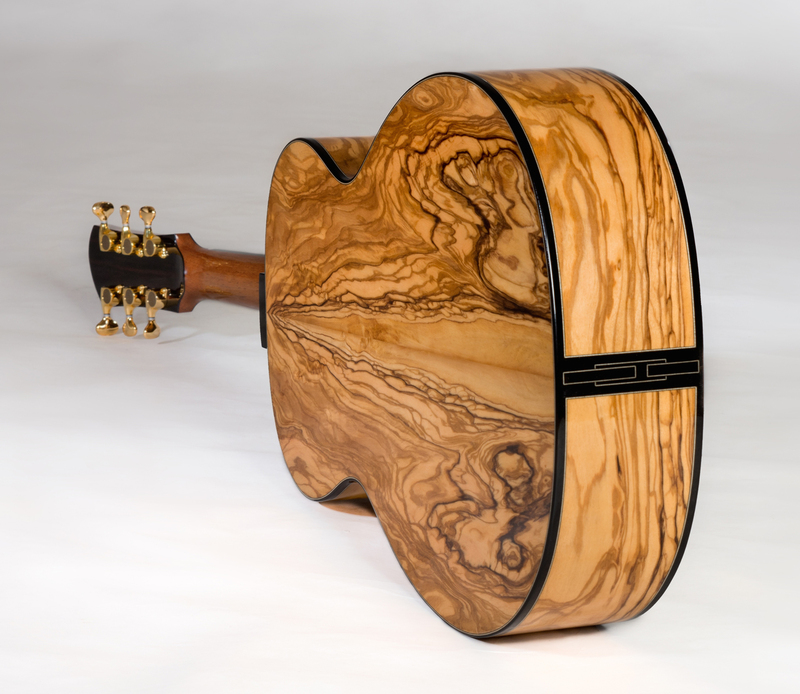 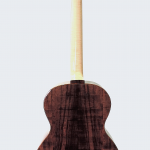 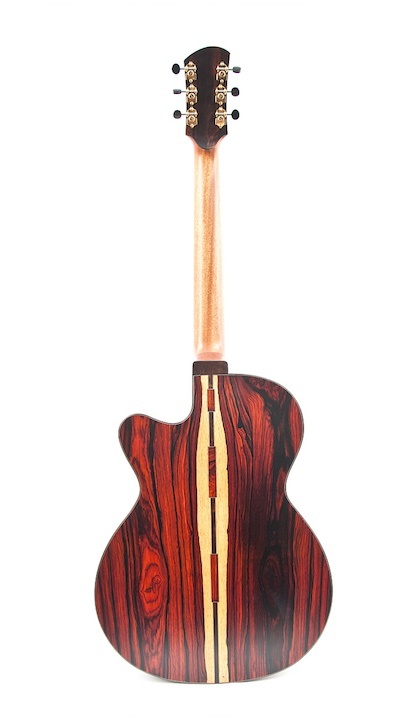 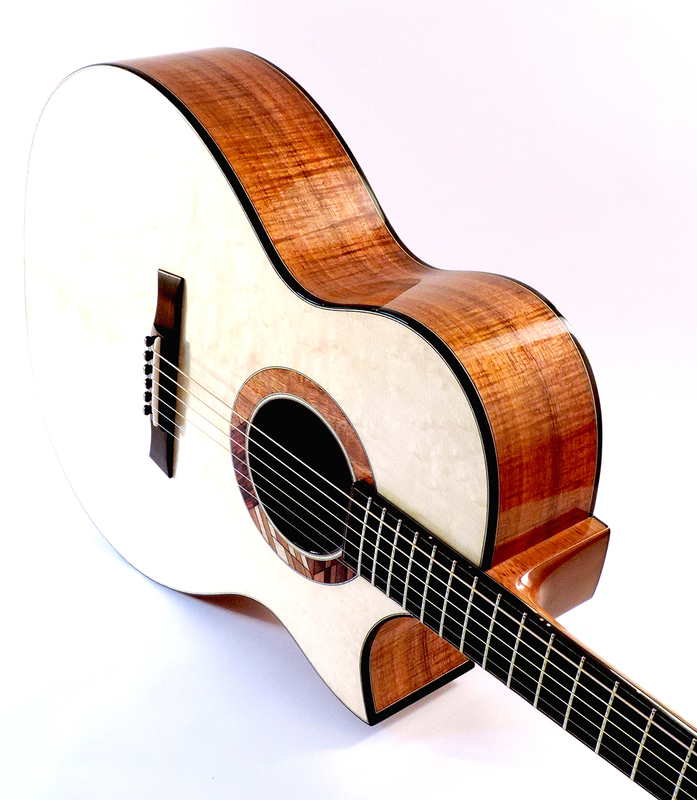 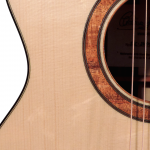 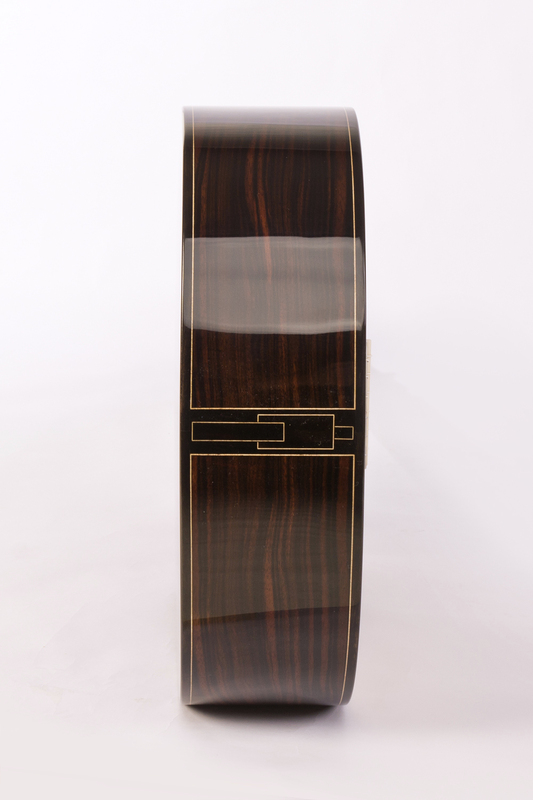 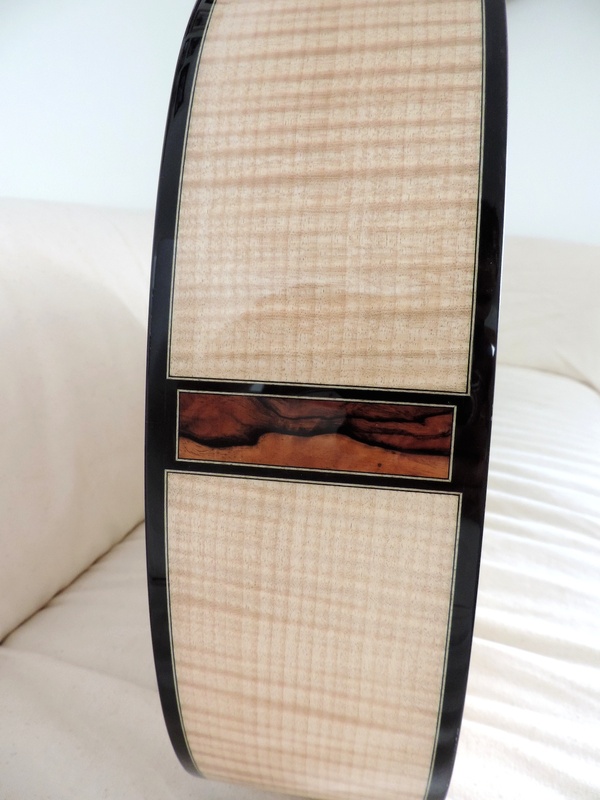 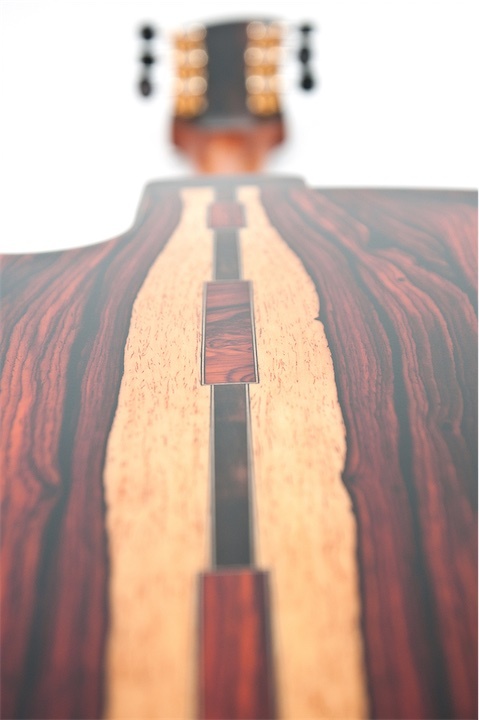 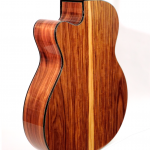 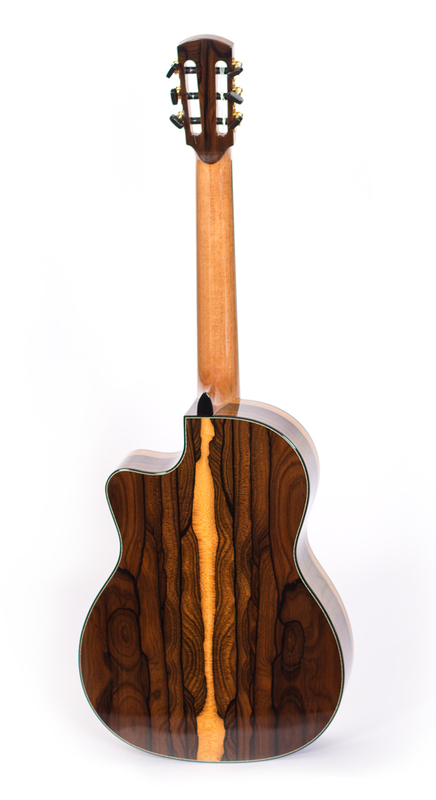 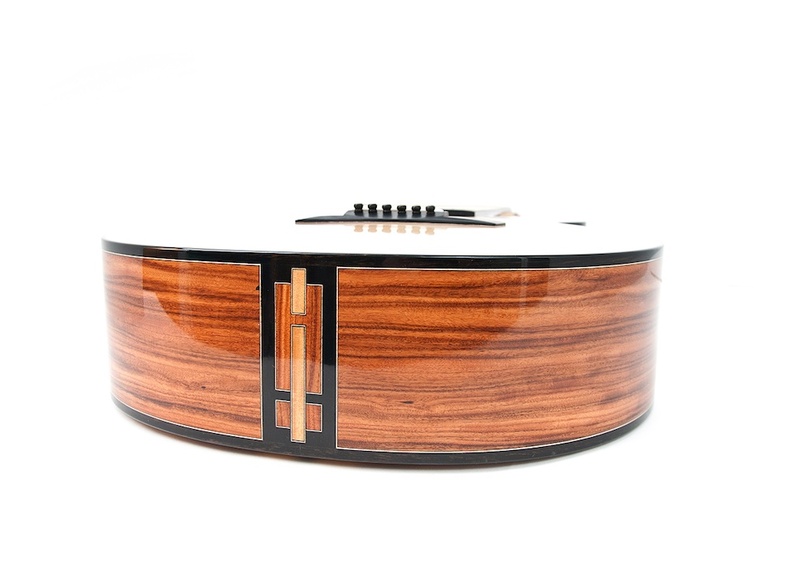 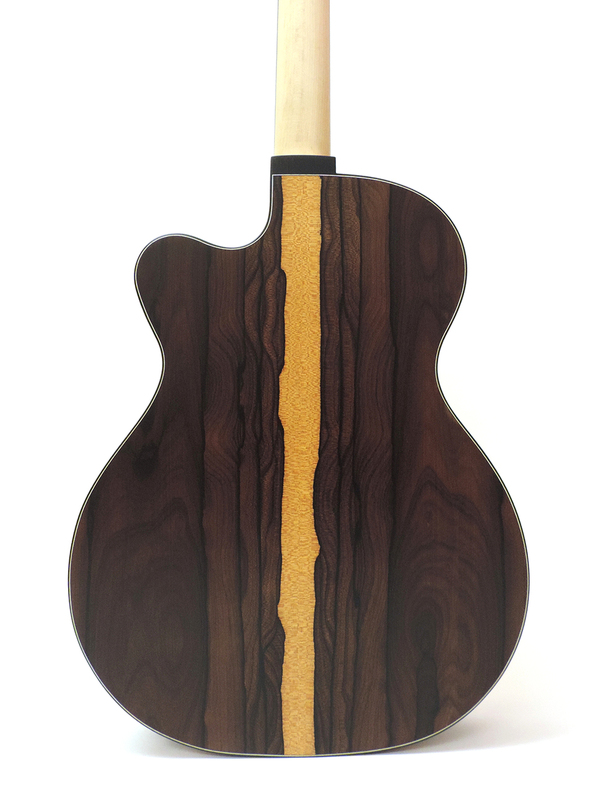 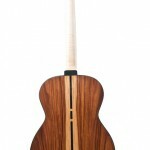 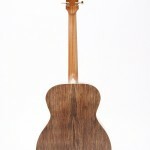 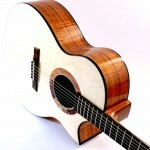 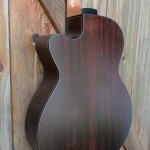 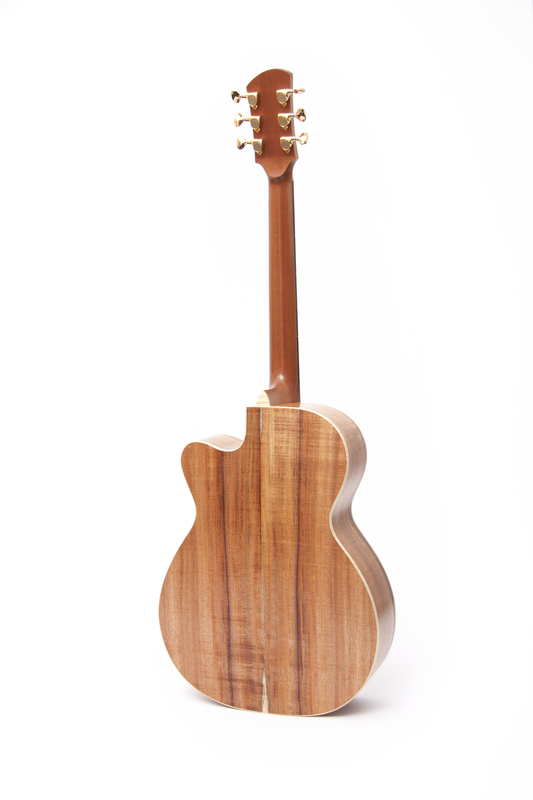 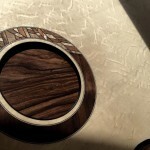 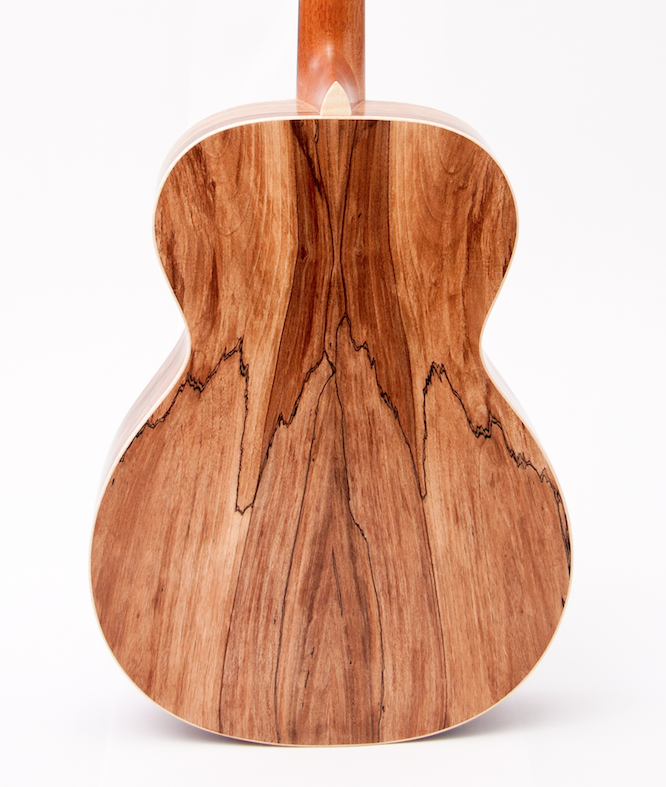 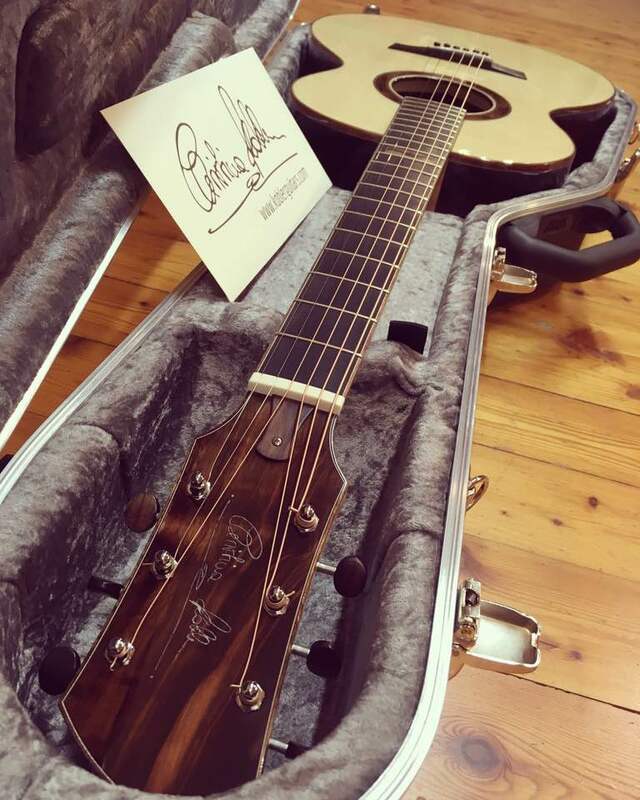 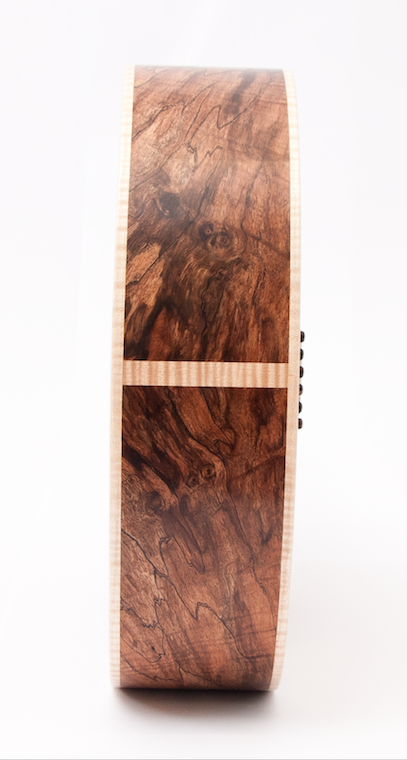 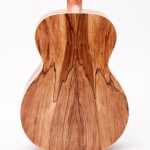 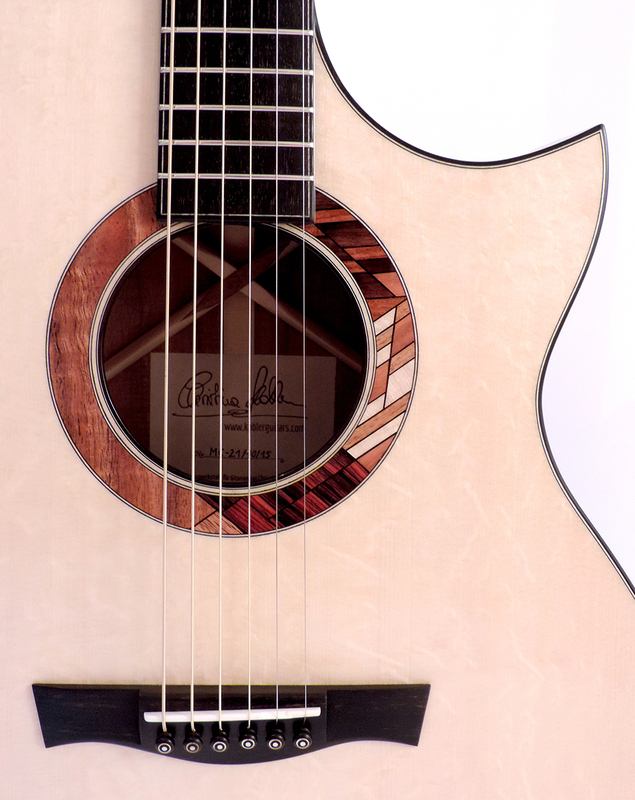 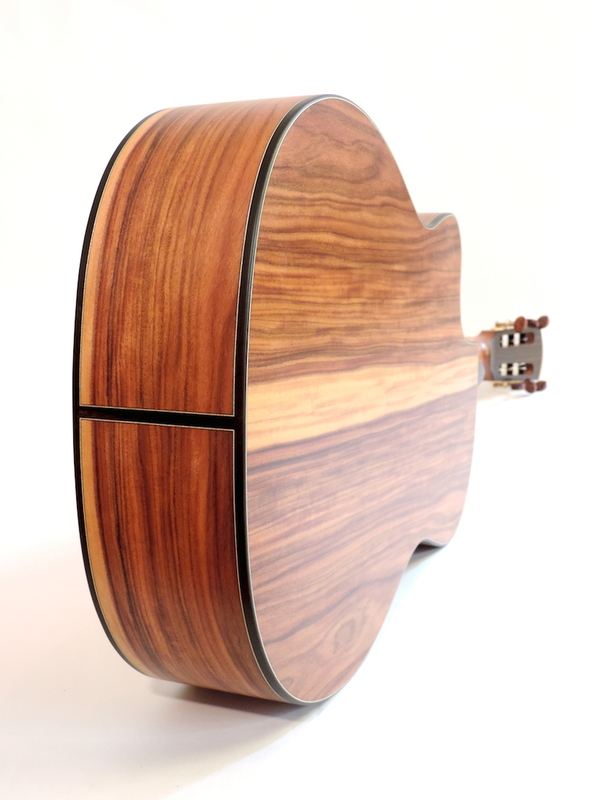 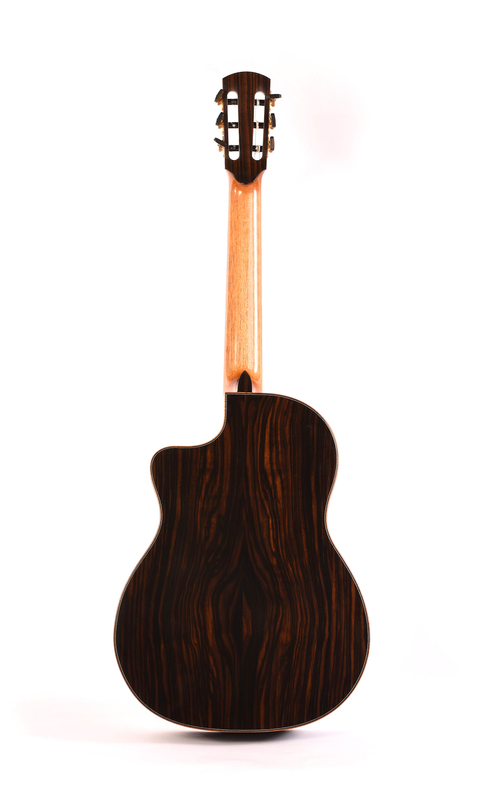 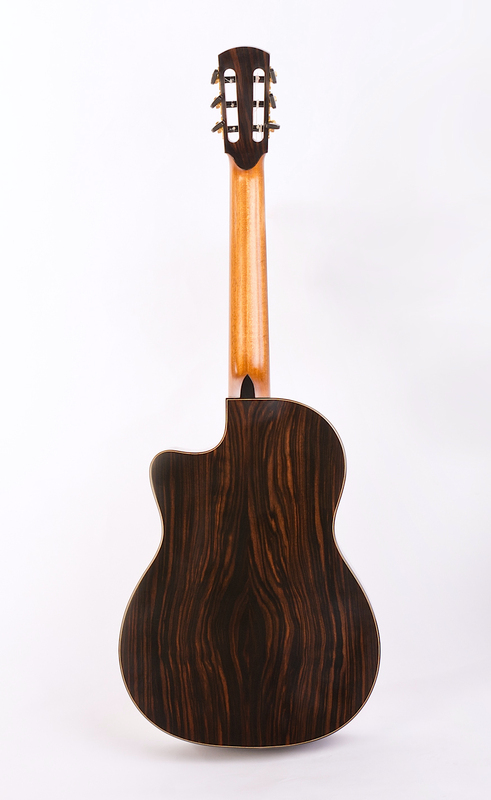 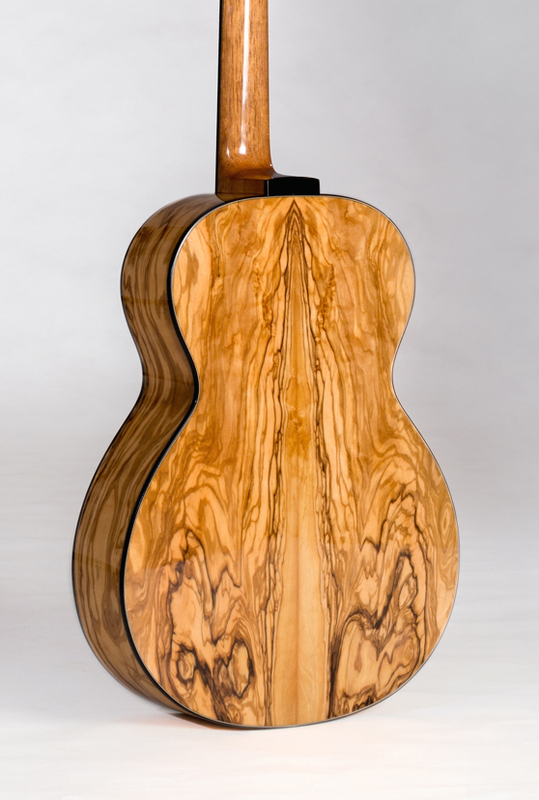 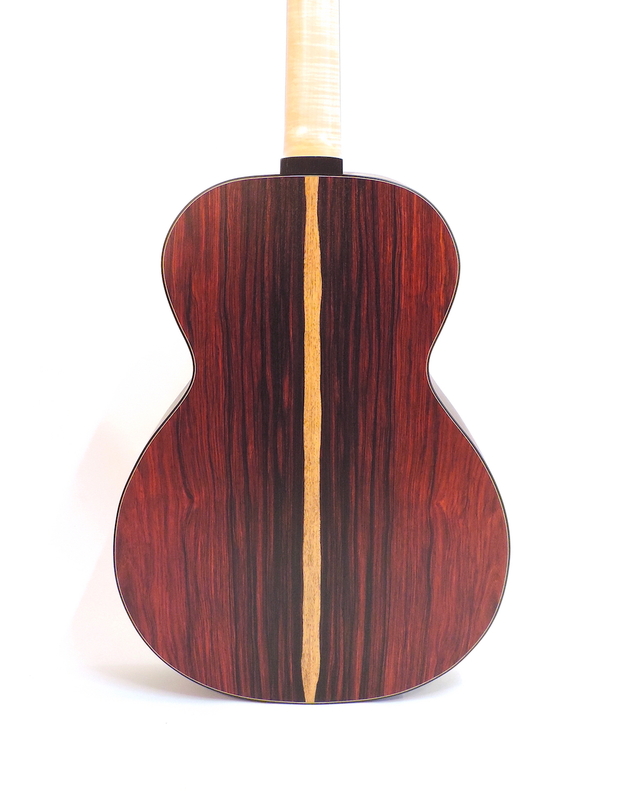 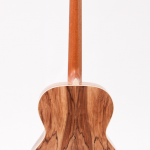 I look forward to working with you to create your individual guitar. 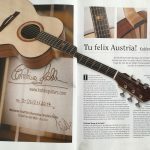 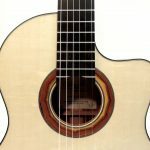 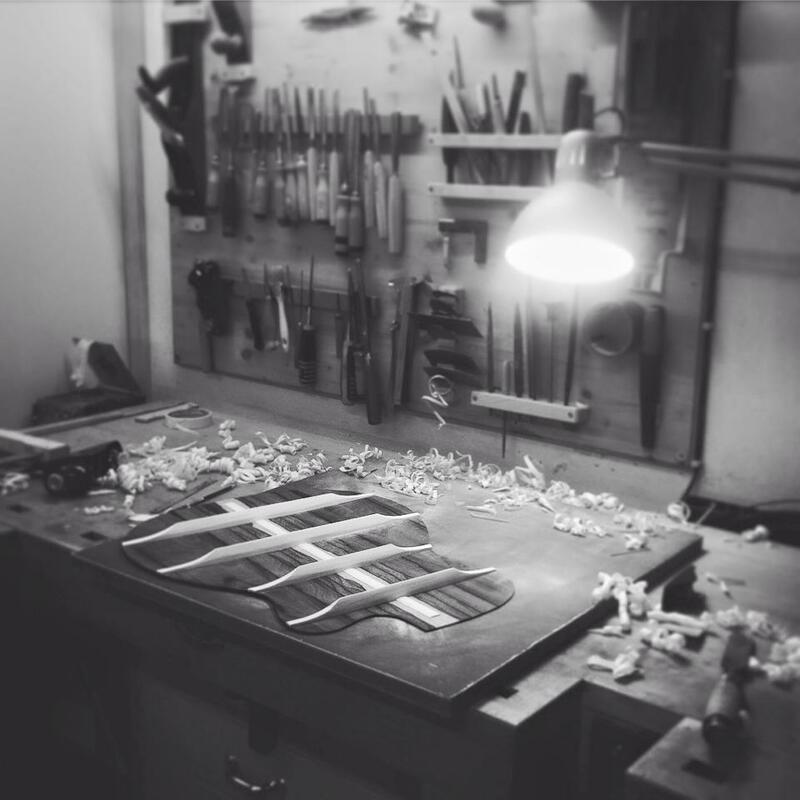 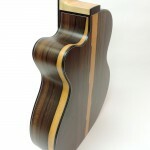 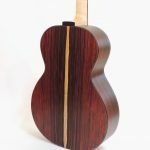 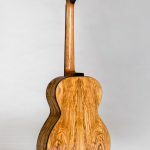 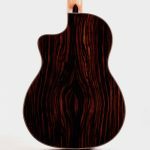 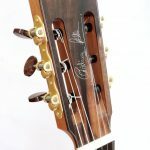 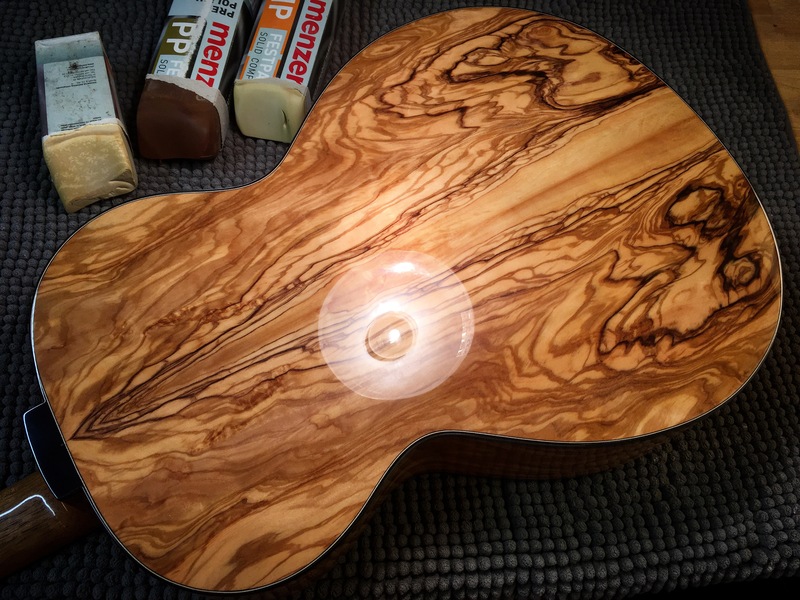 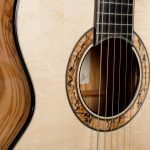 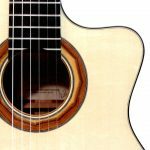 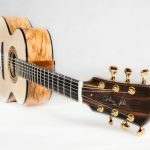 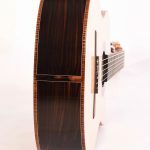 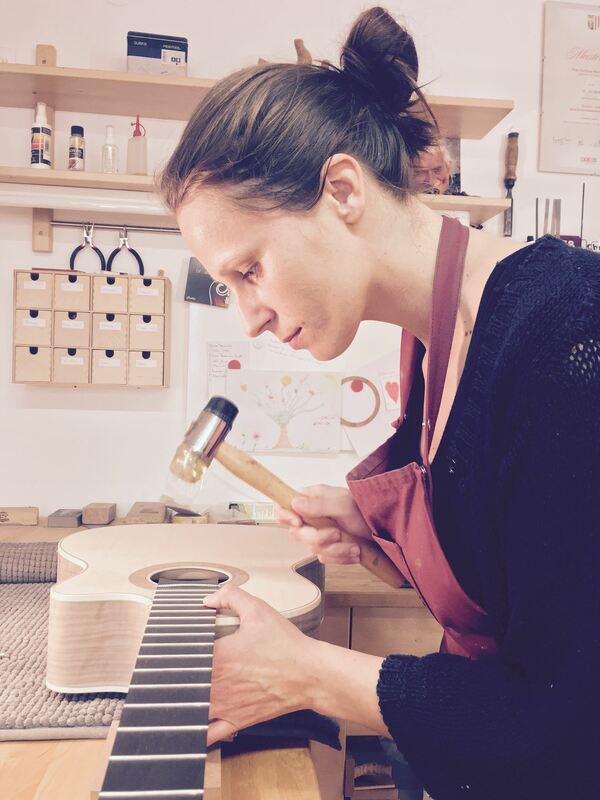 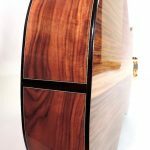 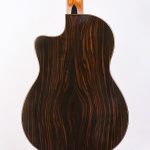 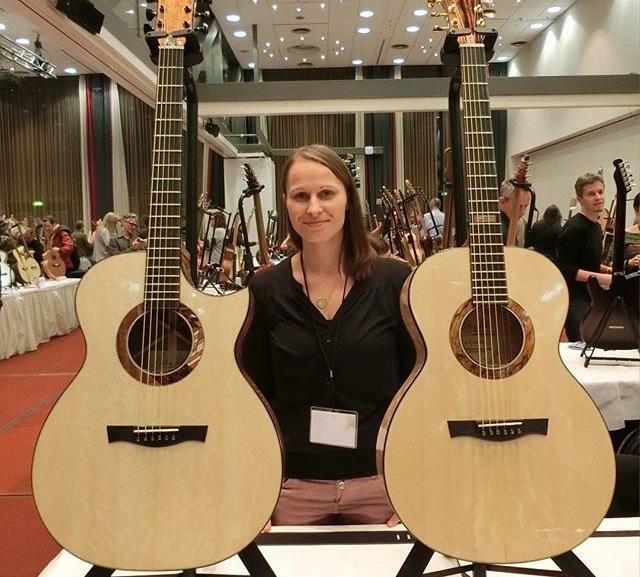 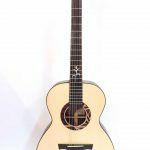 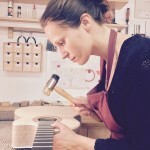 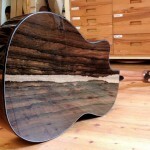 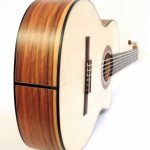 Every guitar is unique and made one by one here in my workshop in Austria. 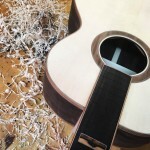 It is a collaboration between the customer and myself from the beginning to the delivery of the guitar once it is finished. 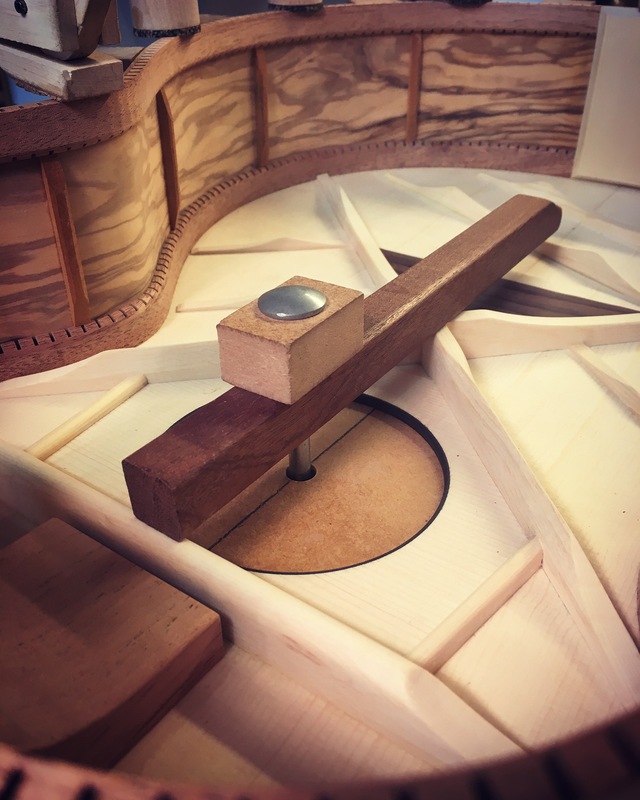 Optical and aesthetic details, in addition to diverse measurements and settings, are fashioned according to the customer’s individual preferences. 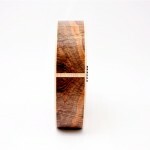 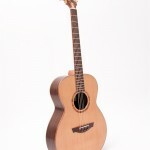 You are very welcome to meet me in my shop, but I can also correspond by phone or email. 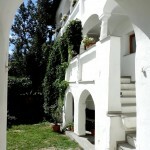 To secure your place on the waitlist, I ask for a €500 ($500) deposit. 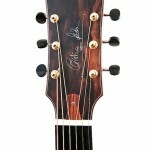 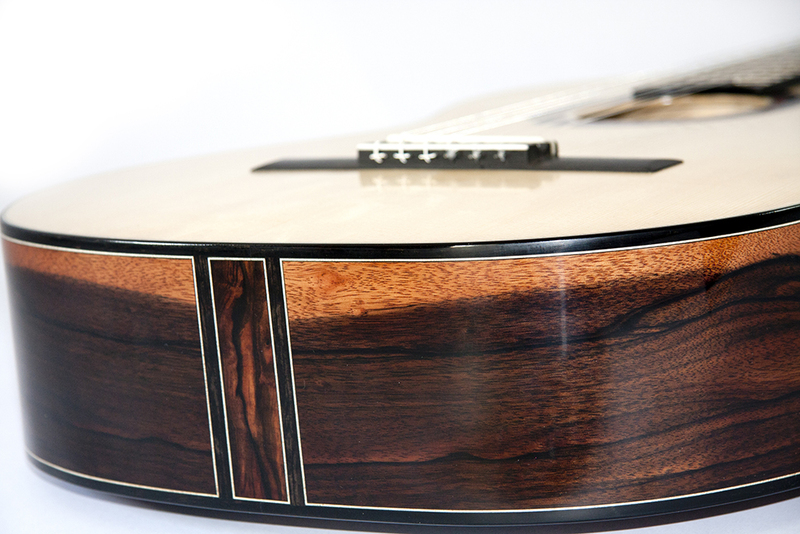 Please note that this deposit is to cover initial expenses such as materials for your guitar and is non-refundable. 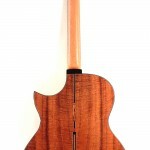 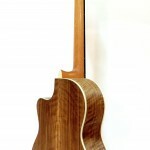 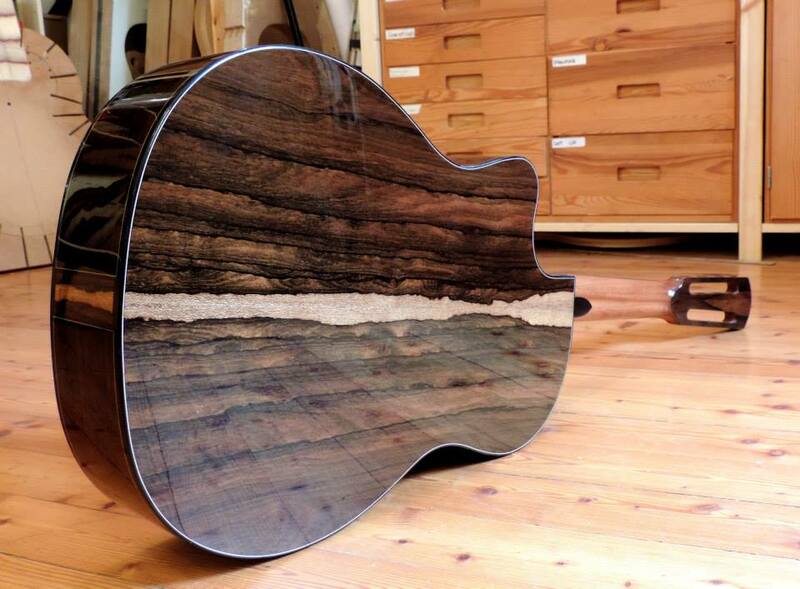 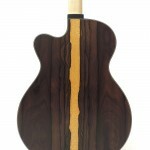 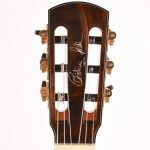 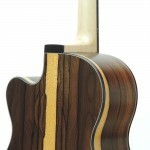 The remaining balance is due before delivery of the guitar. 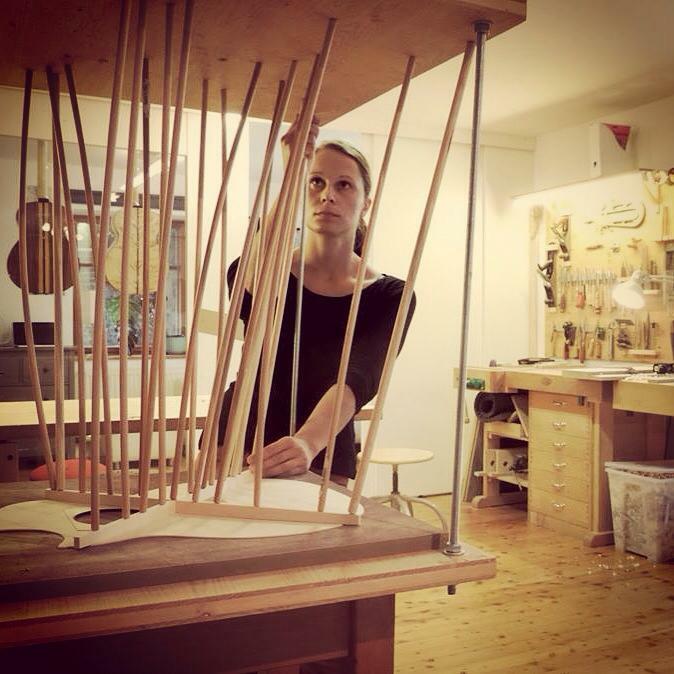 My workshop’s relative humidity is between 40-45% during the building process. 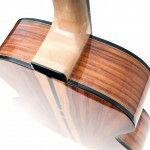 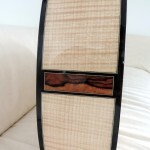 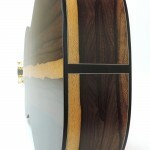 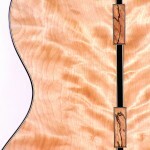 It is of great importance that the humidity is controlled even after the guitar is delivered. 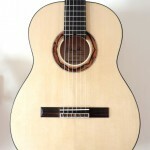 All models start at a base price of € 4.500. Basically I build custom guitars to order but from time to time I have a small stock of guitars which are available immediately. 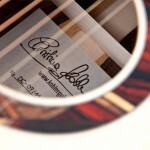 Please don’t hesitate to contact me if you have any questions or inquiries. 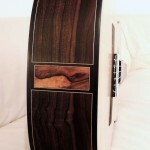 Unfortunately due to personal circumstances of one of my clients, this guitar is looking for a new home. 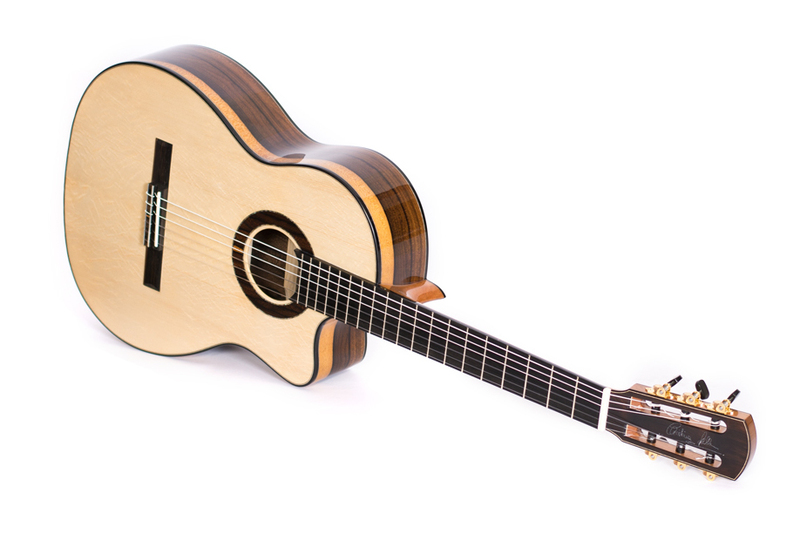 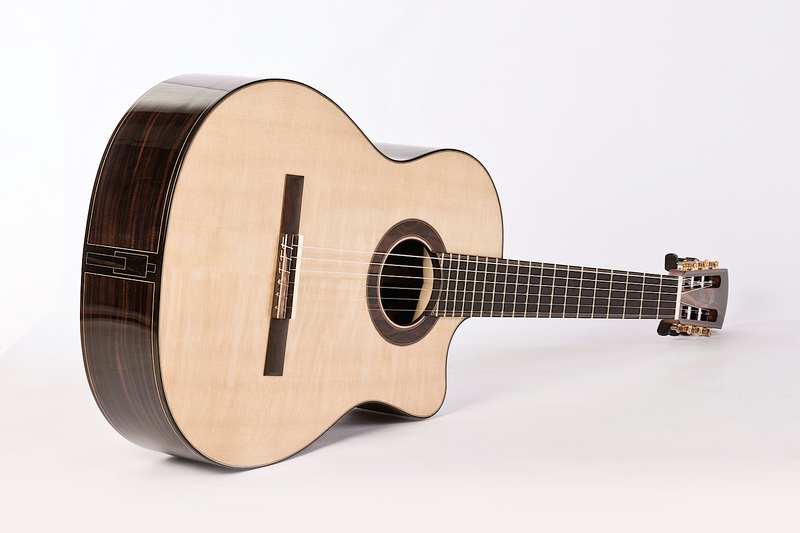 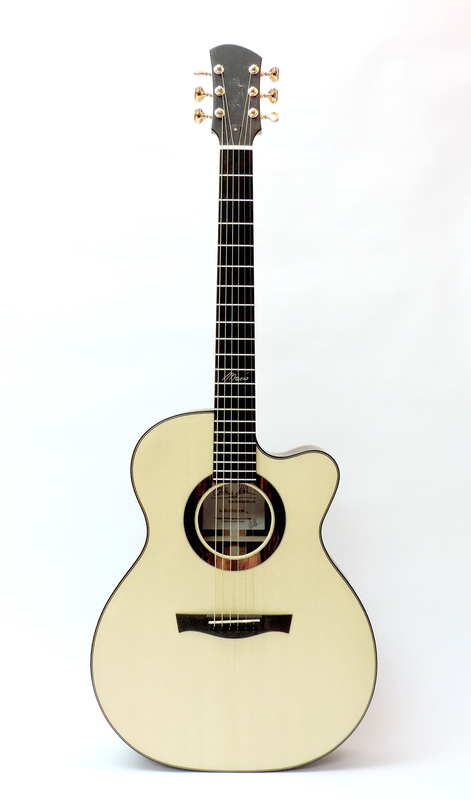 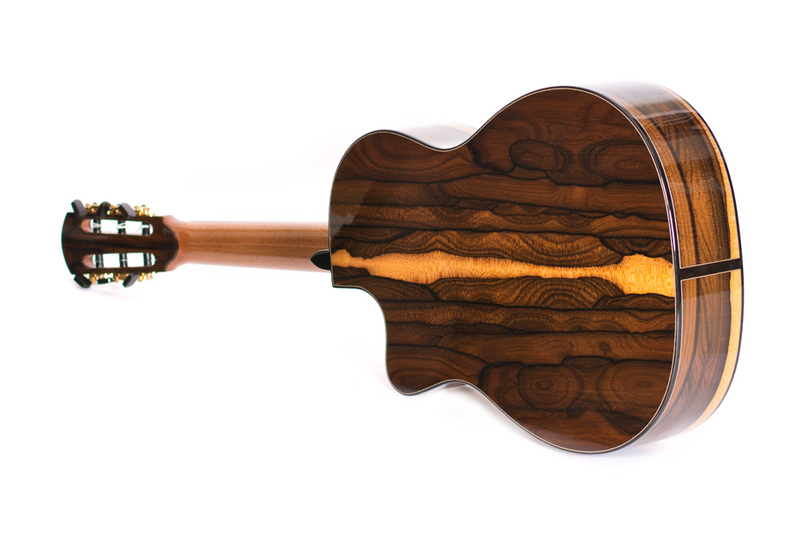 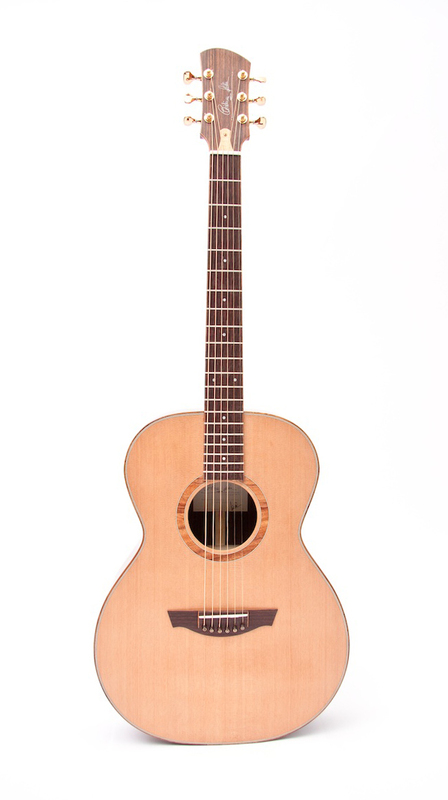 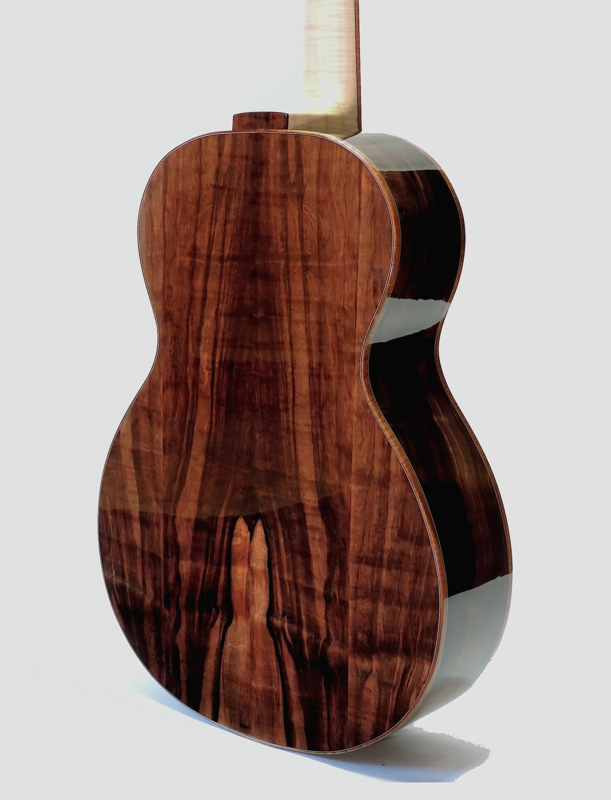 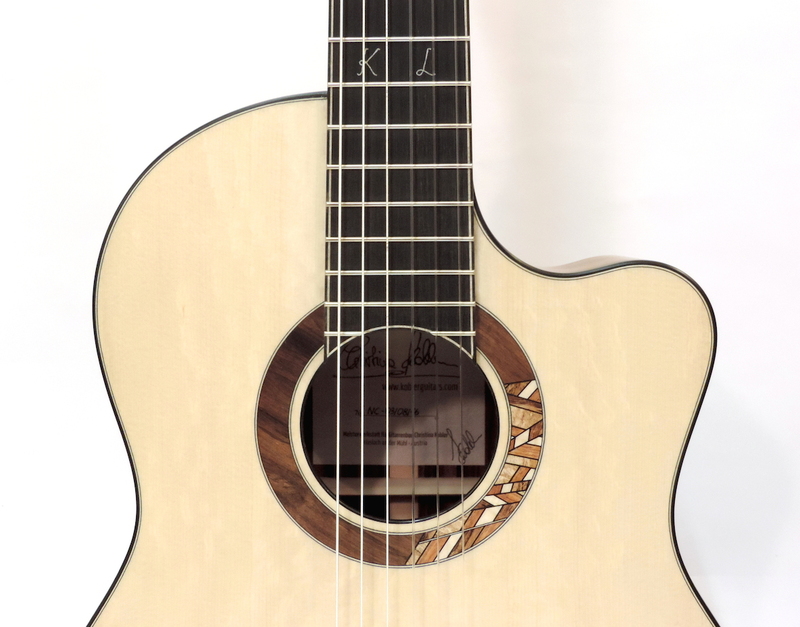 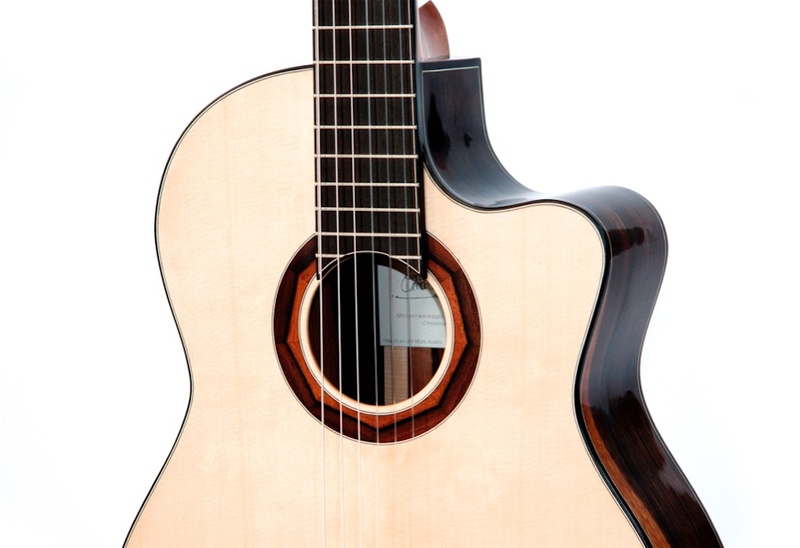 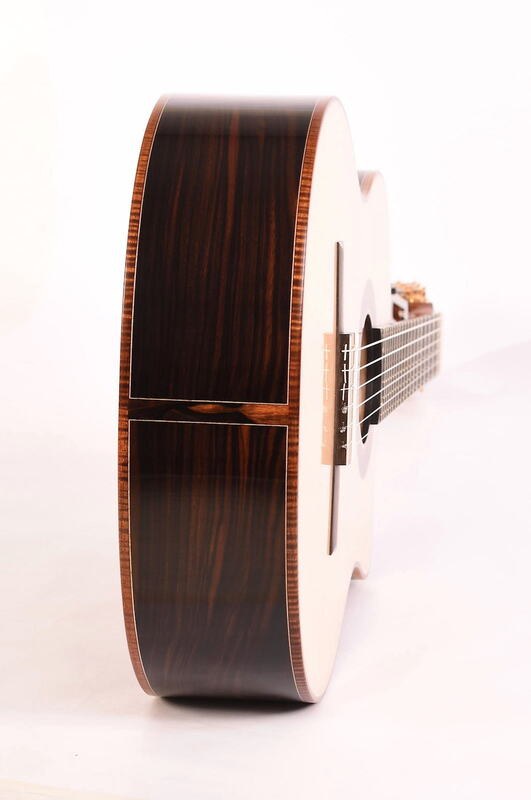 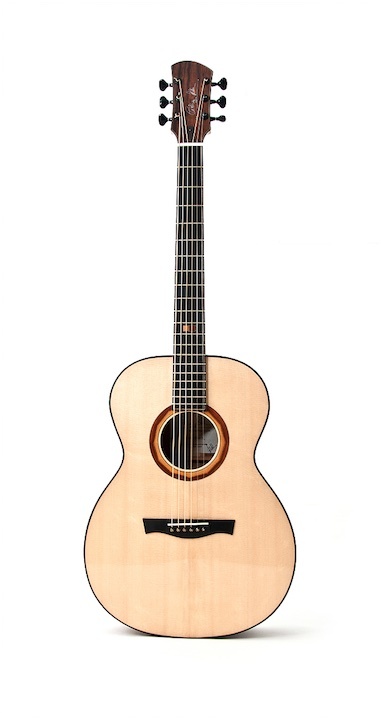 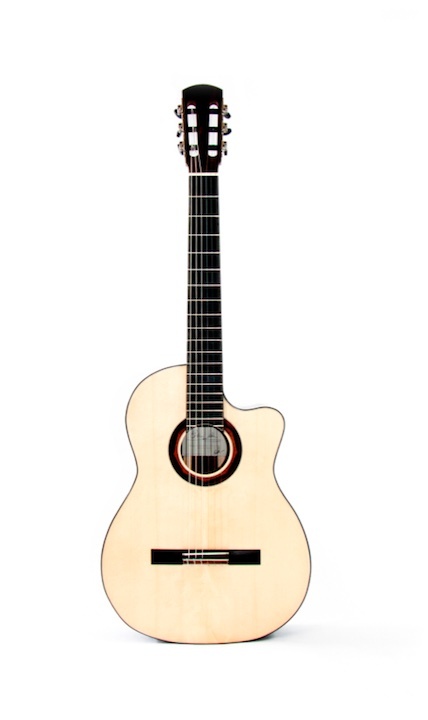 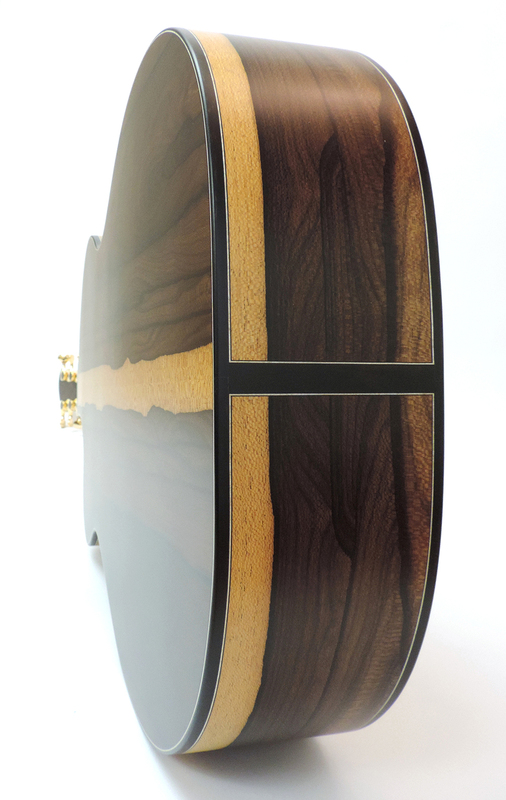 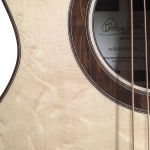 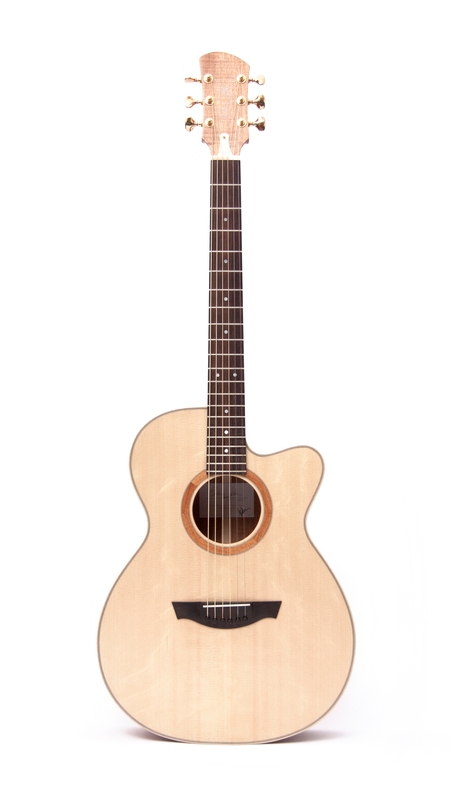 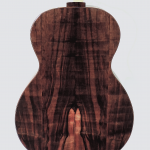 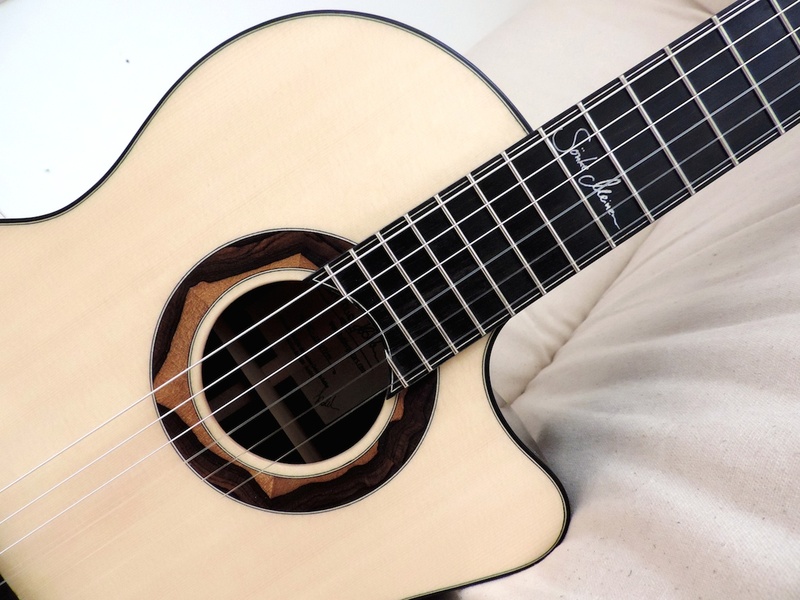 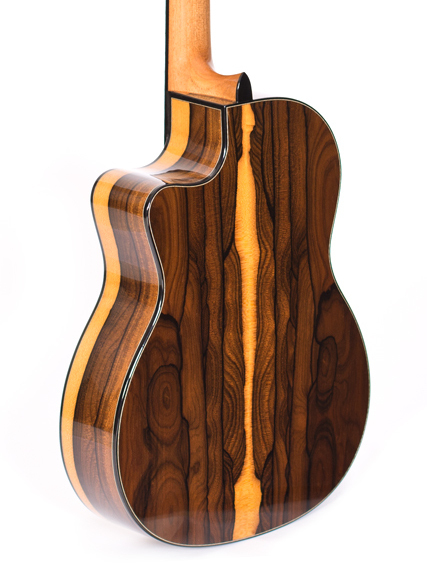 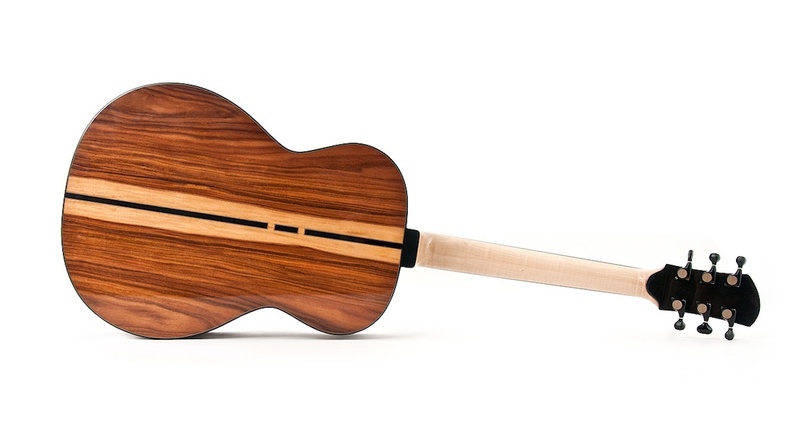 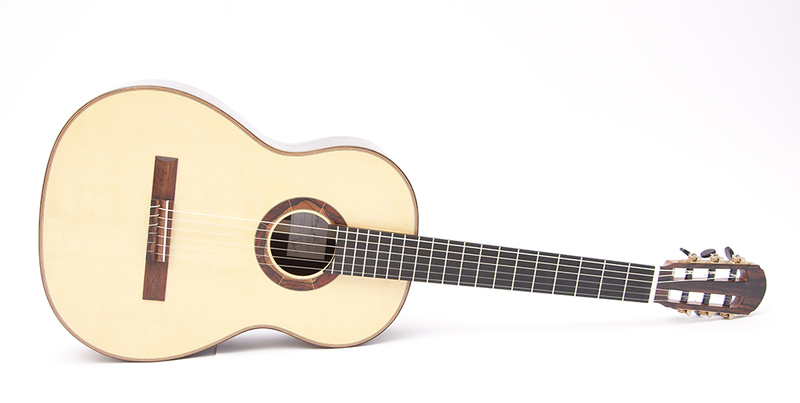 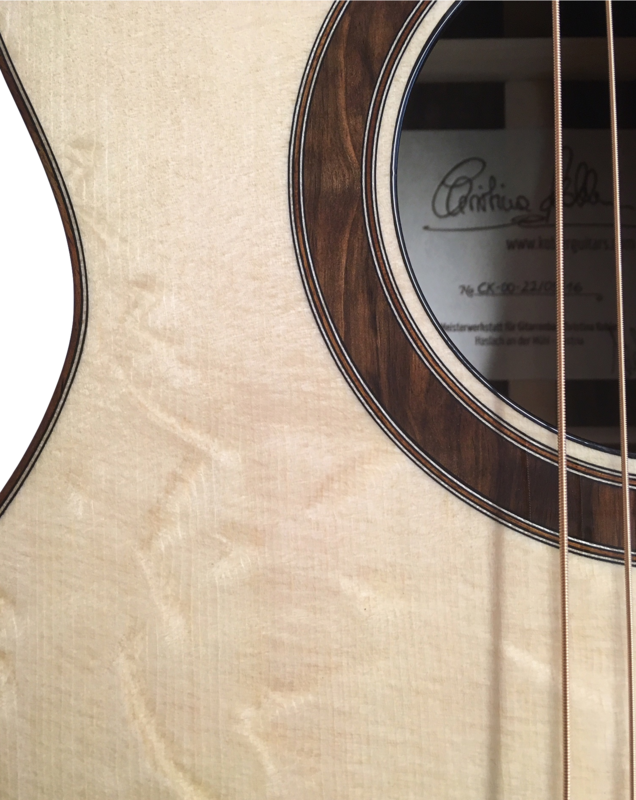 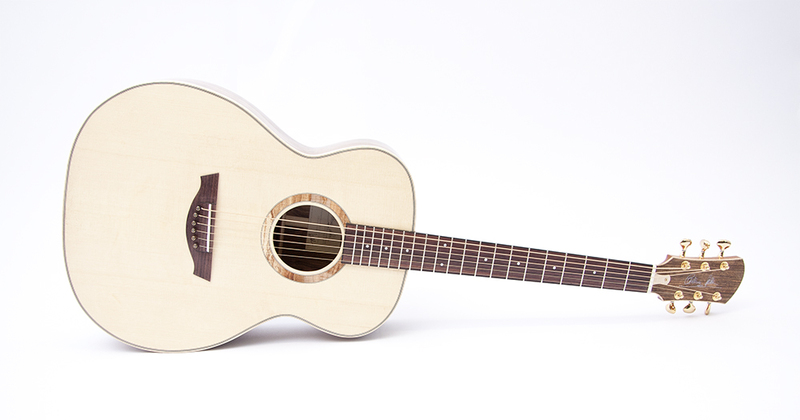 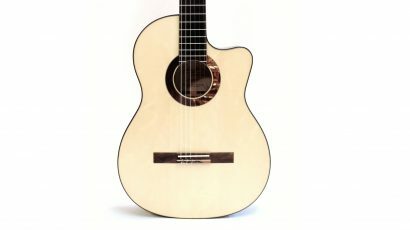 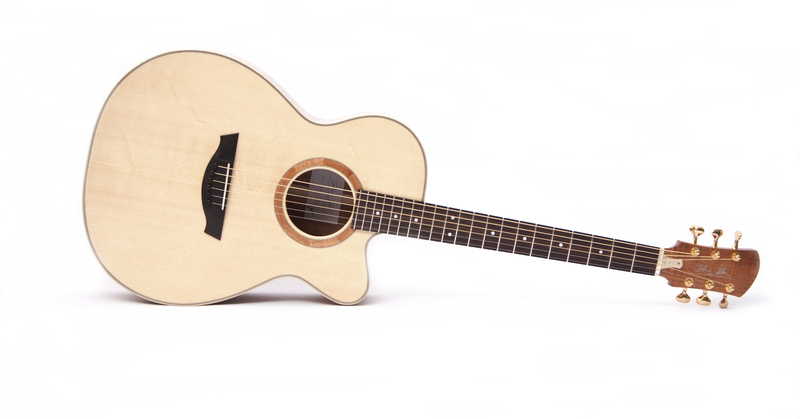 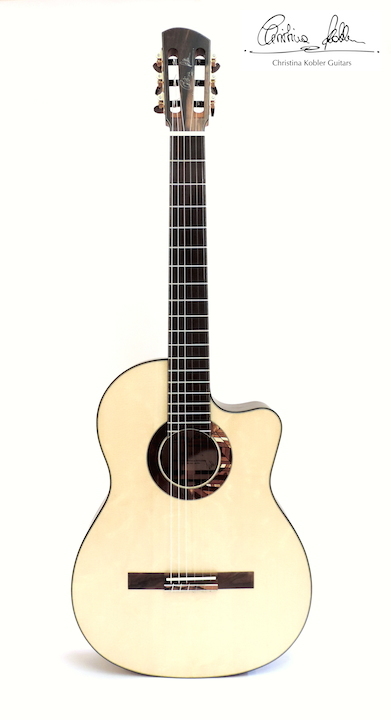 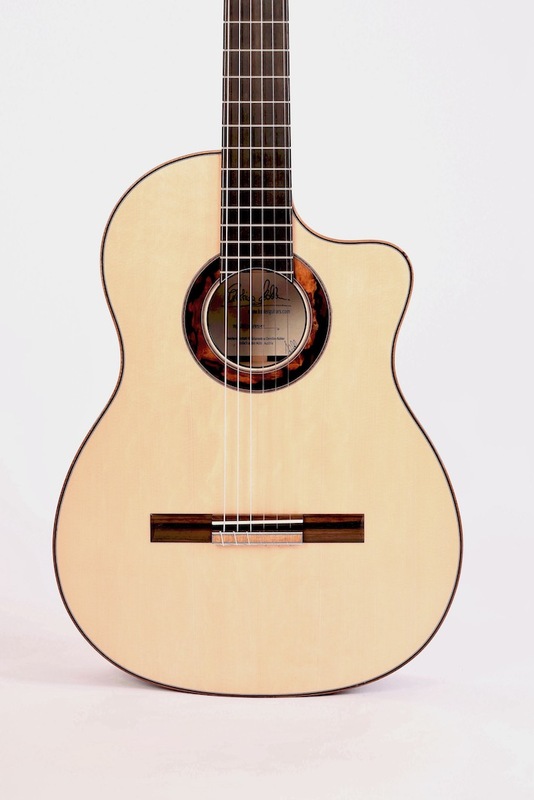 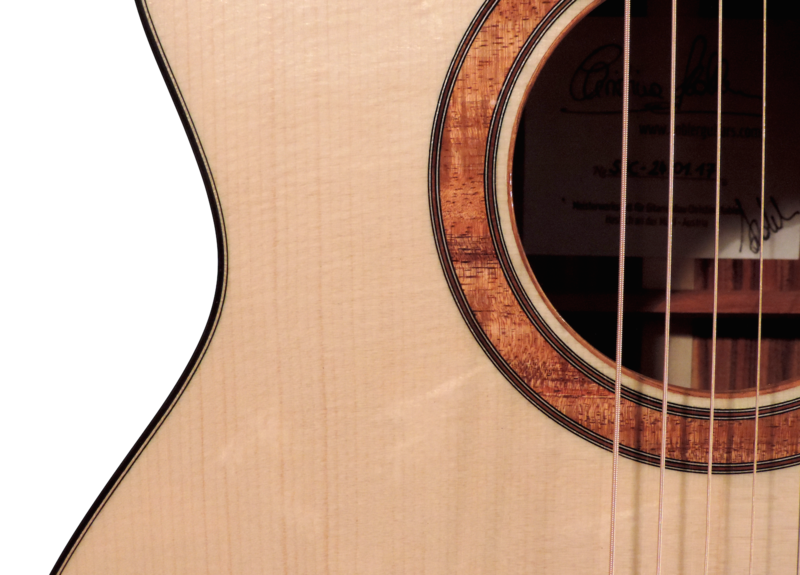 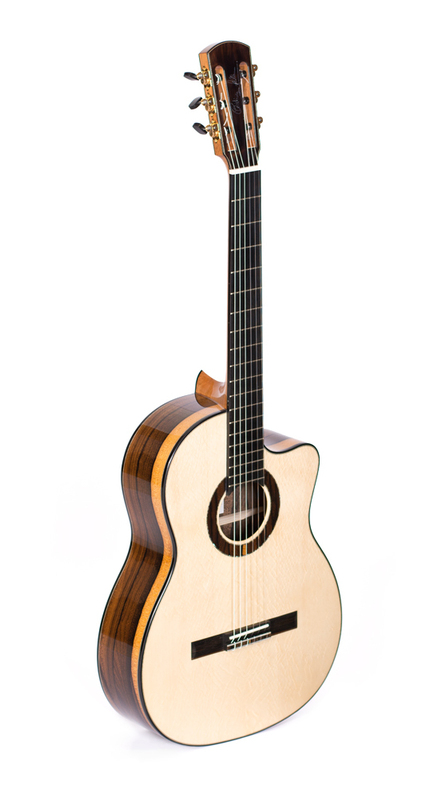 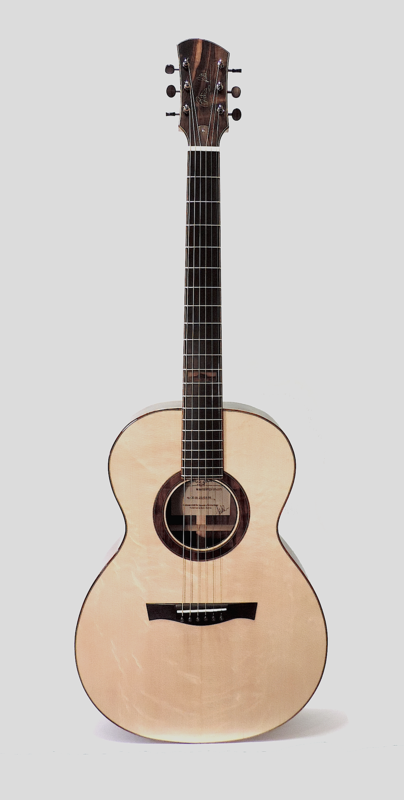 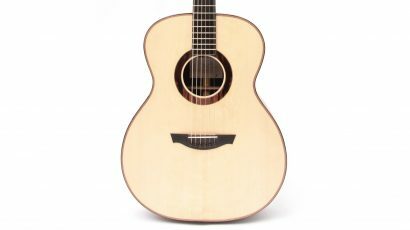 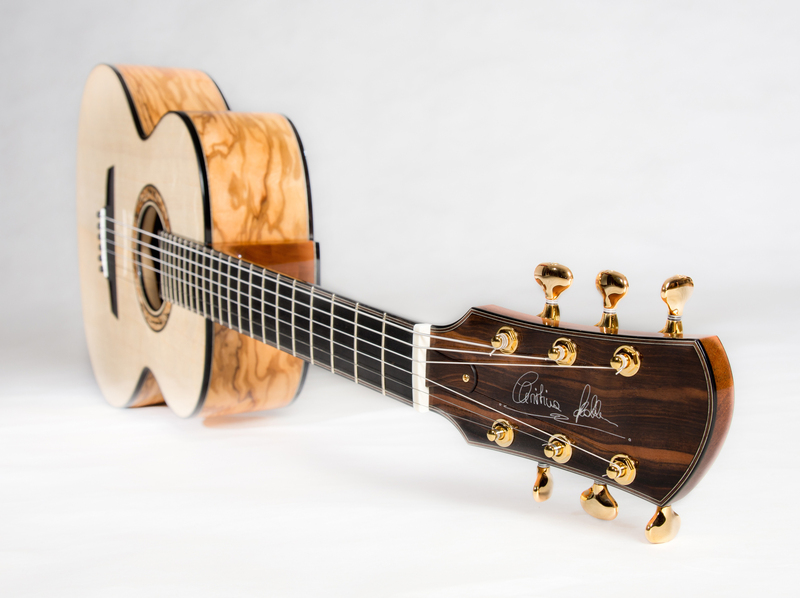 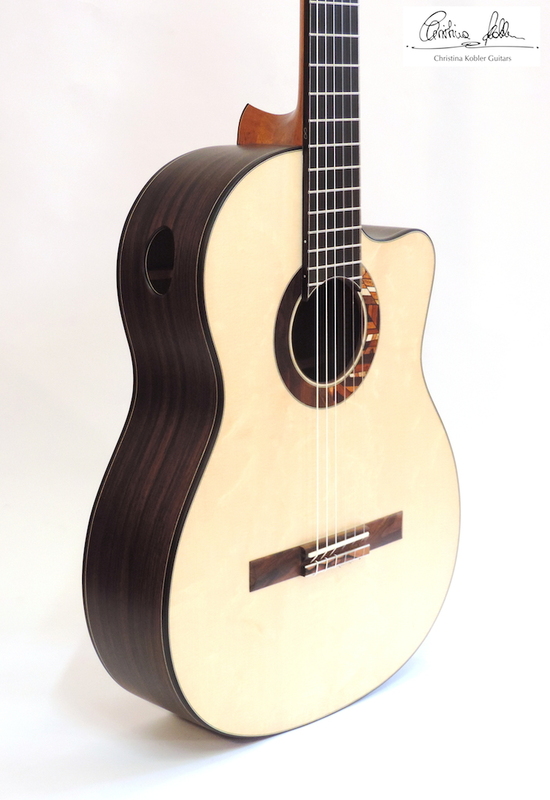 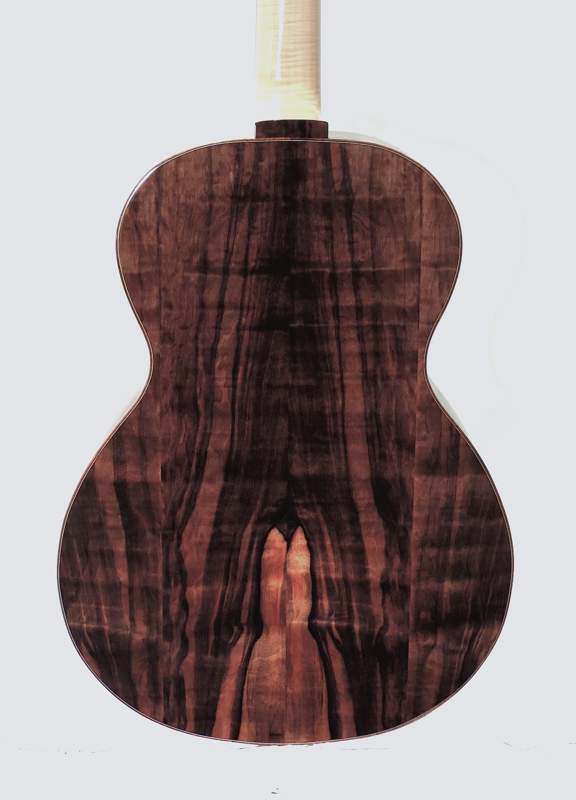 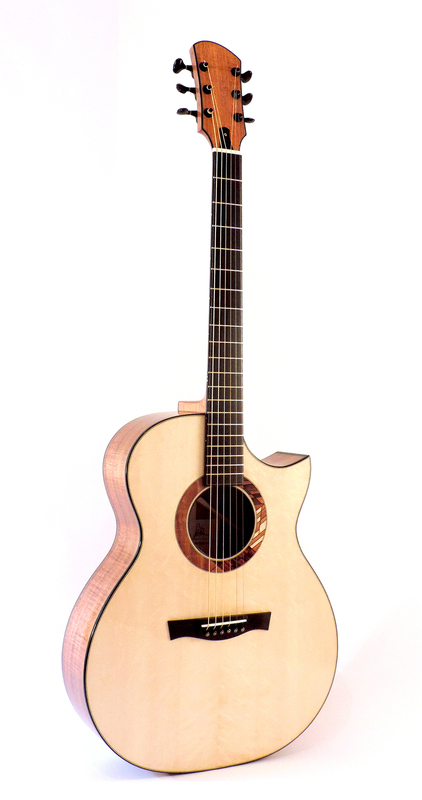 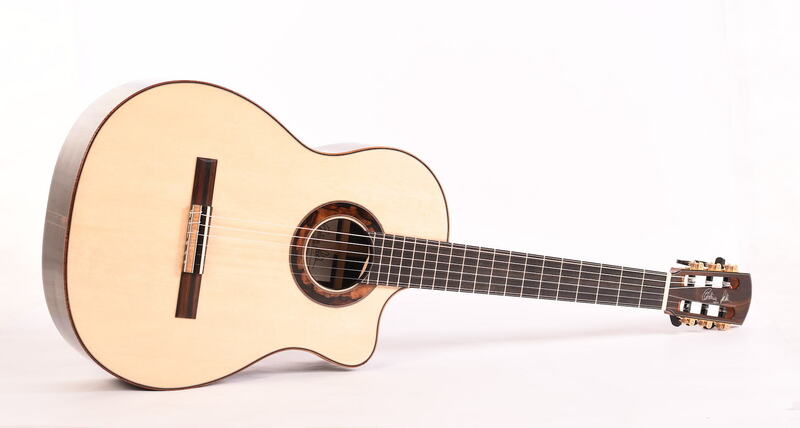 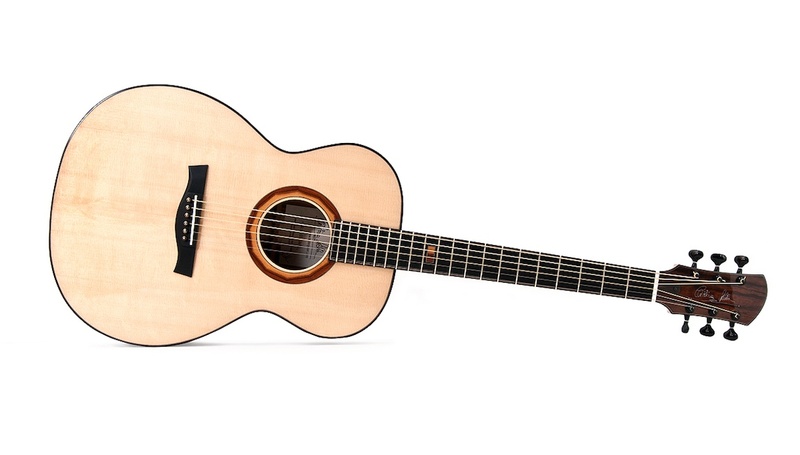 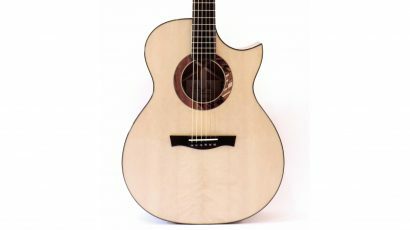 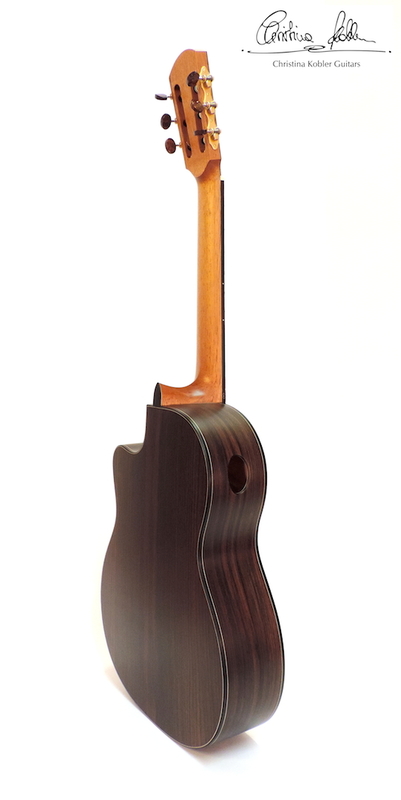 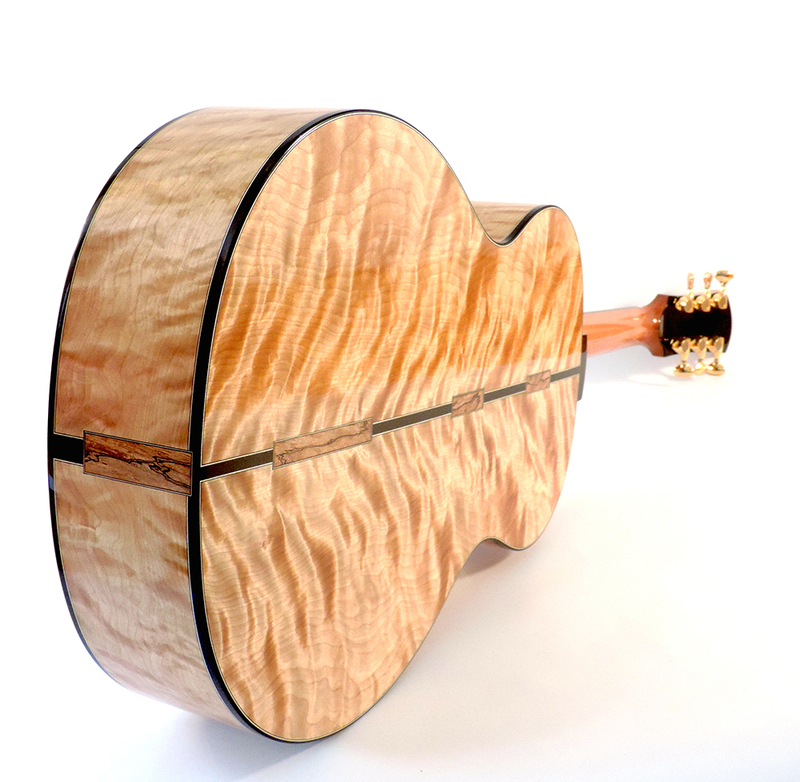 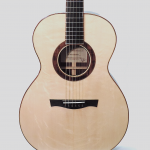 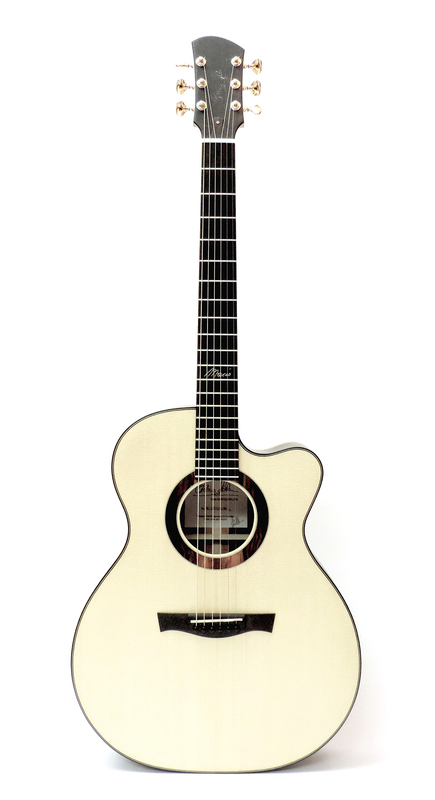 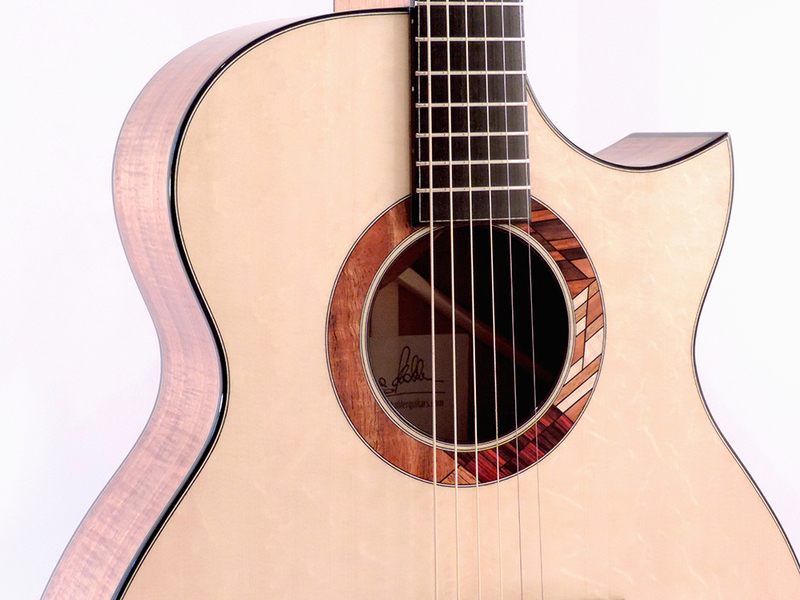 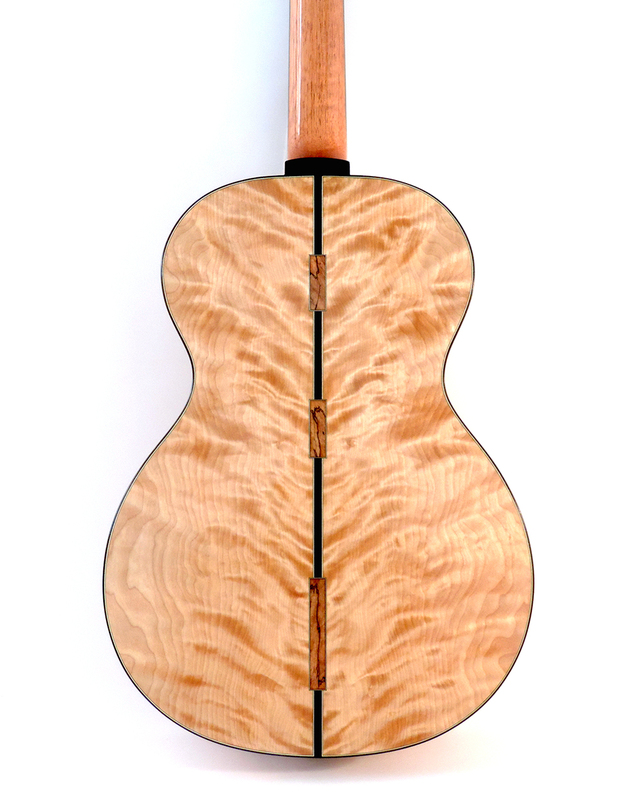 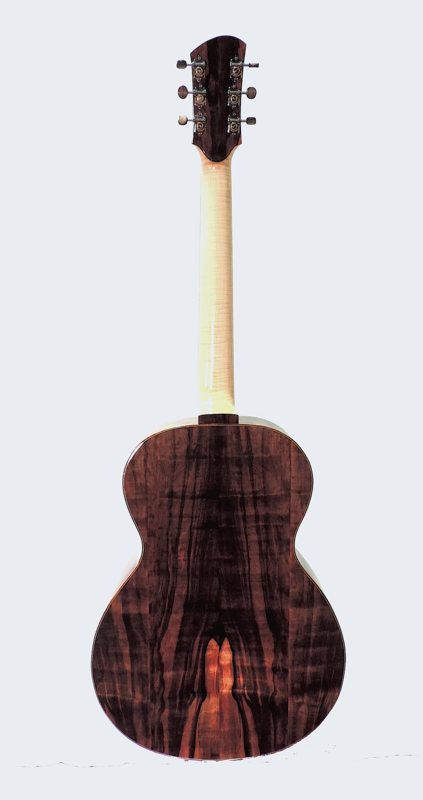 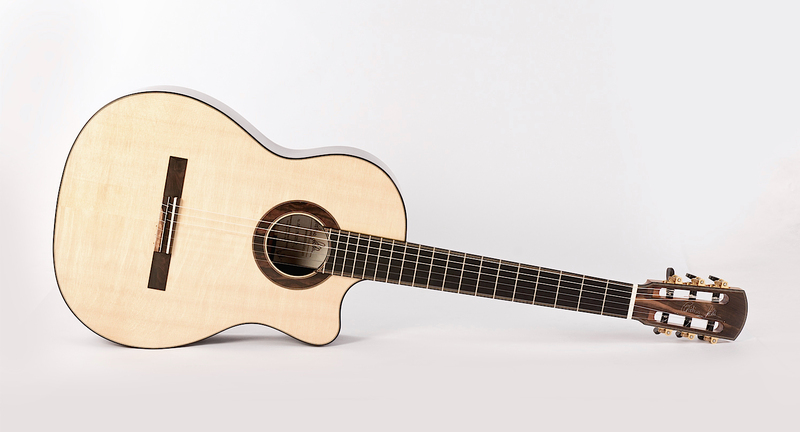 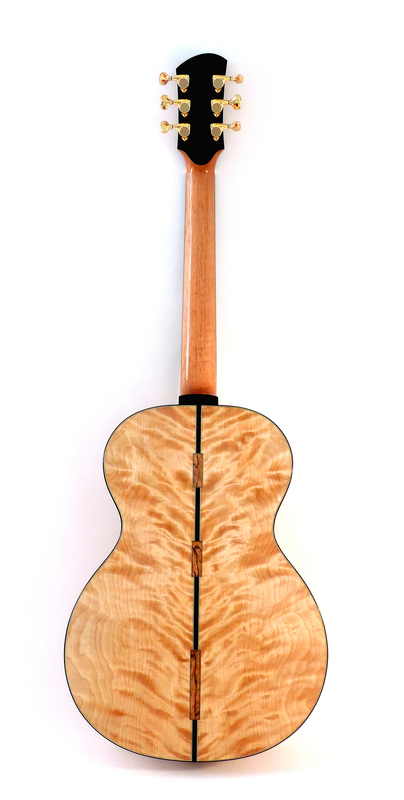 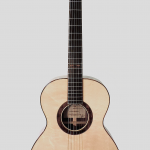 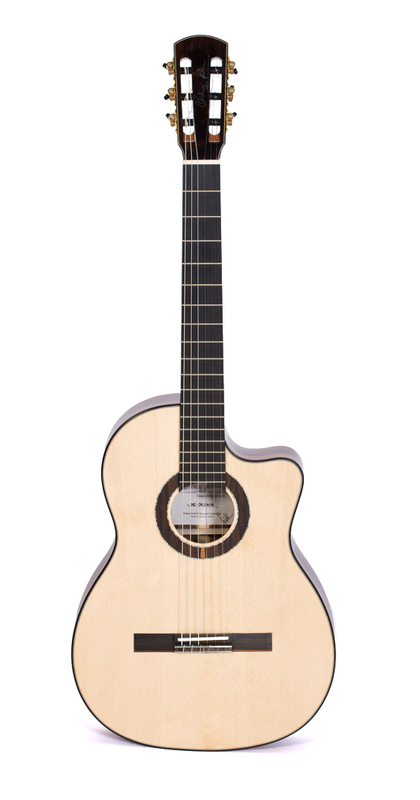 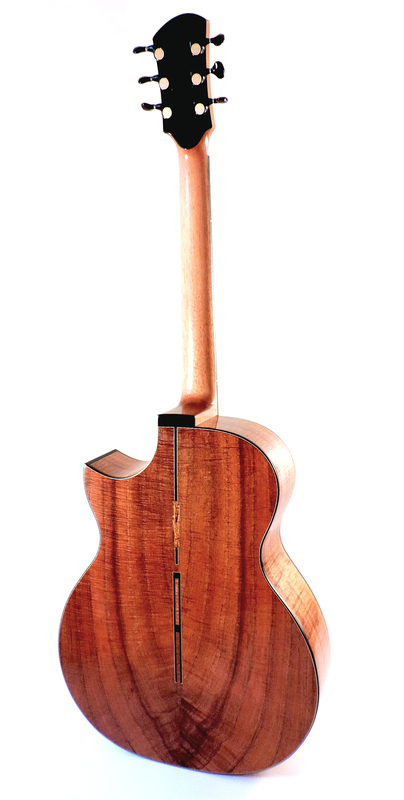 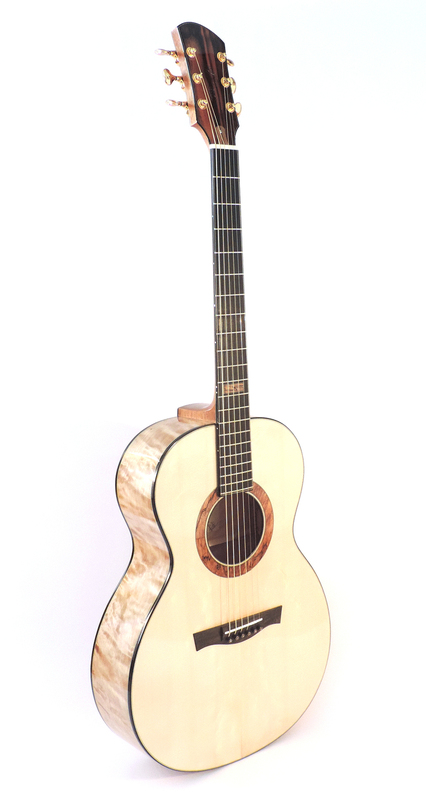 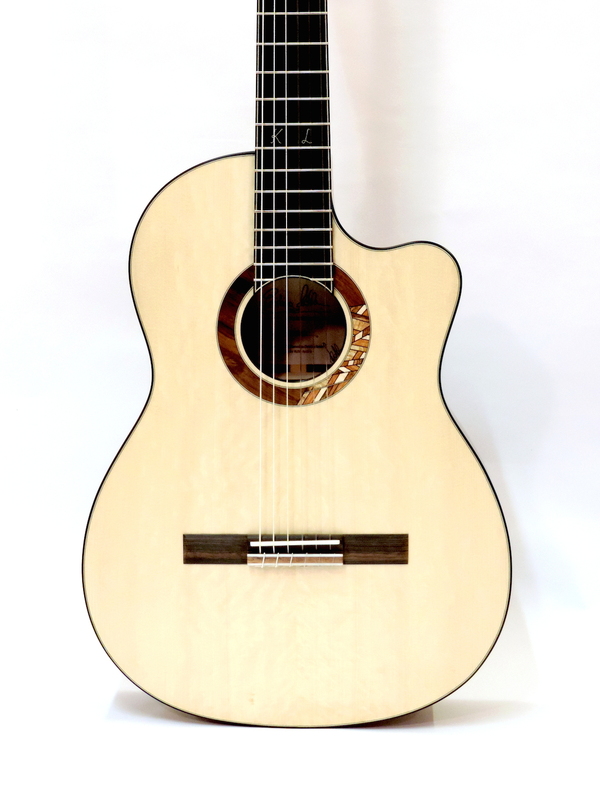 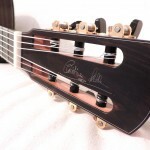 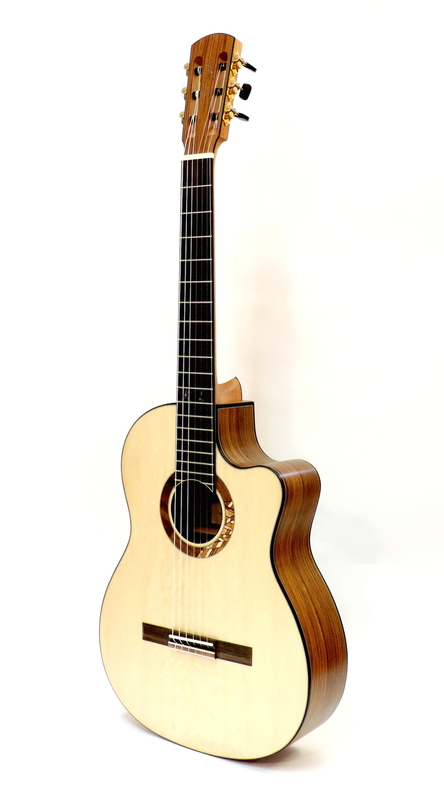 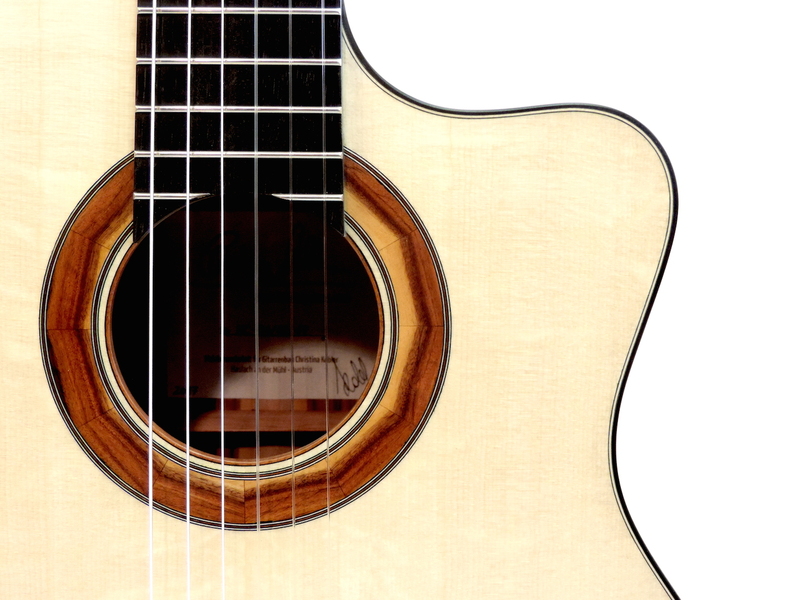 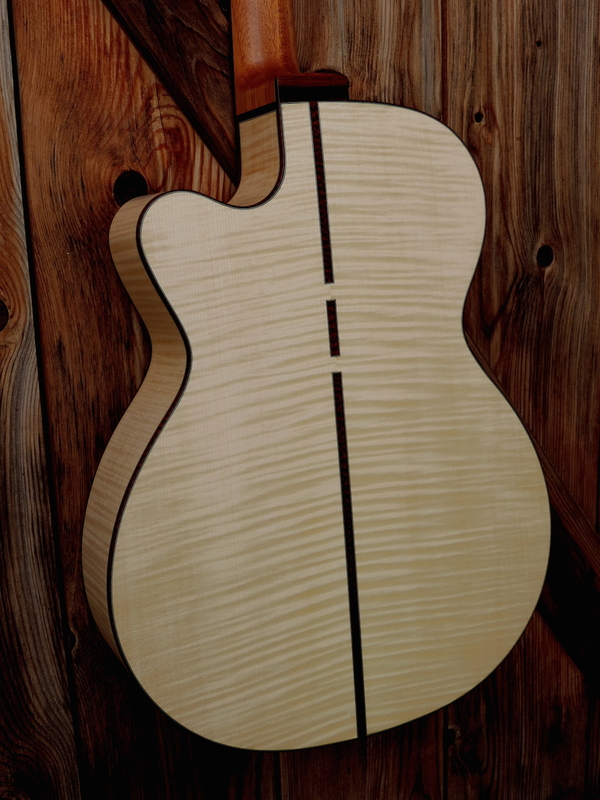 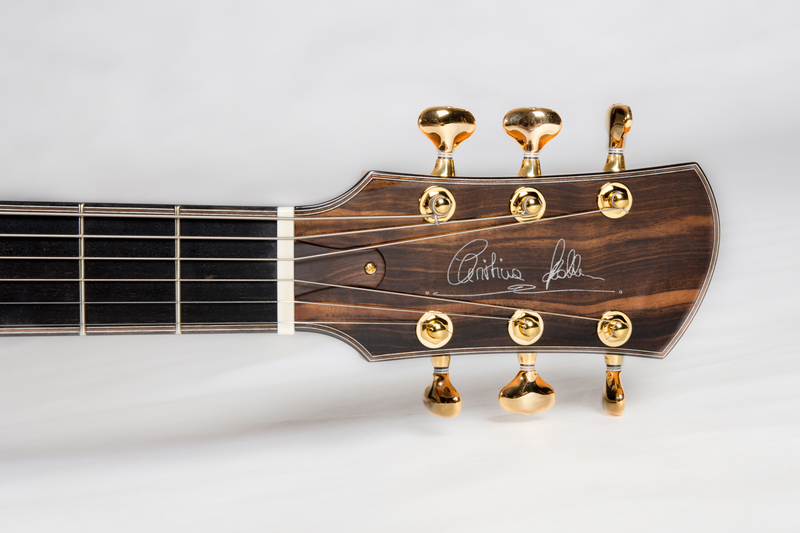 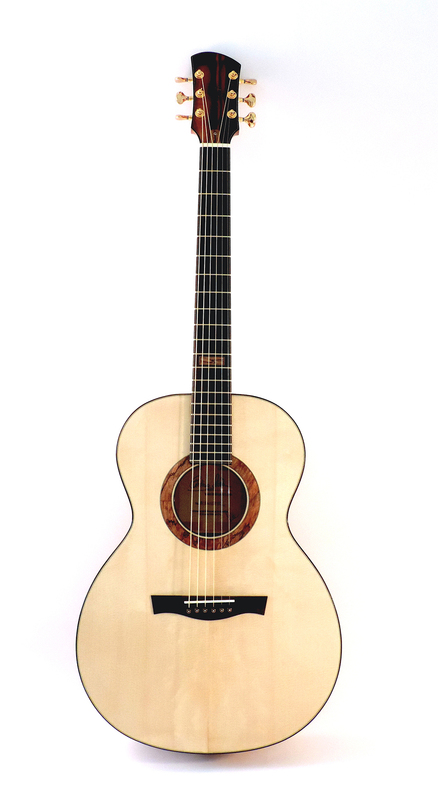 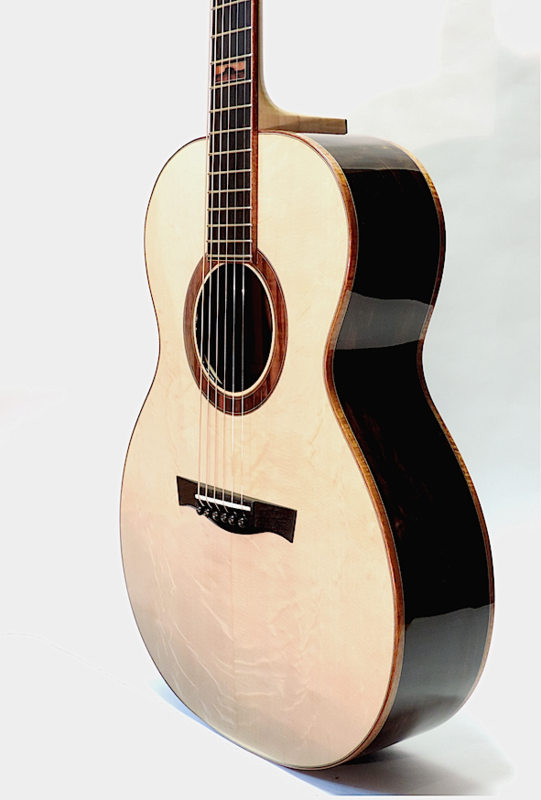 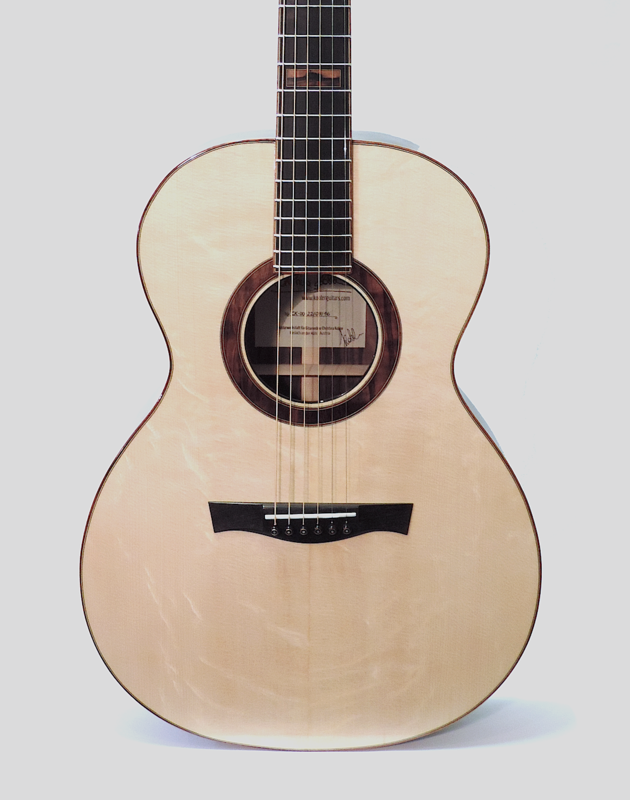 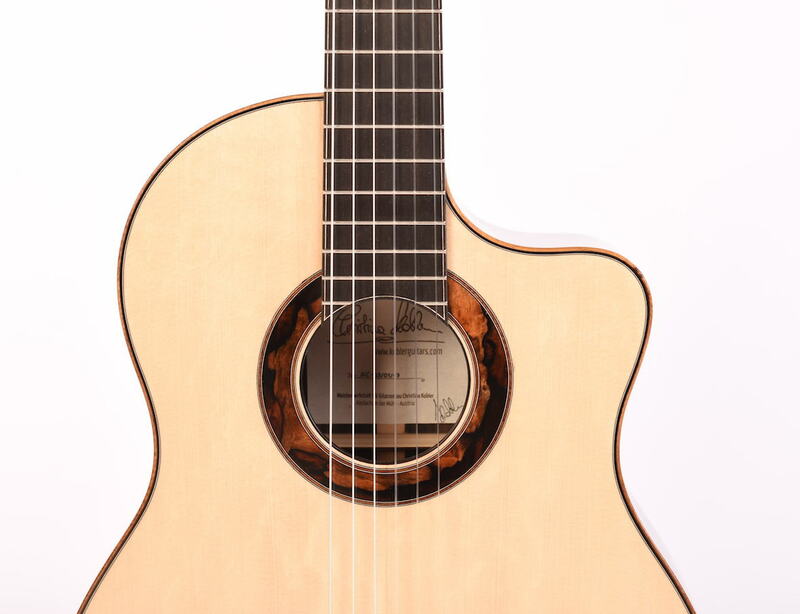 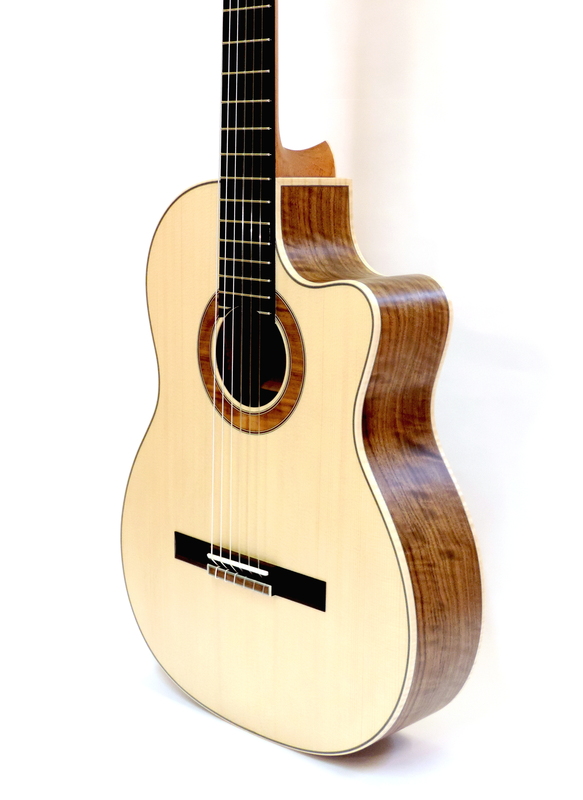 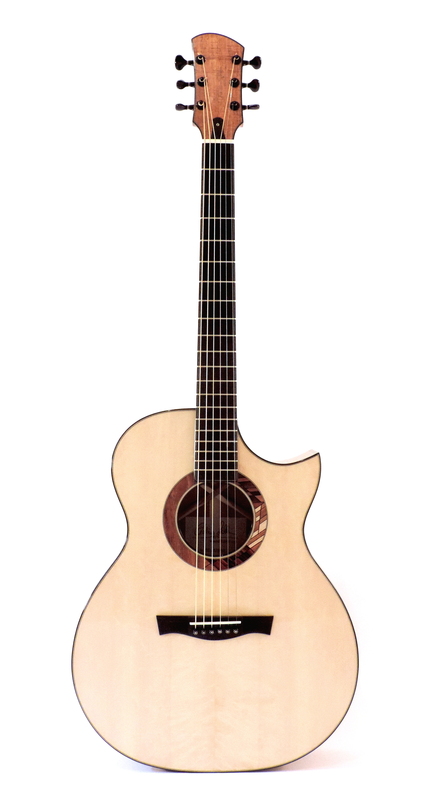 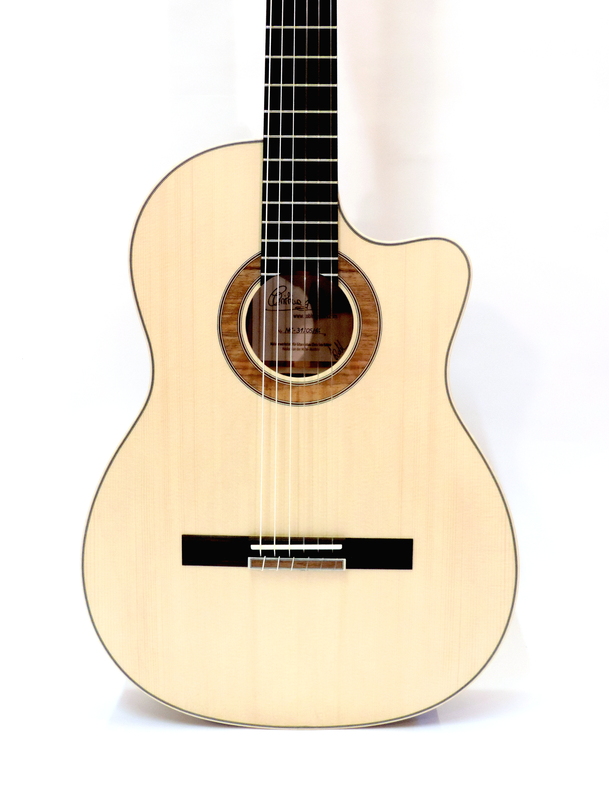 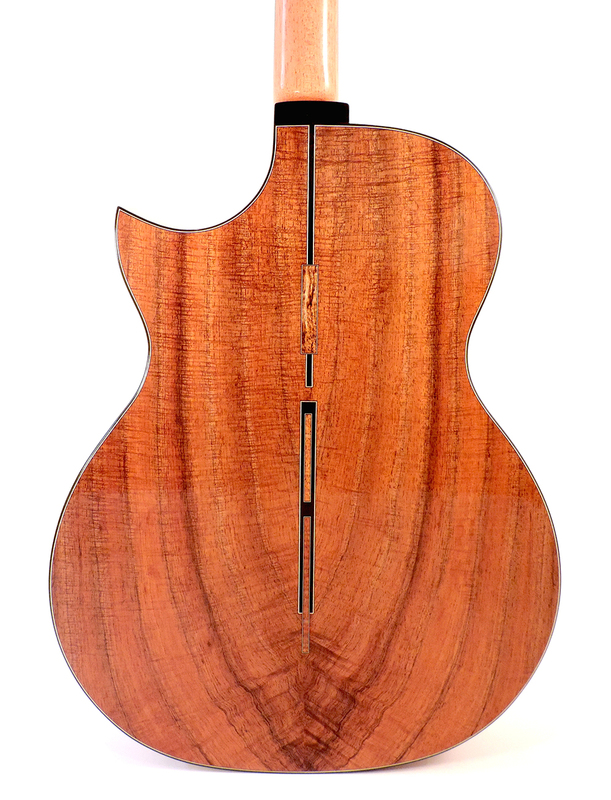 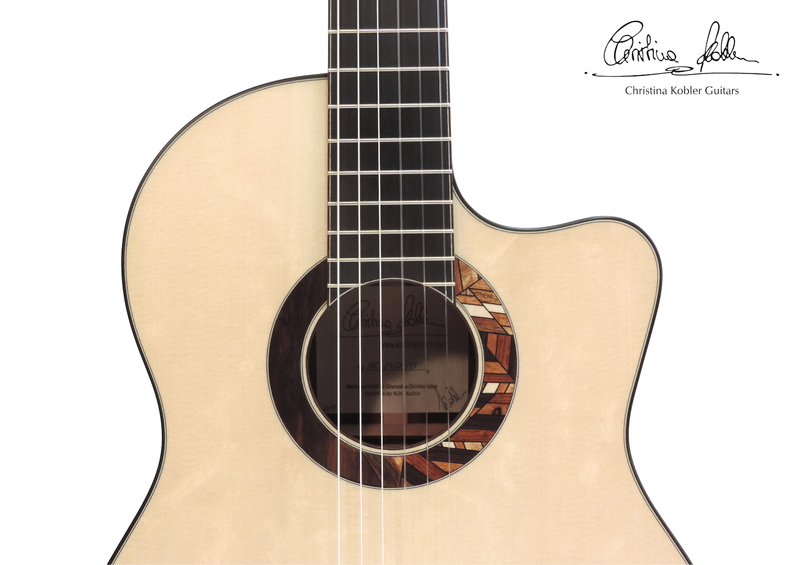 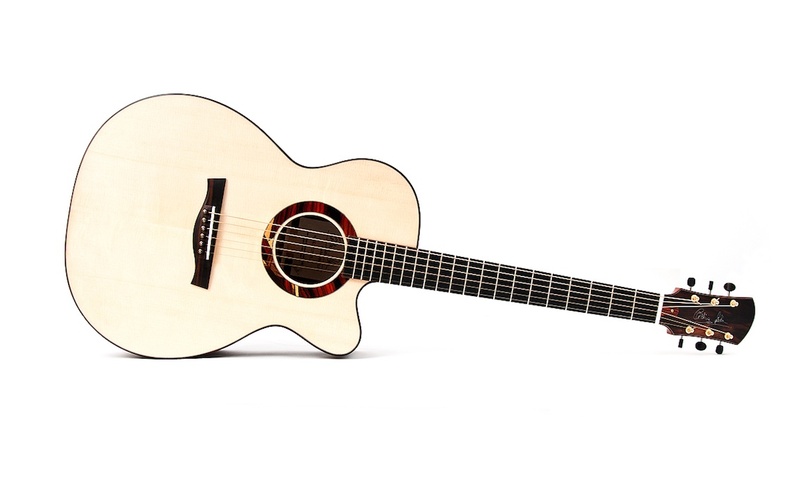 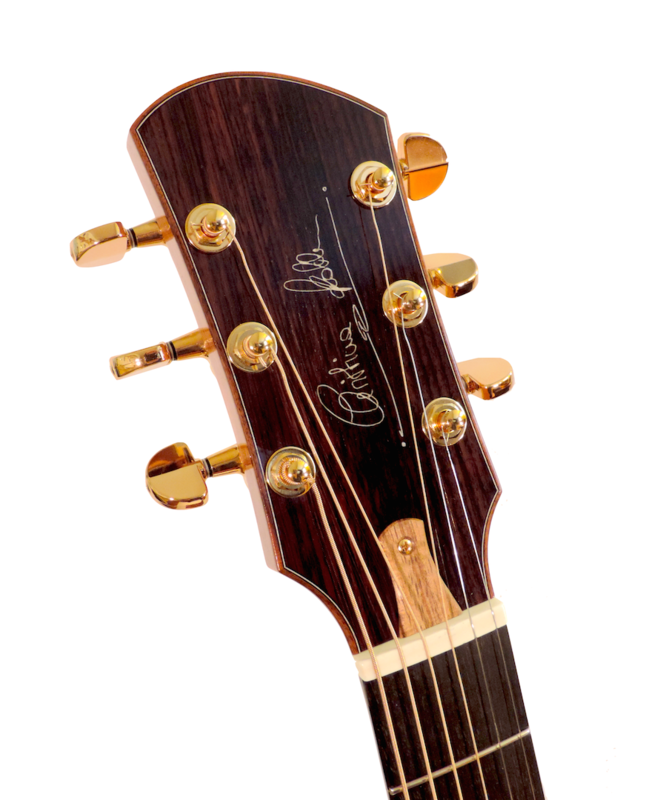 The CK-OMC is my interpretation of an OM-Model with a soft cutaway. 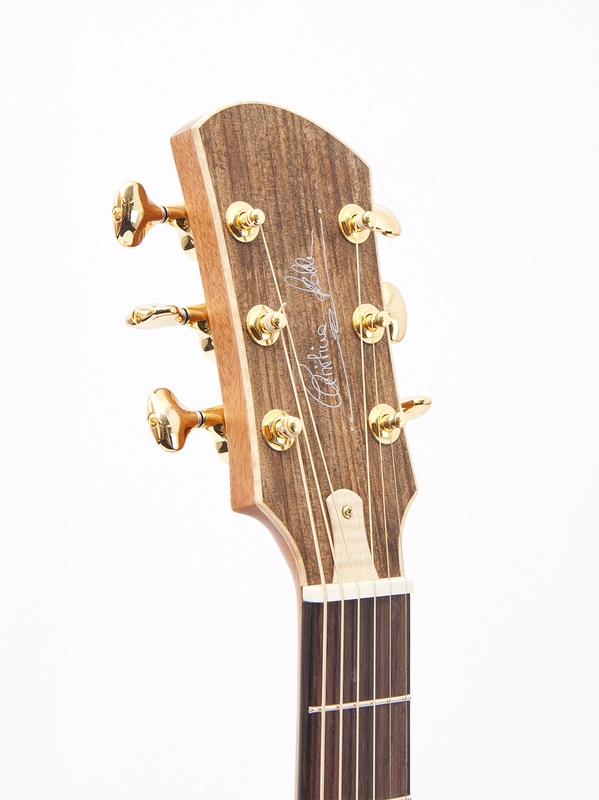 This model provides long sustainability and easy responsiveness and ensures a powerful bass and clear treble sound. 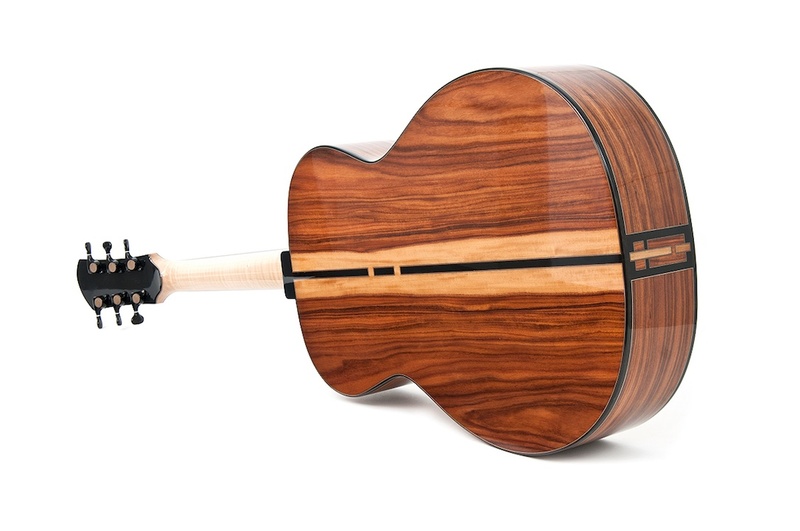 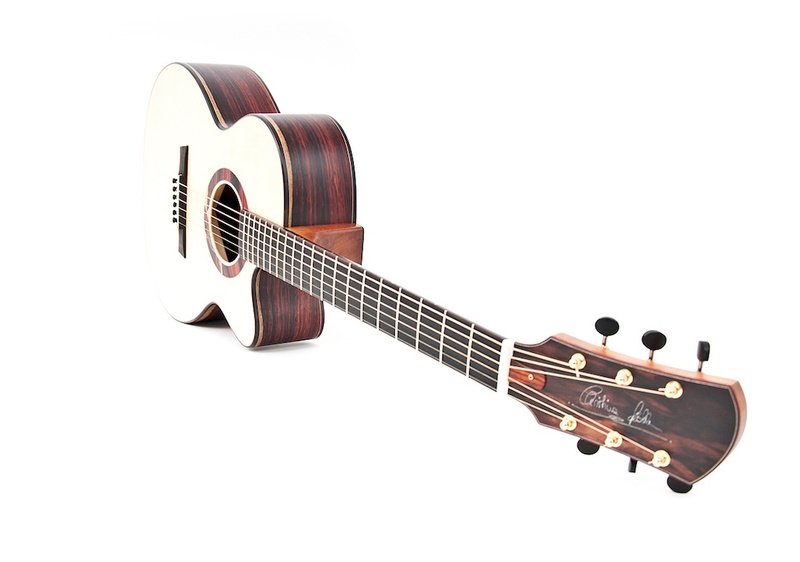 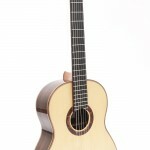 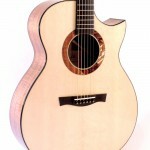 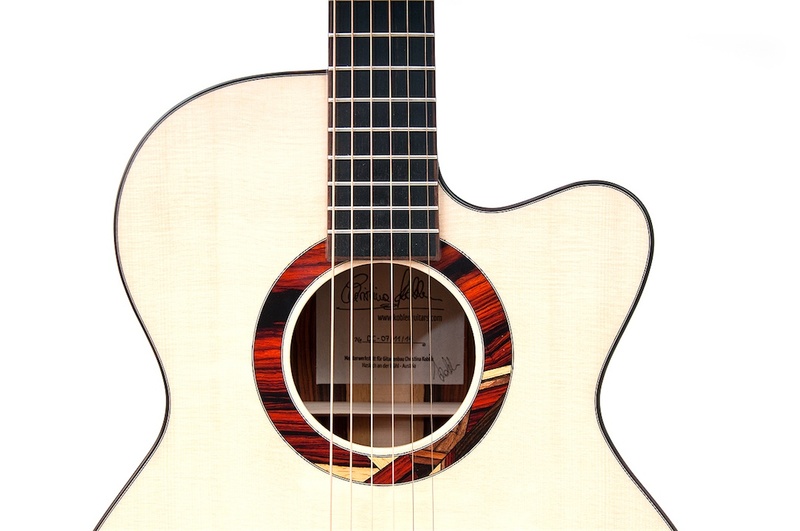 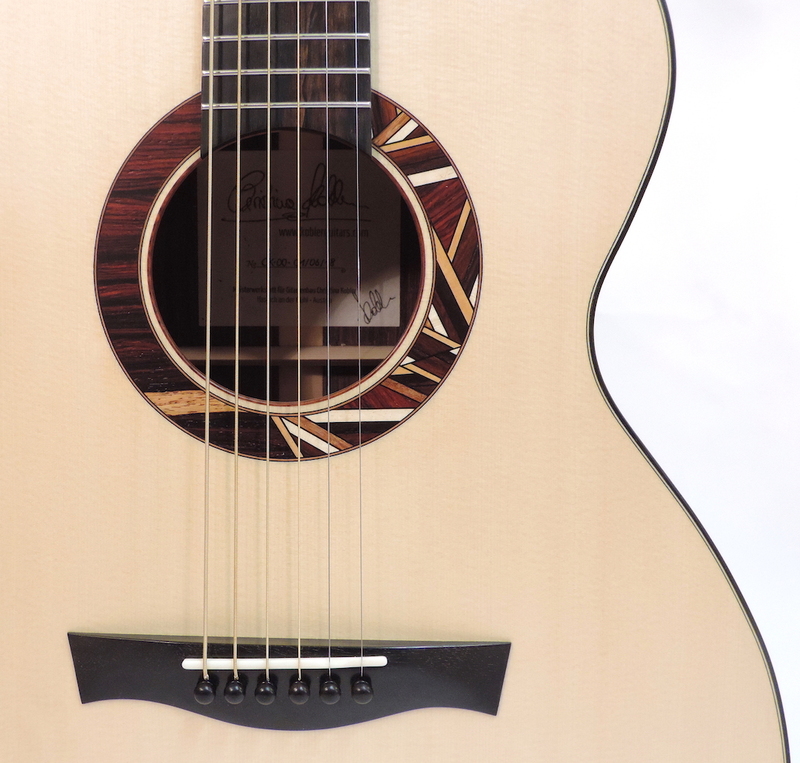 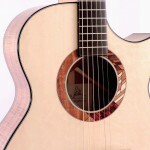 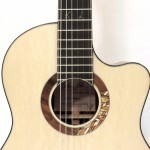 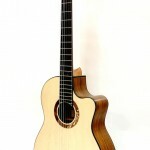 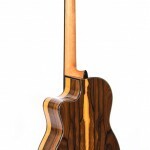 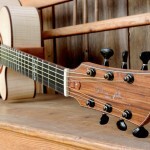 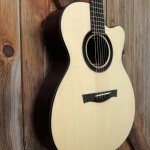 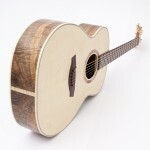 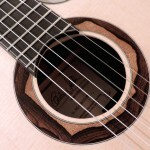 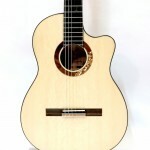 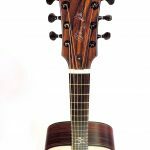 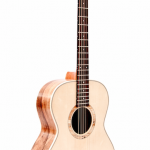 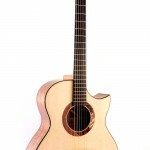 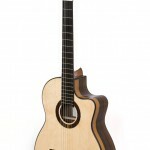 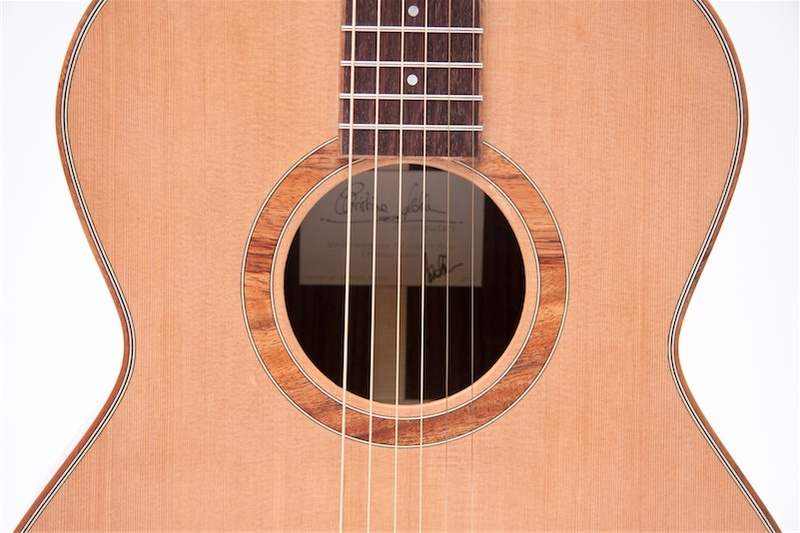 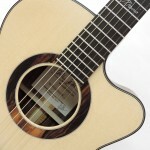 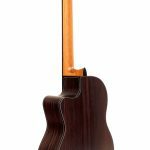 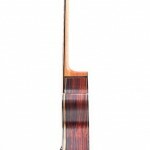 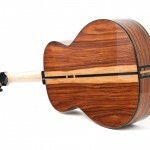 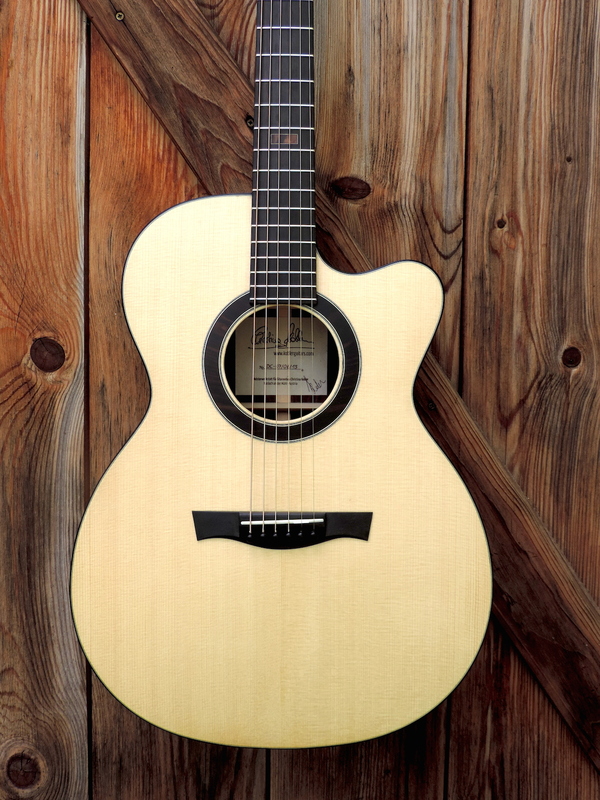 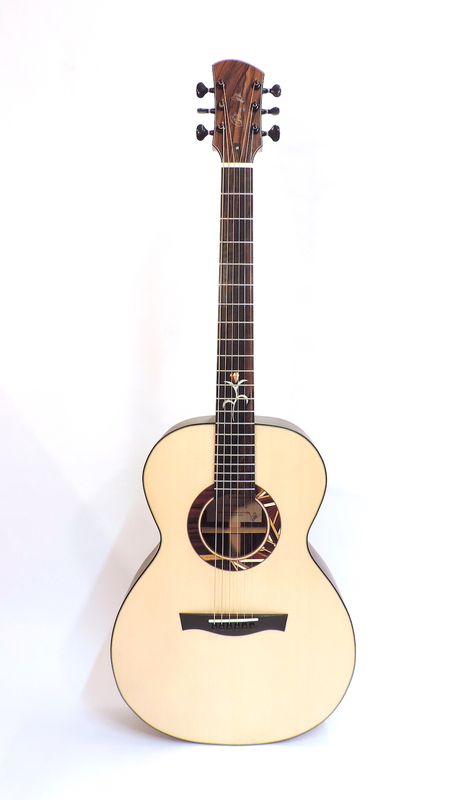 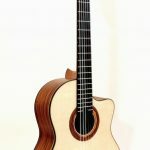 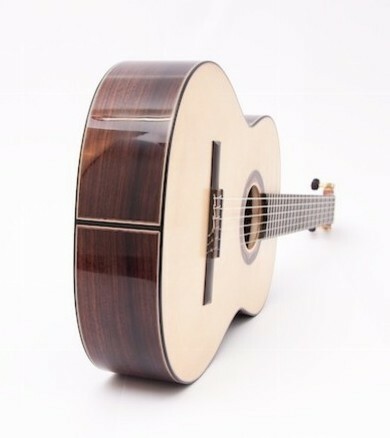 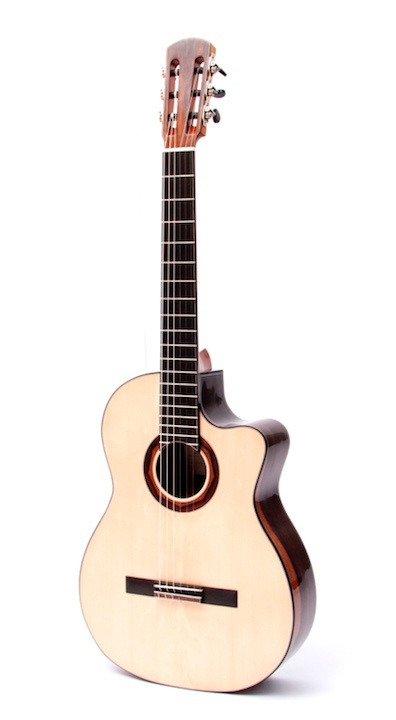 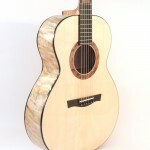 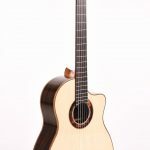 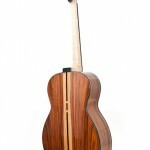 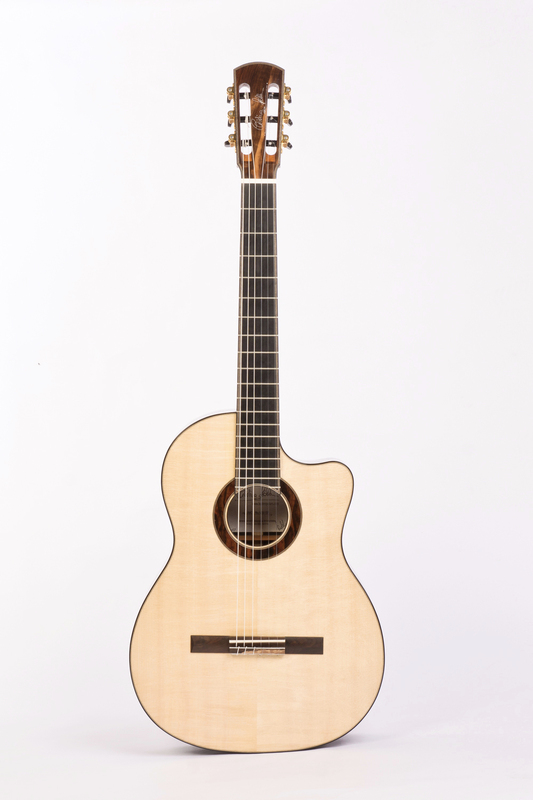 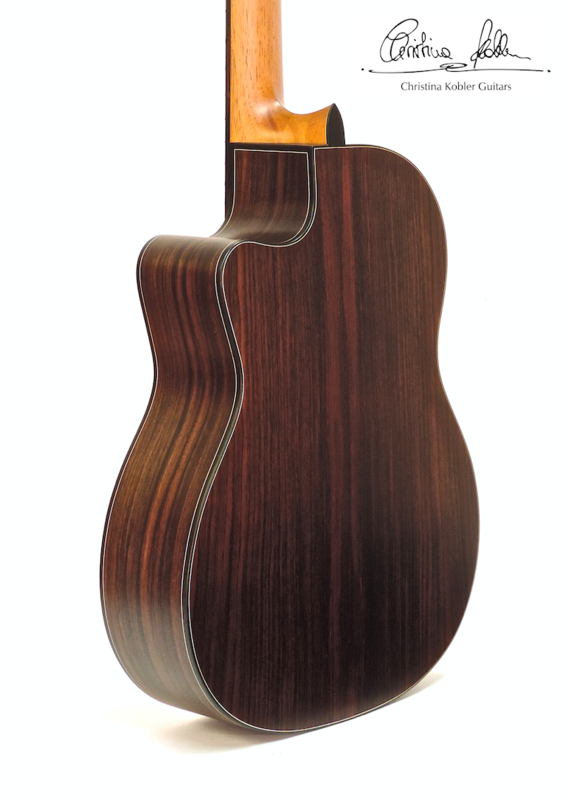 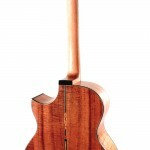 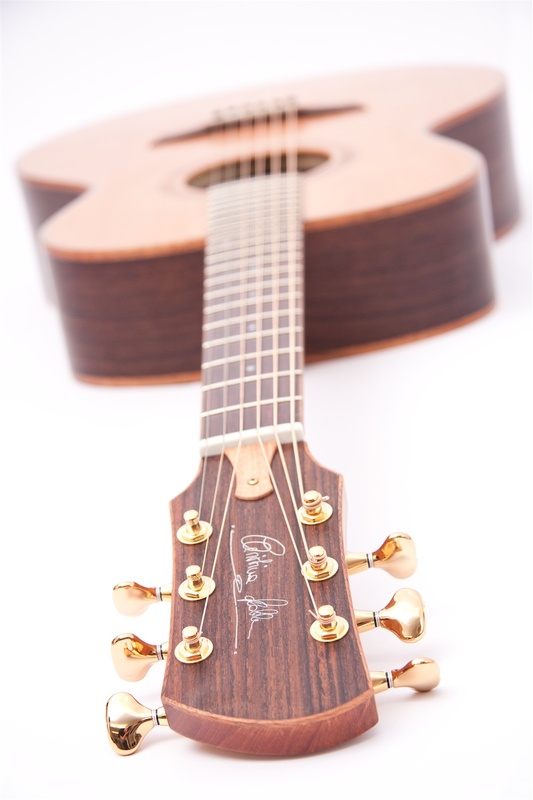 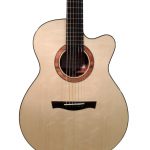 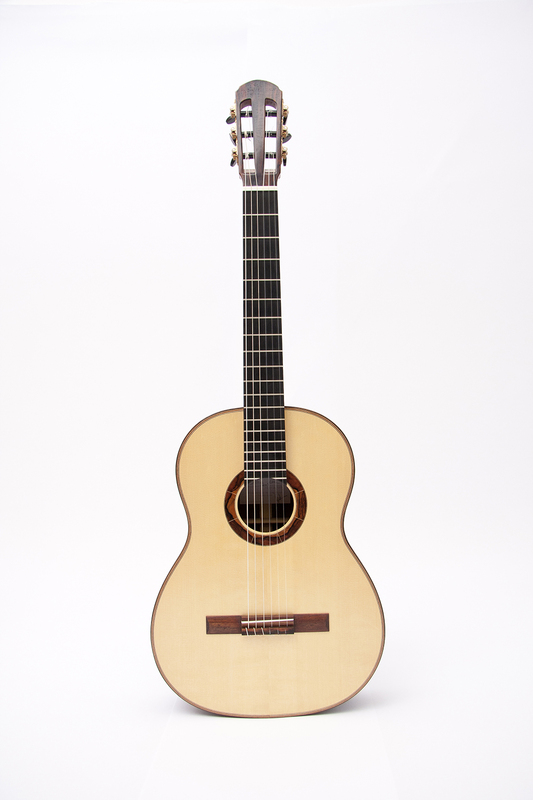 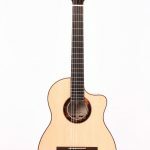 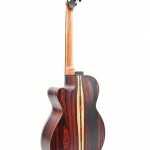 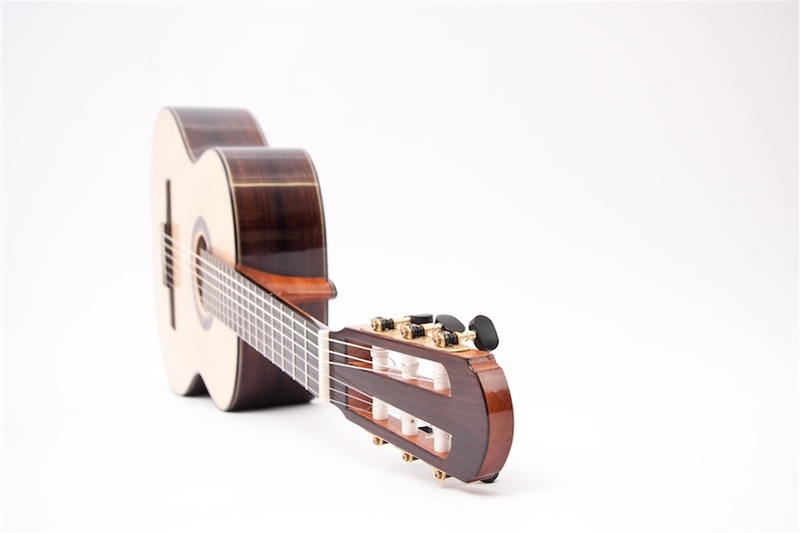 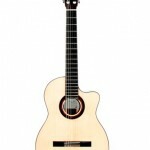 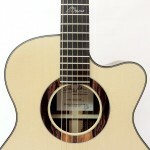 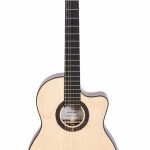 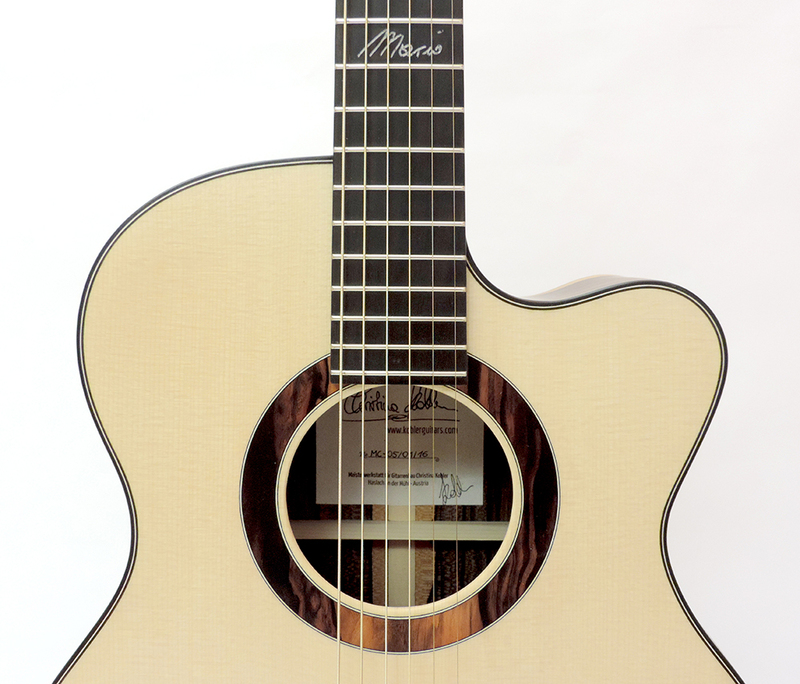 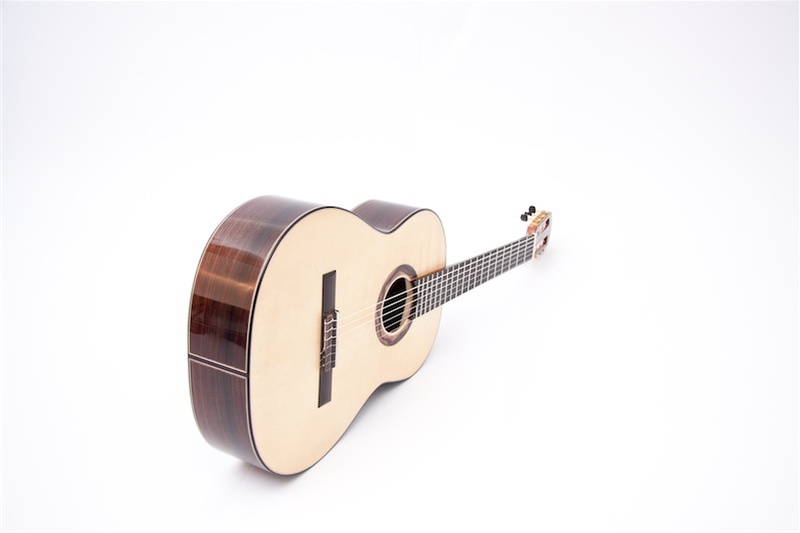 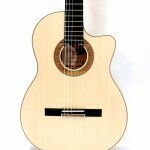 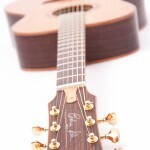 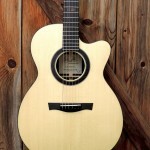 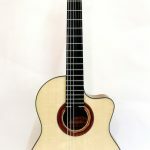 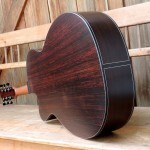 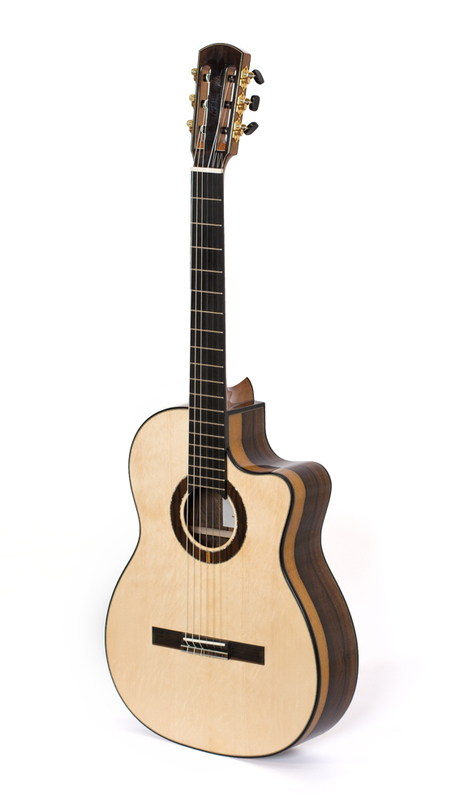 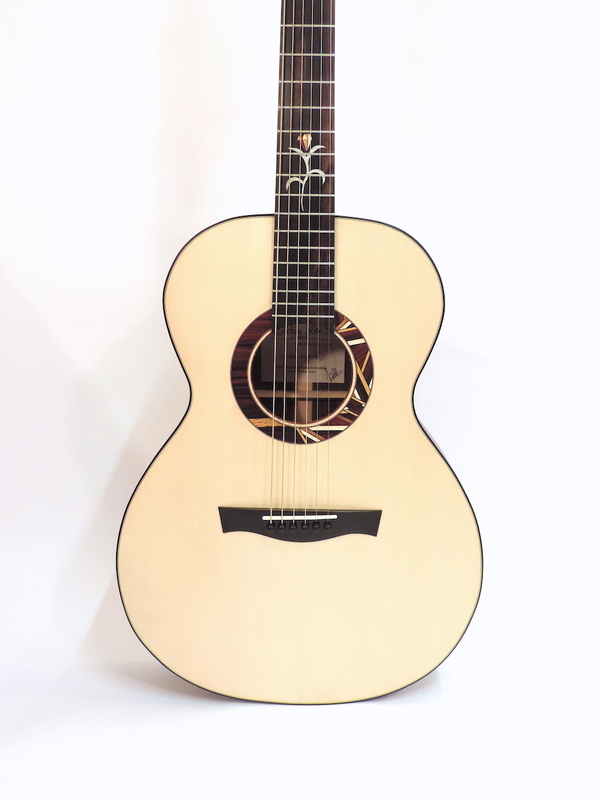 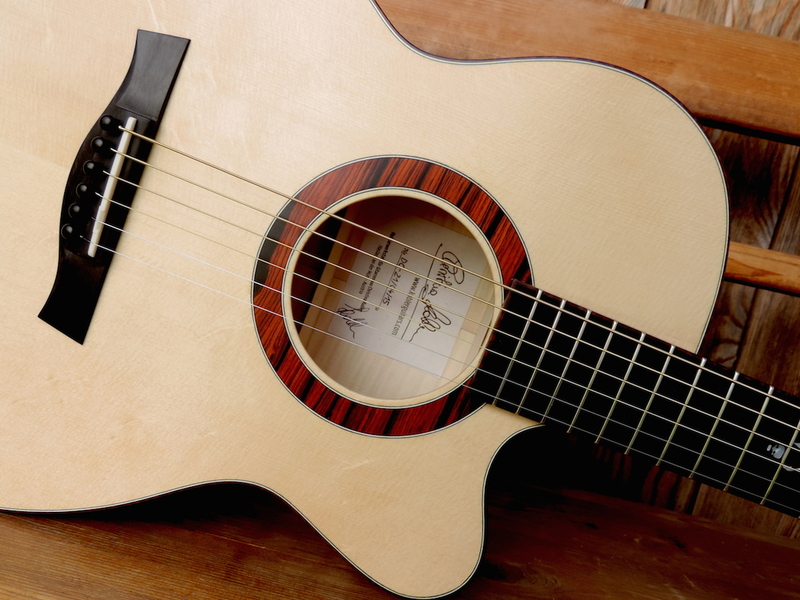 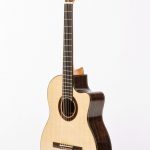 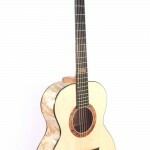 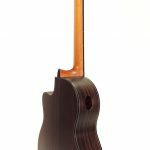 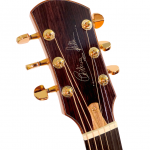 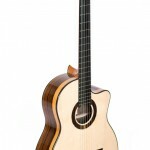 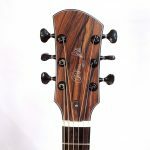 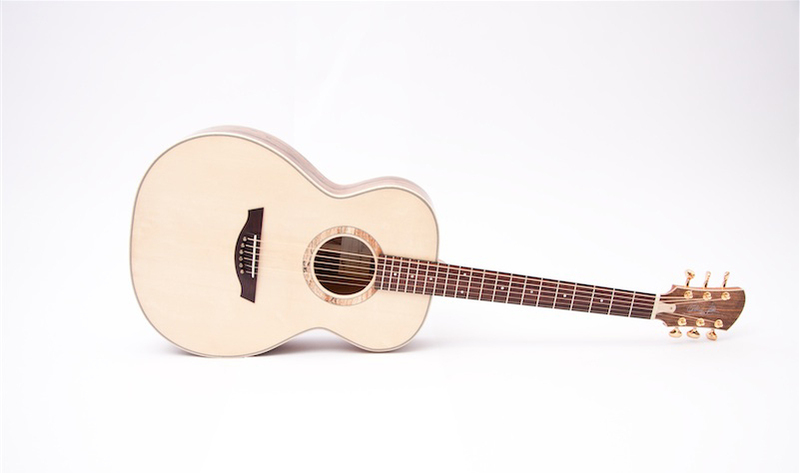 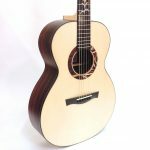 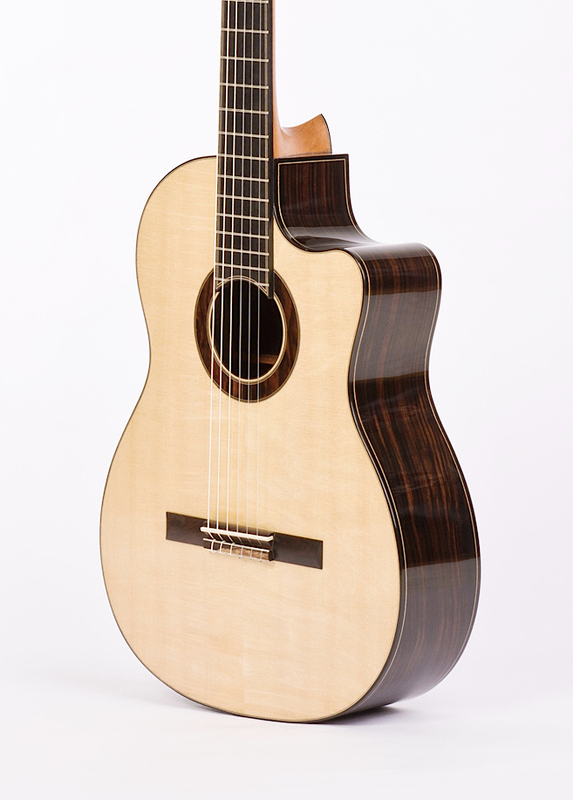 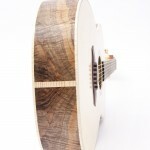 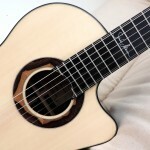 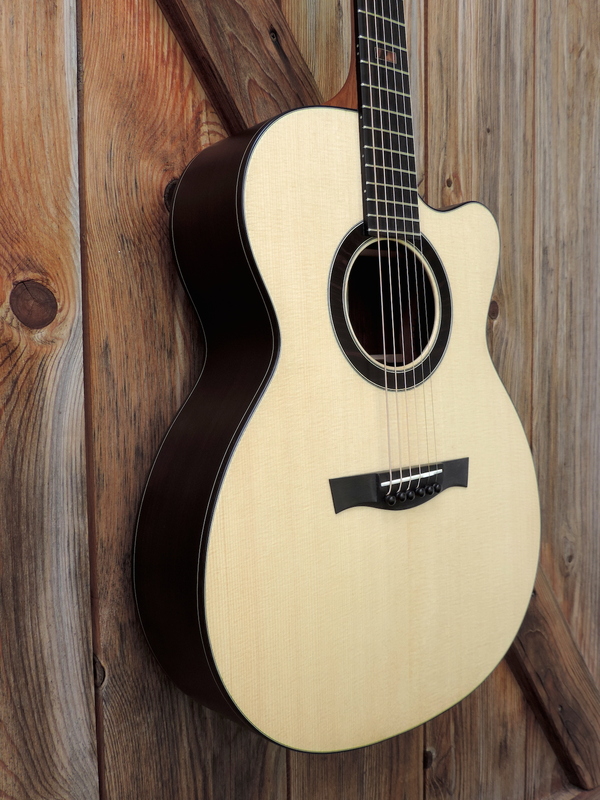 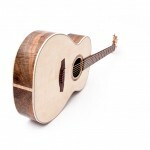 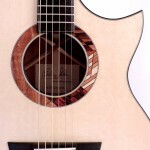 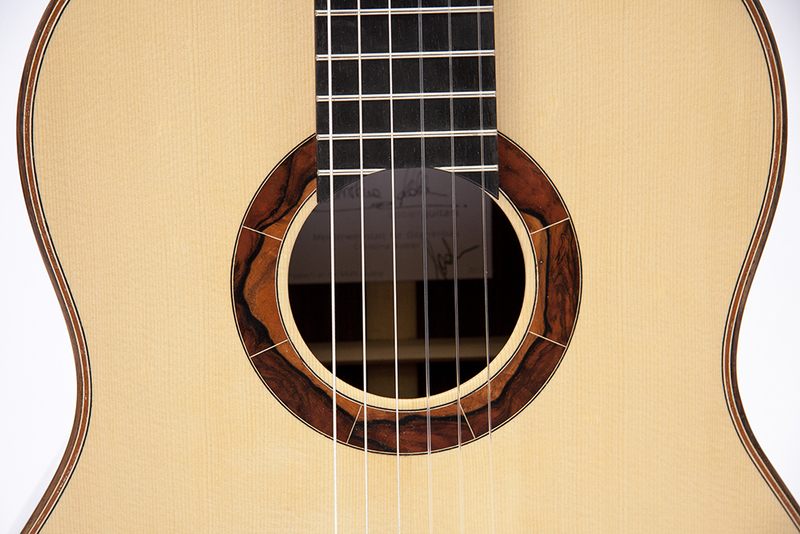 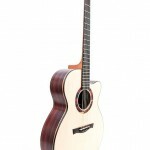 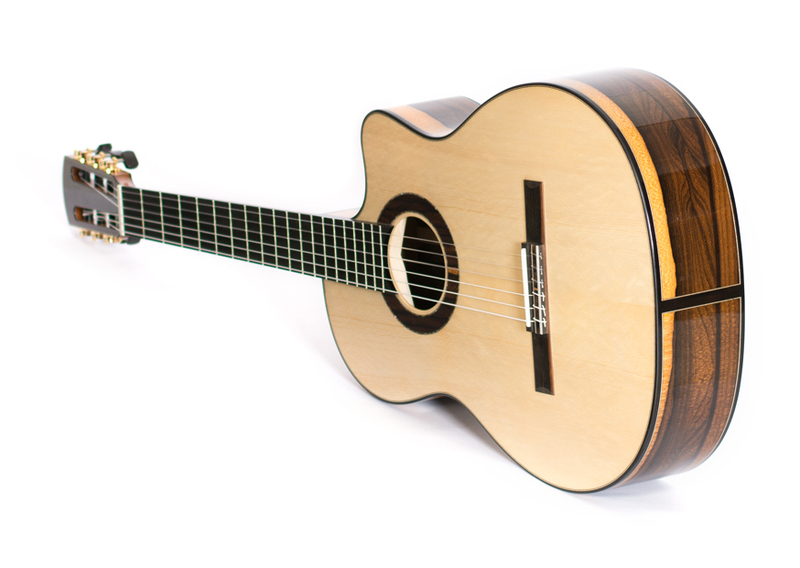 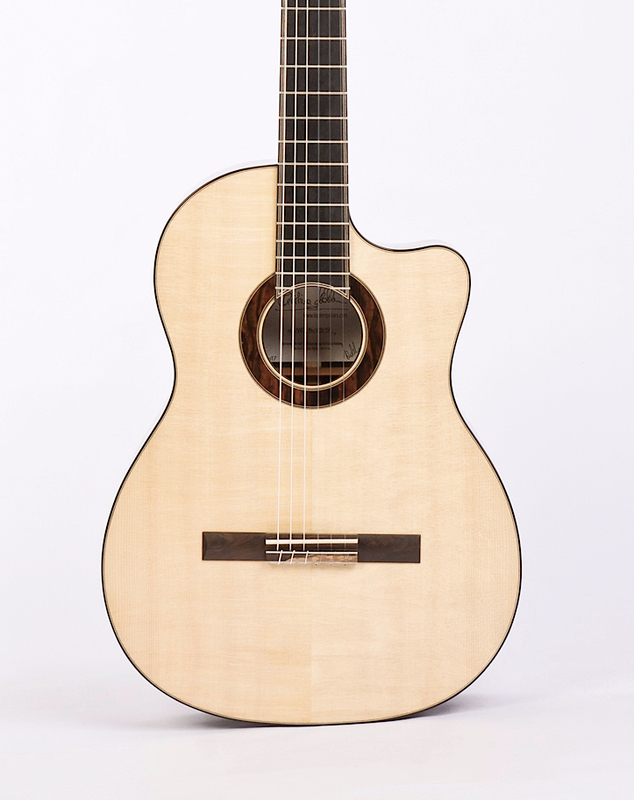 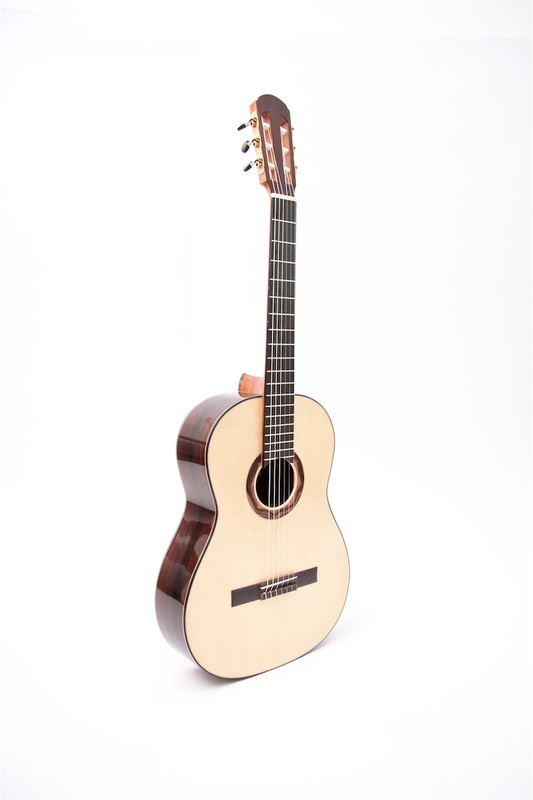 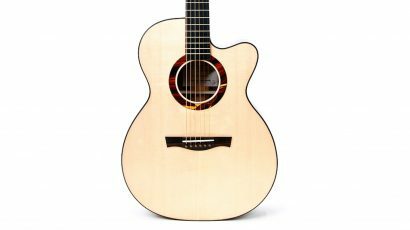 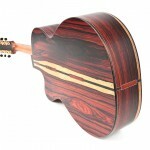 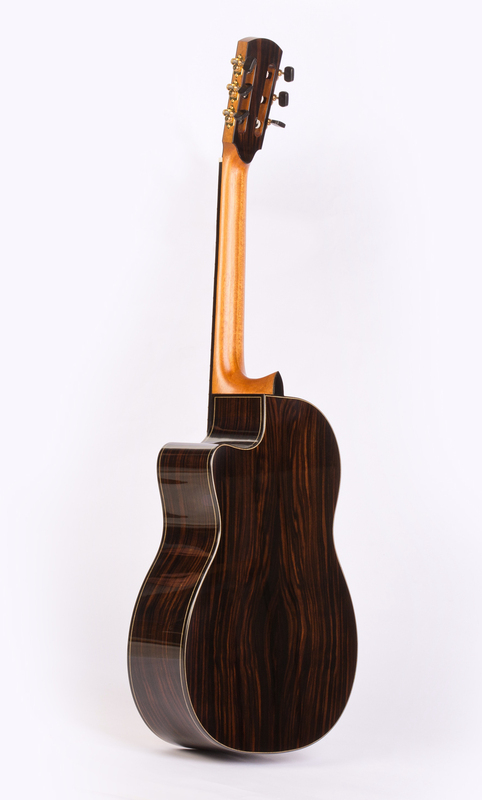 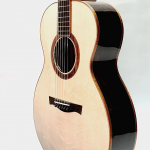 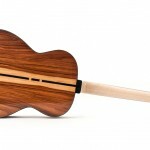 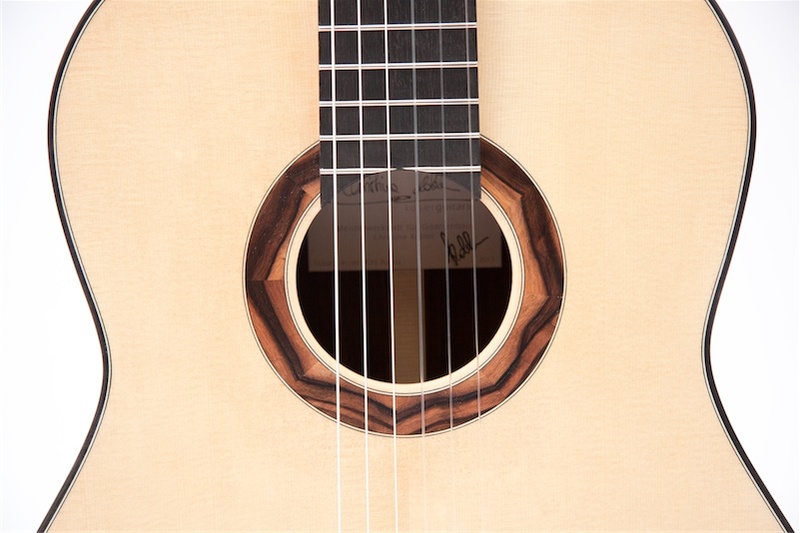 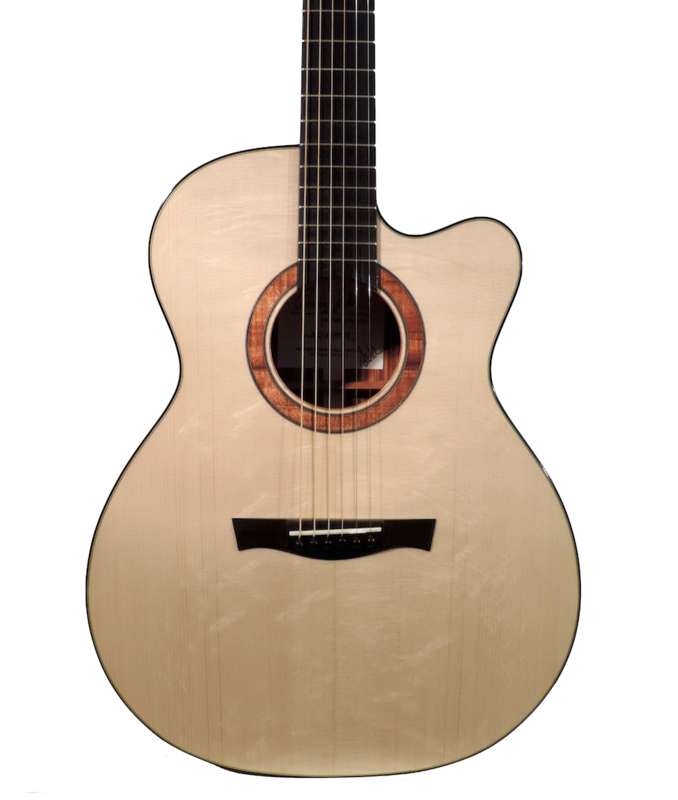 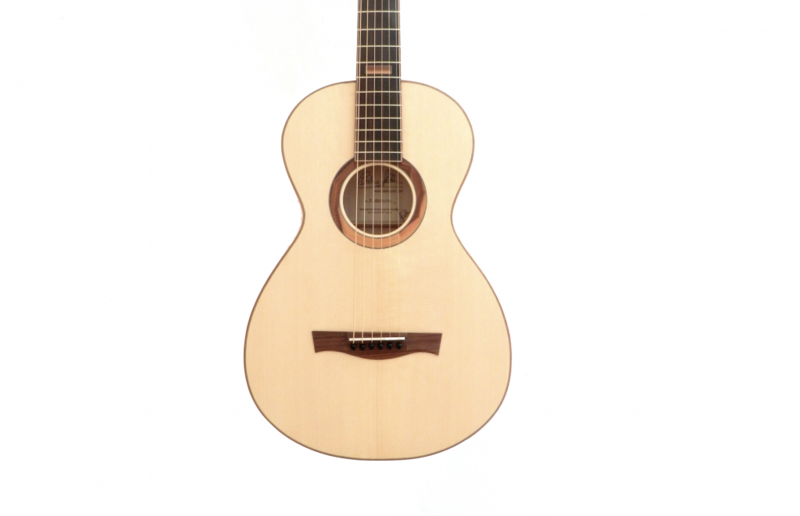 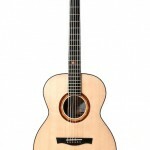 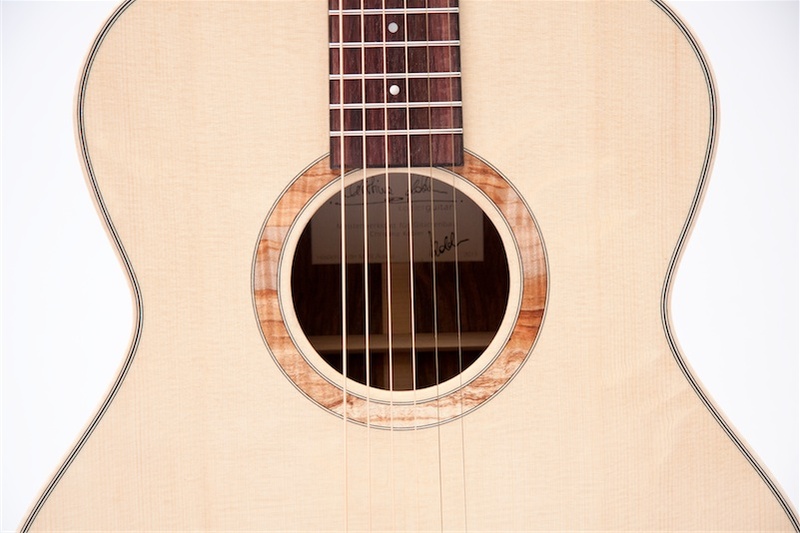 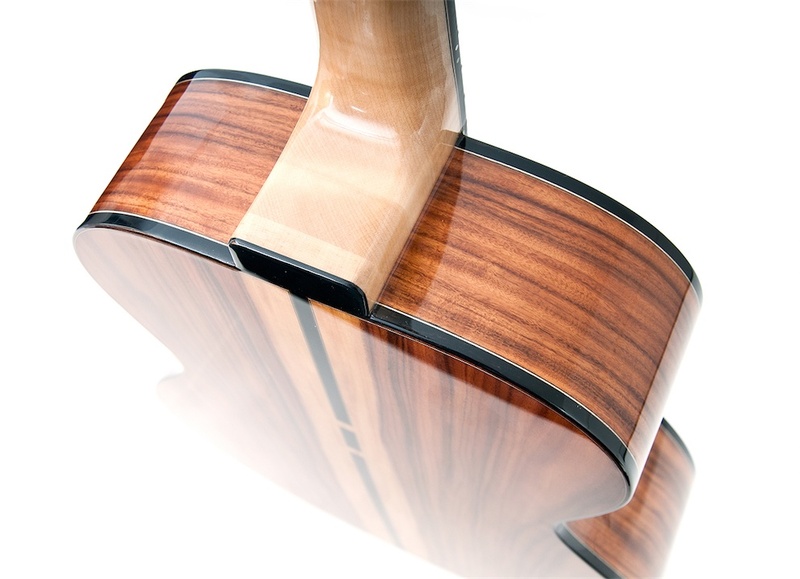 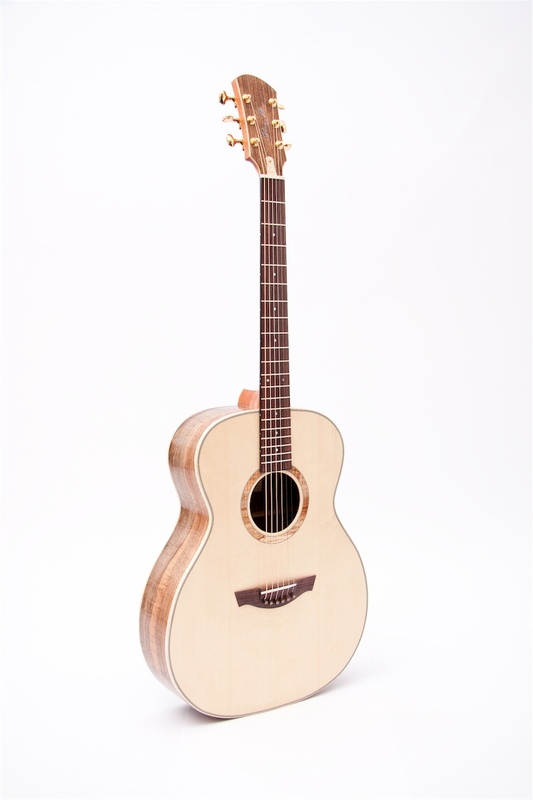 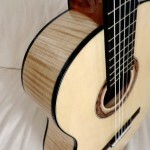 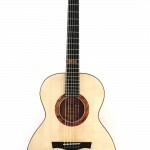 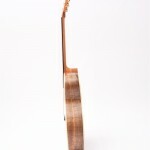 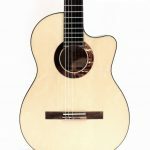 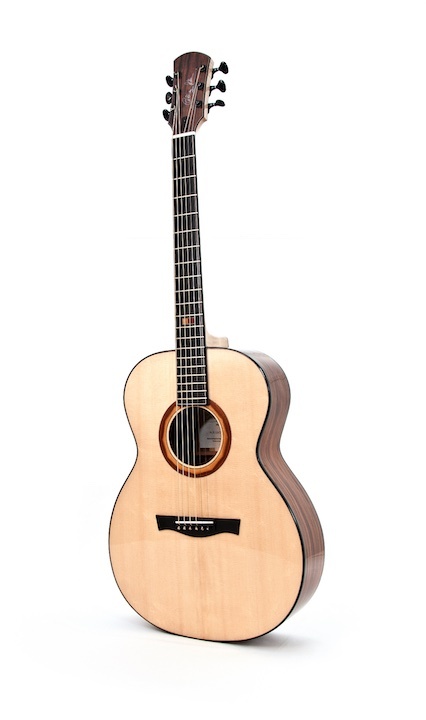 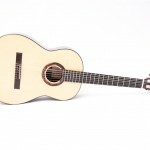 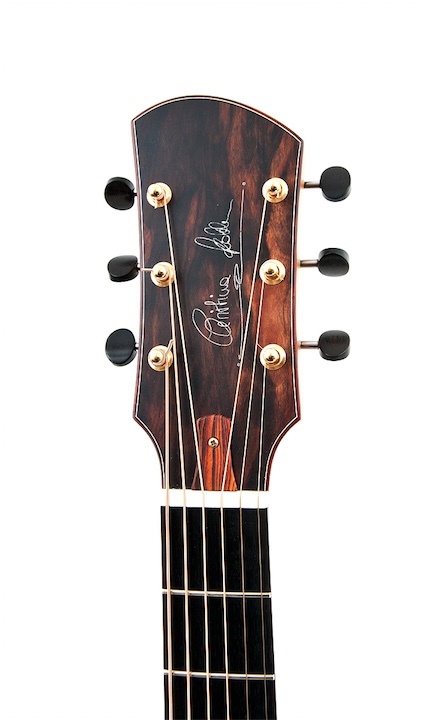 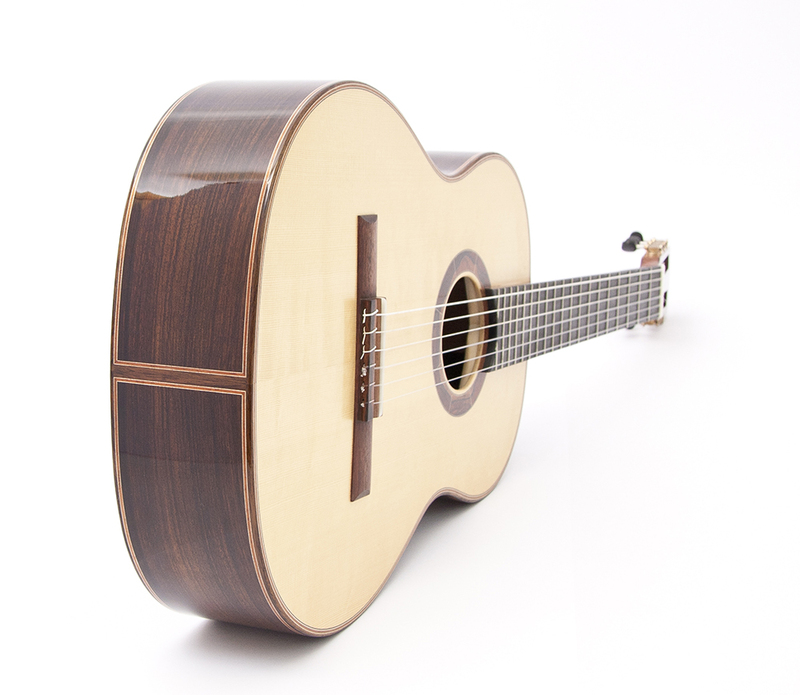 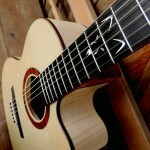 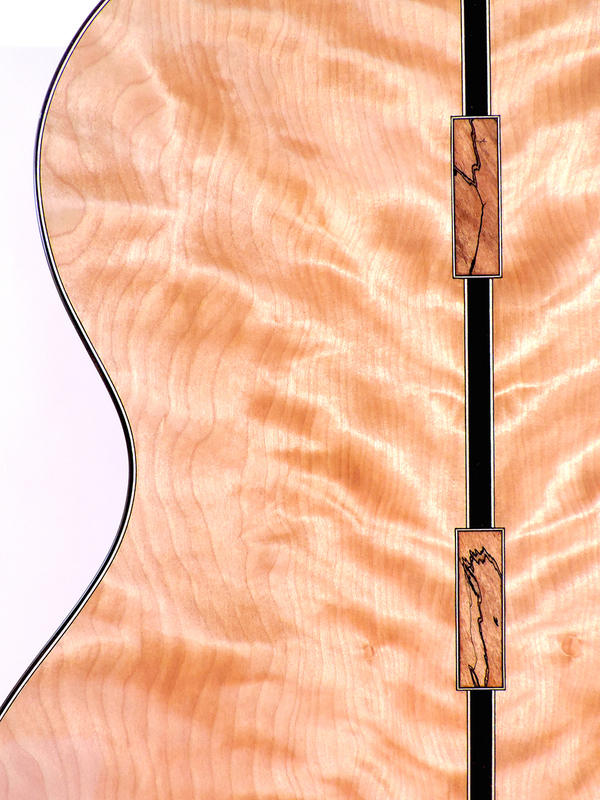 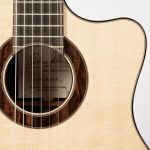 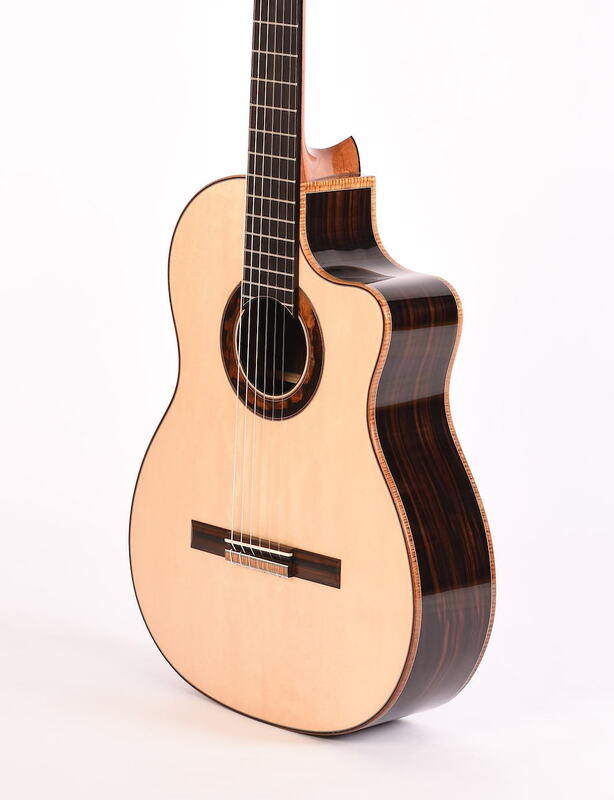 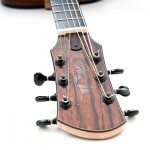 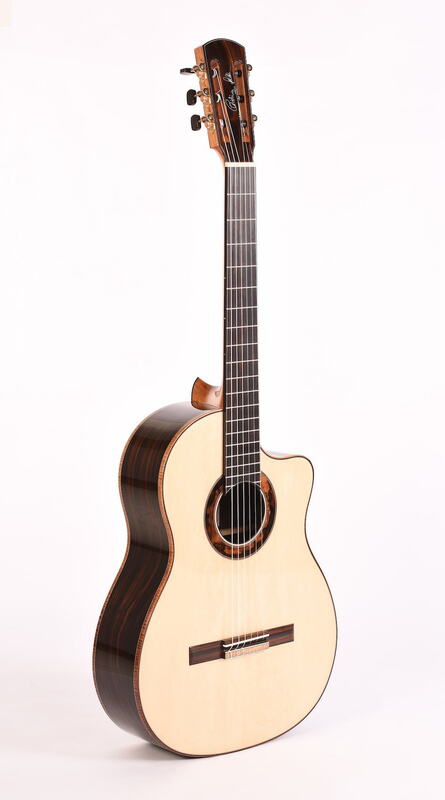 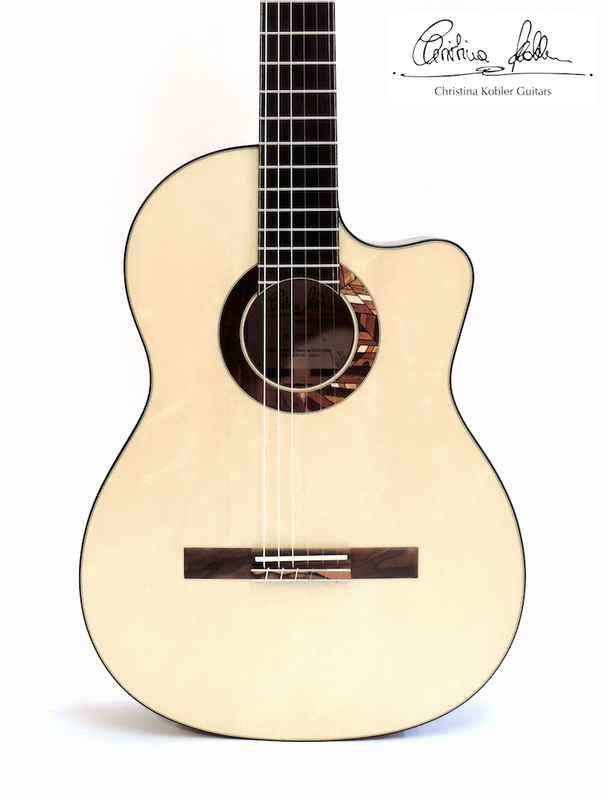 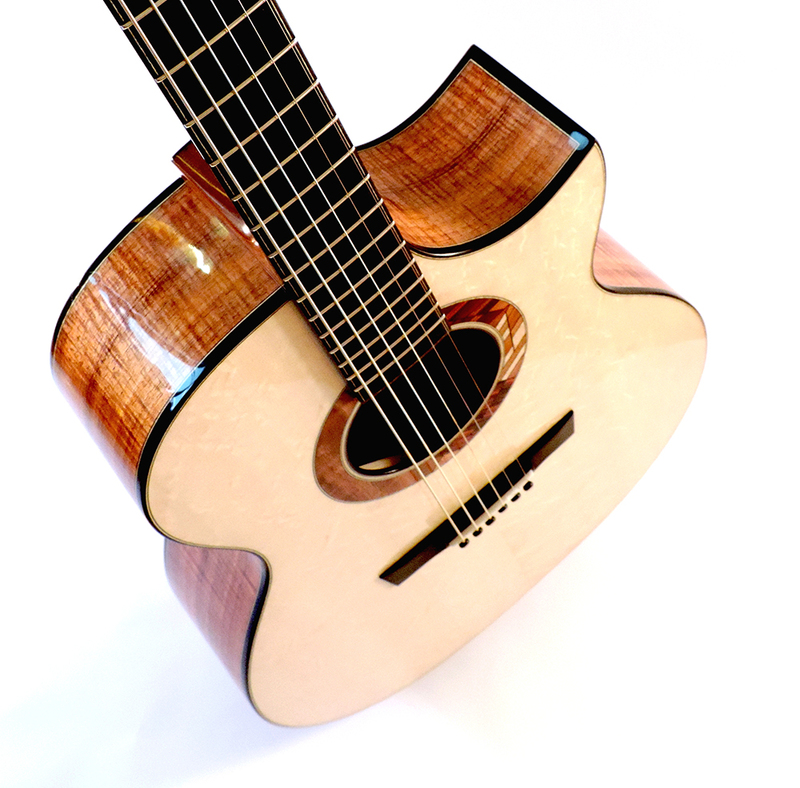 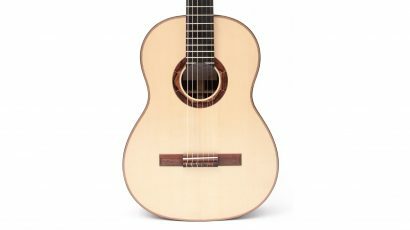 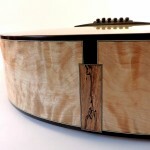 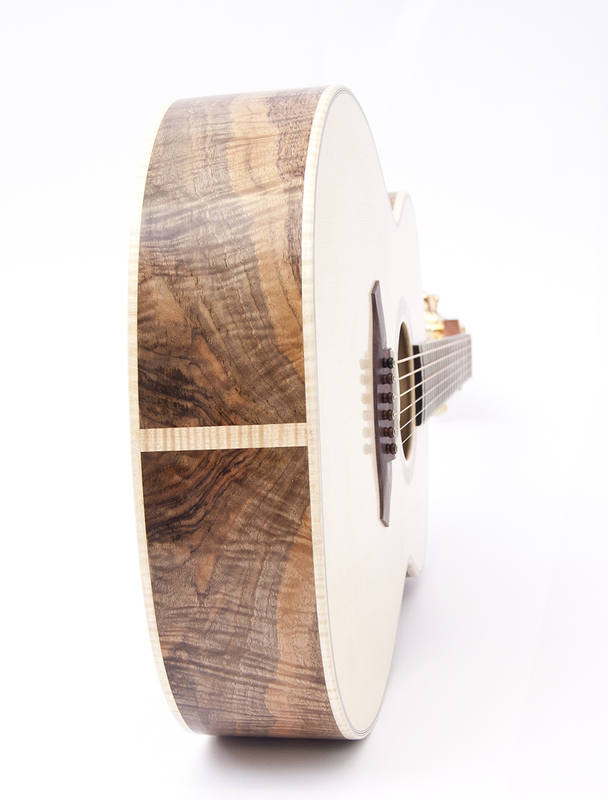 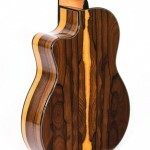 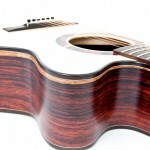 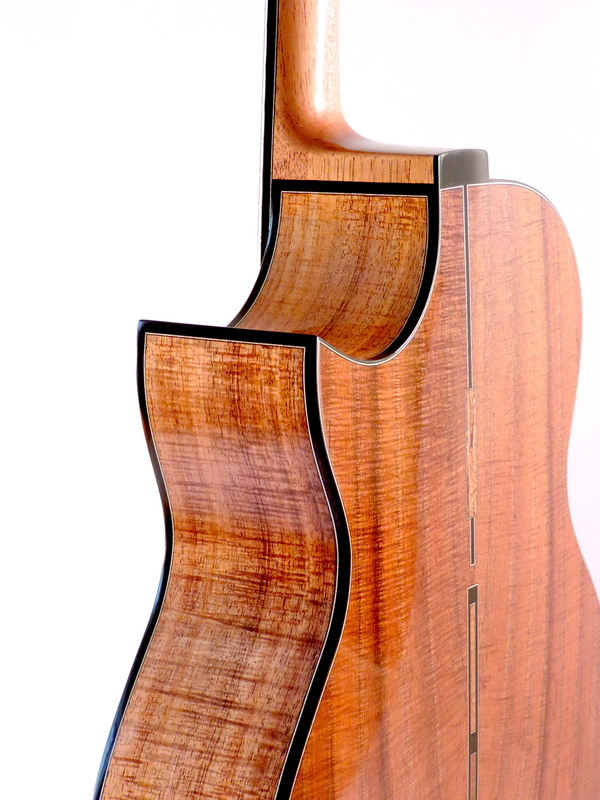 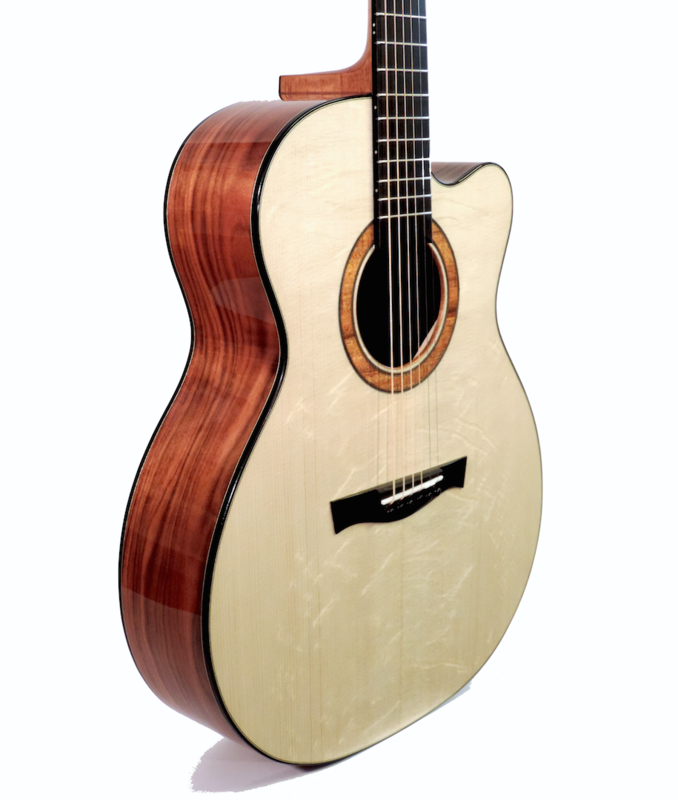 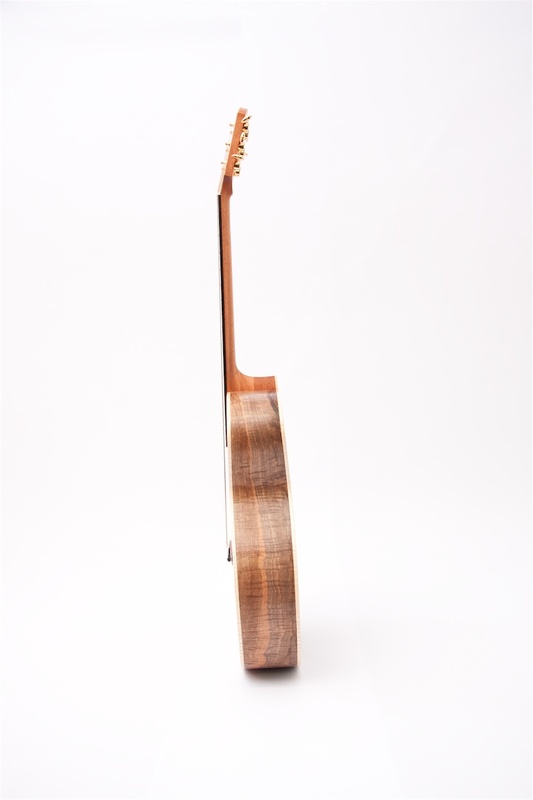 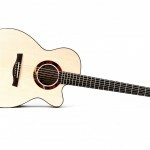 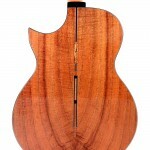 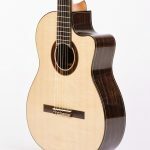 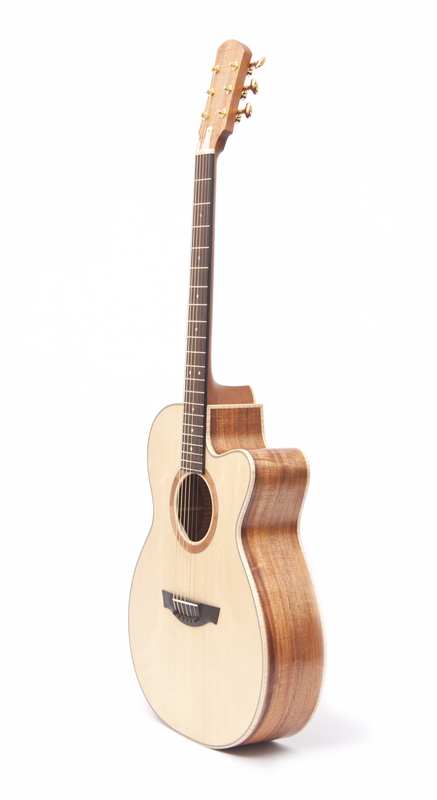 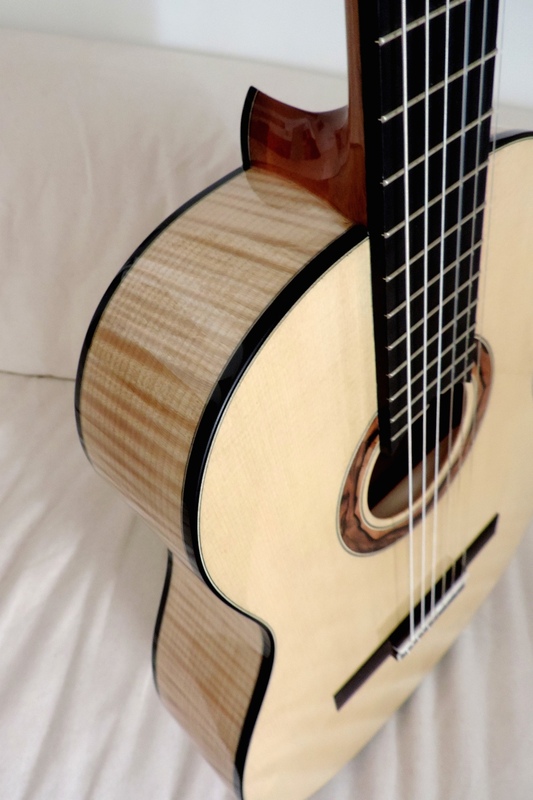 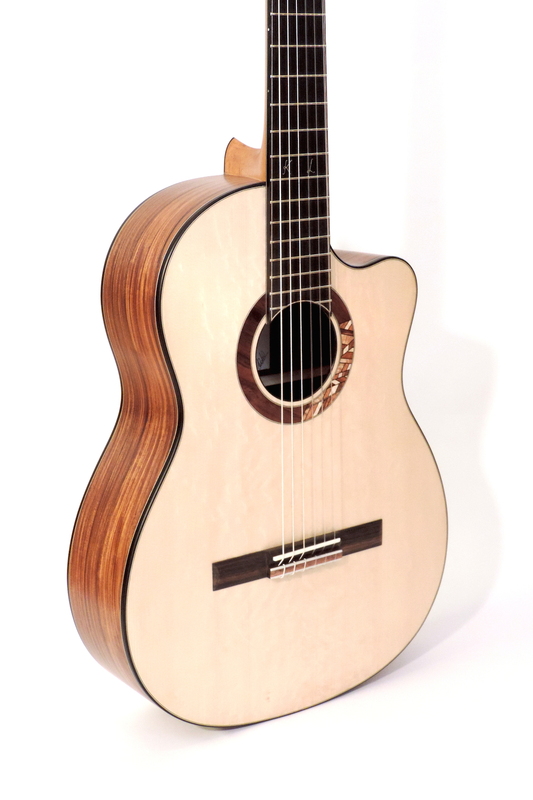 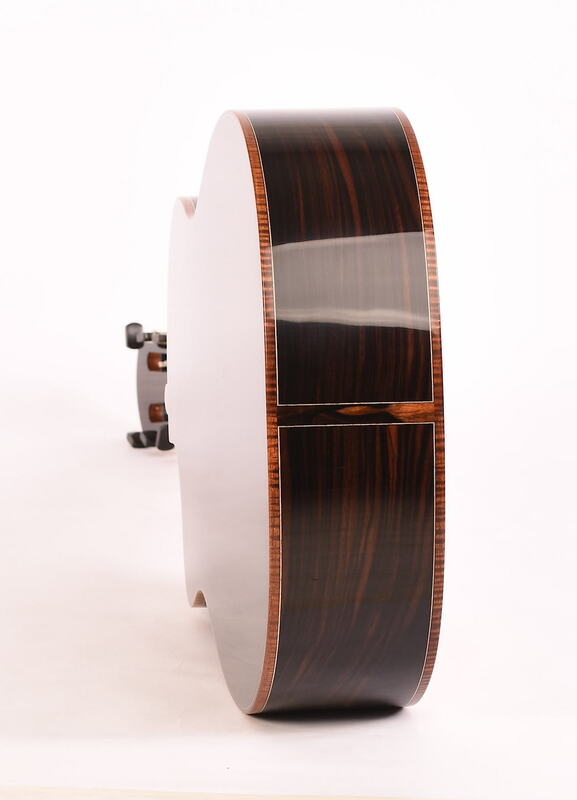 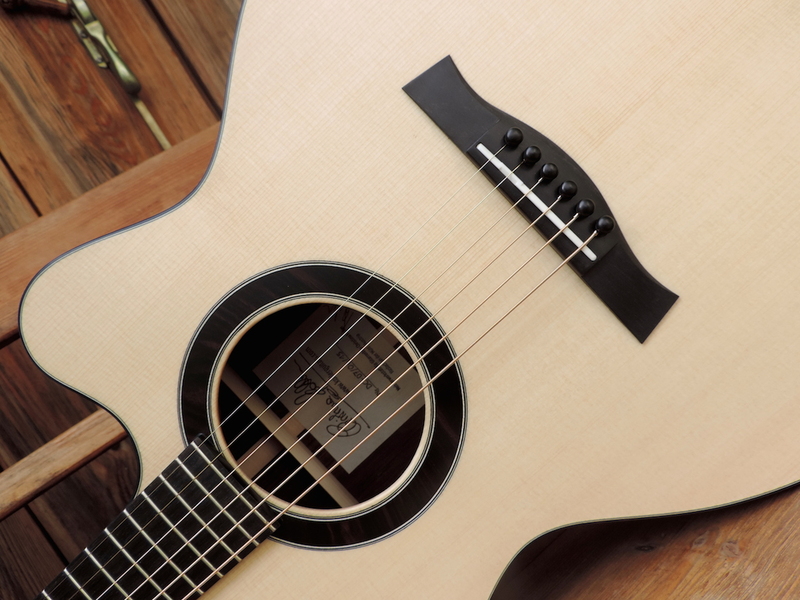 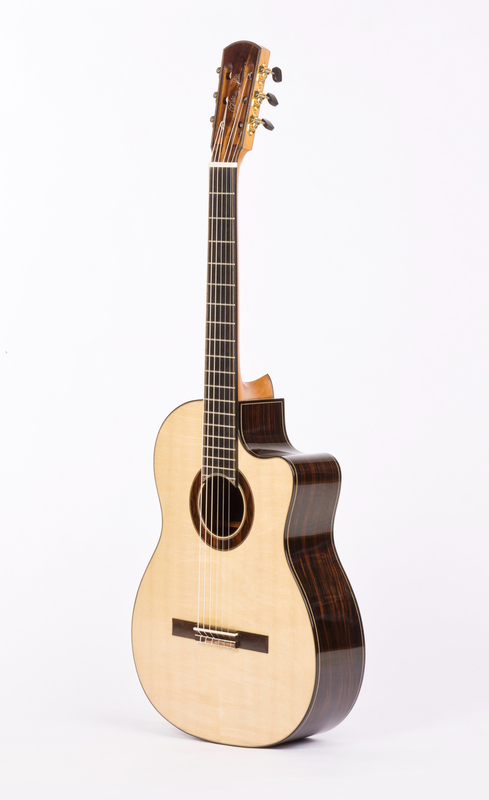 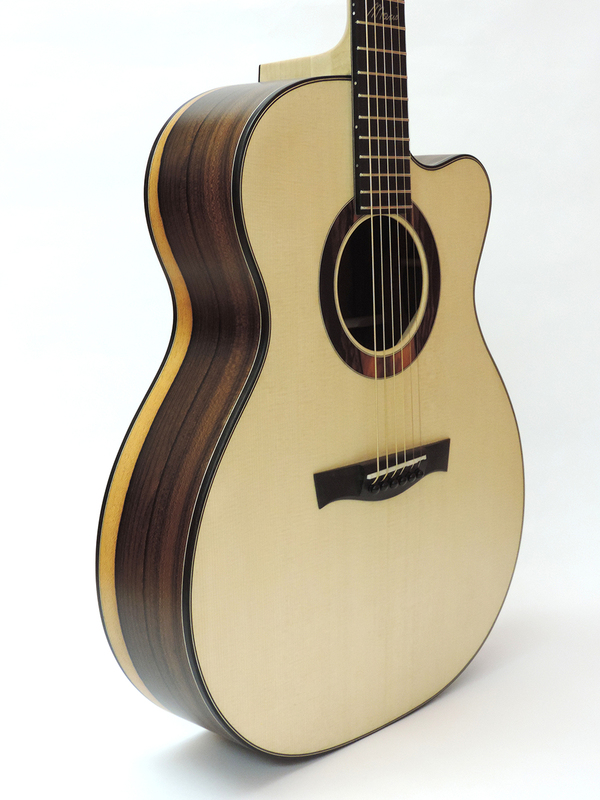 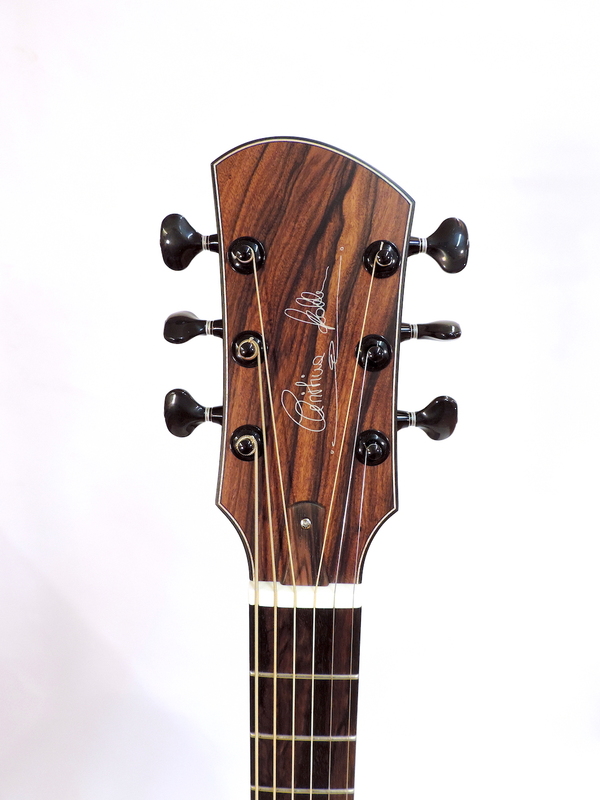 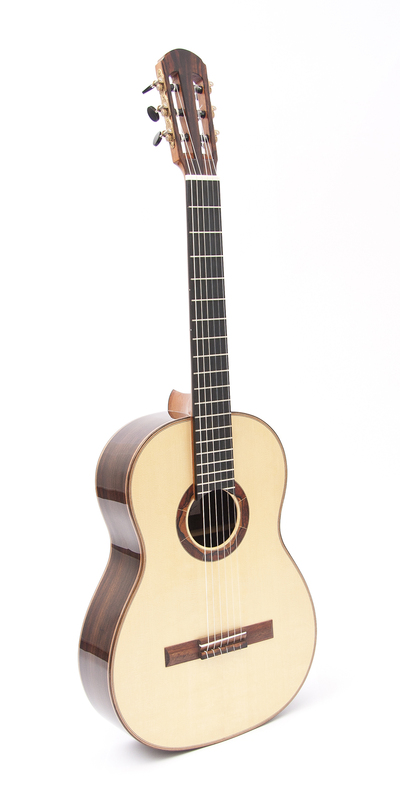 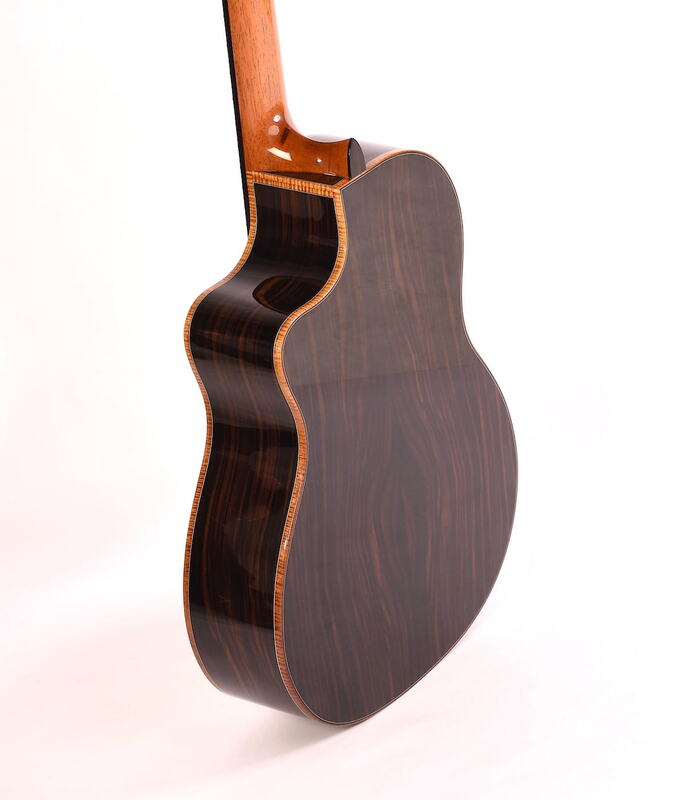 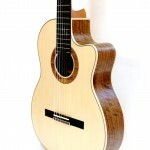 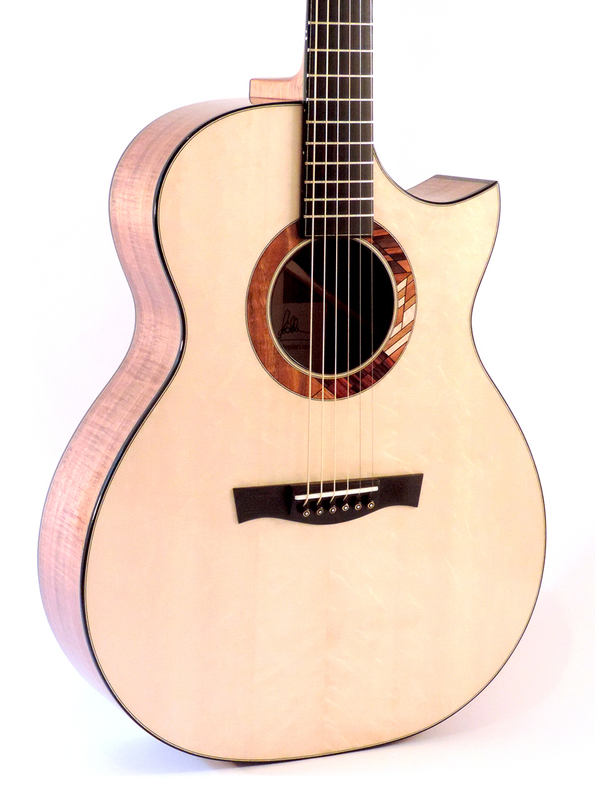 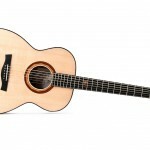 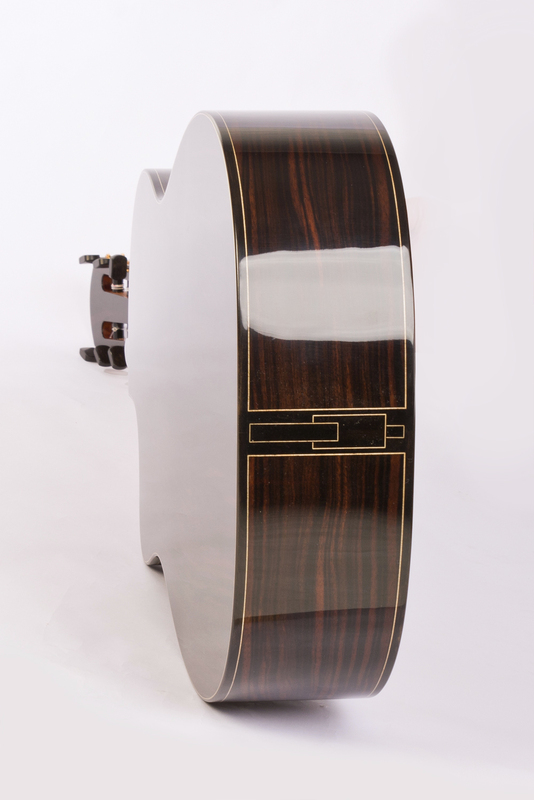 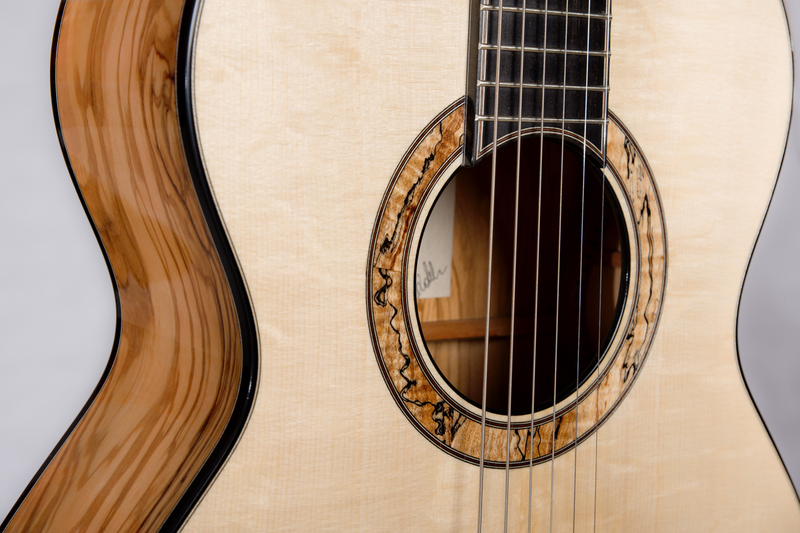 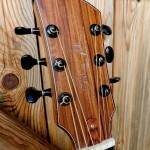 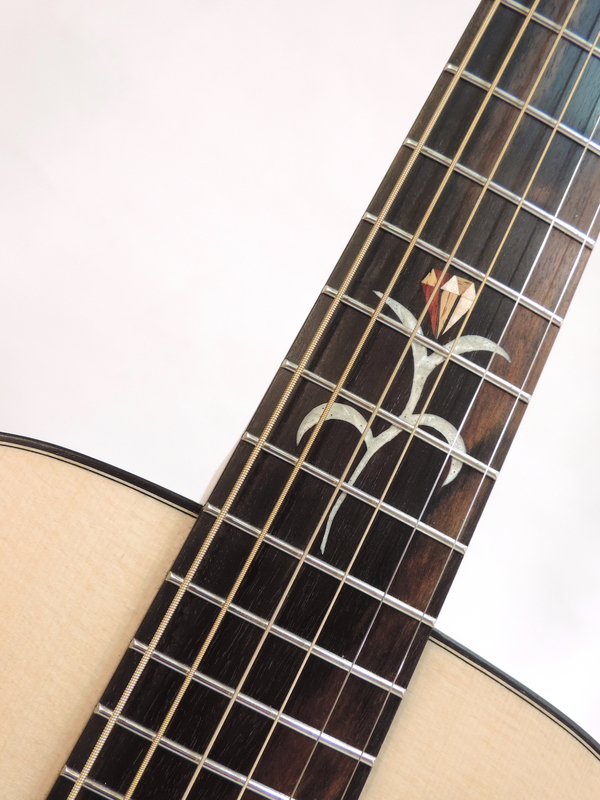 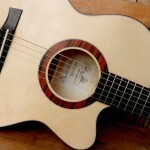 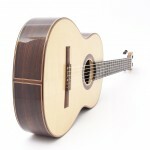 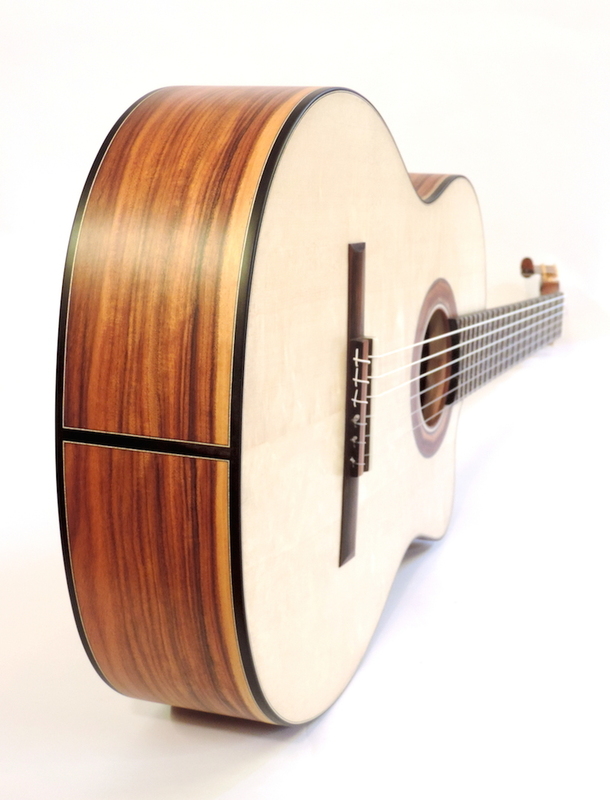 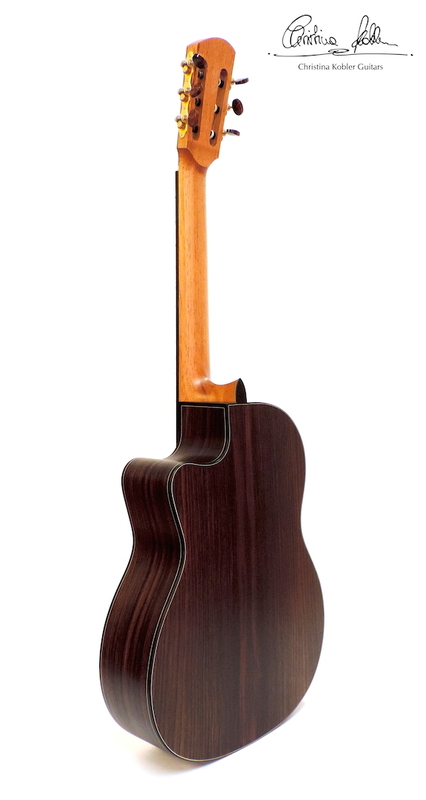 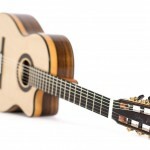 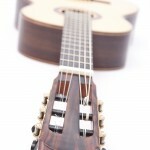 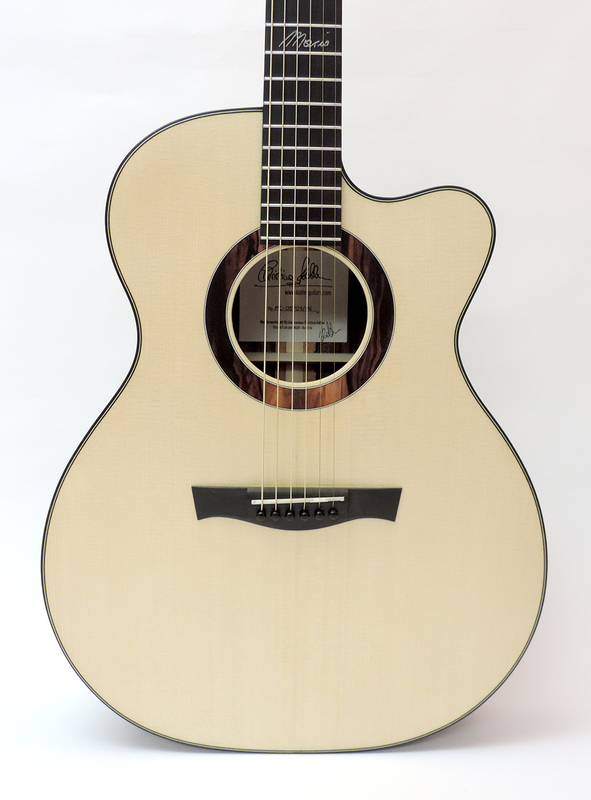 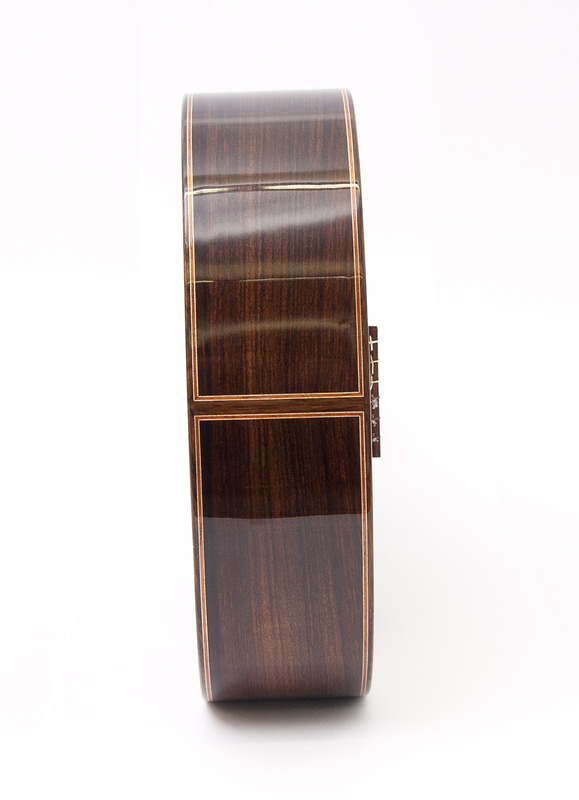 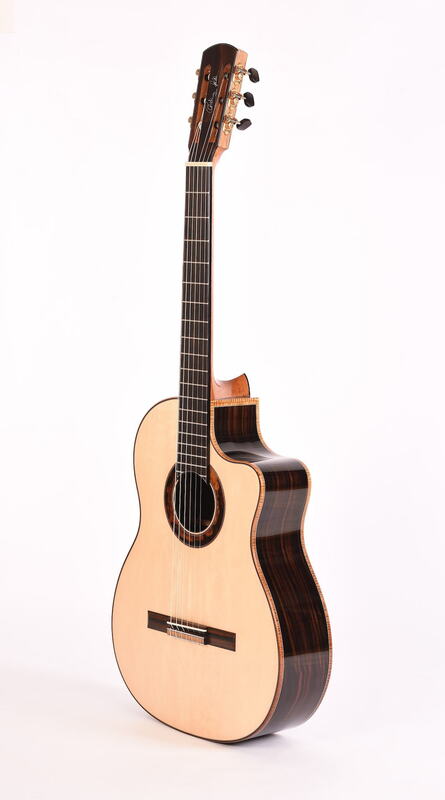 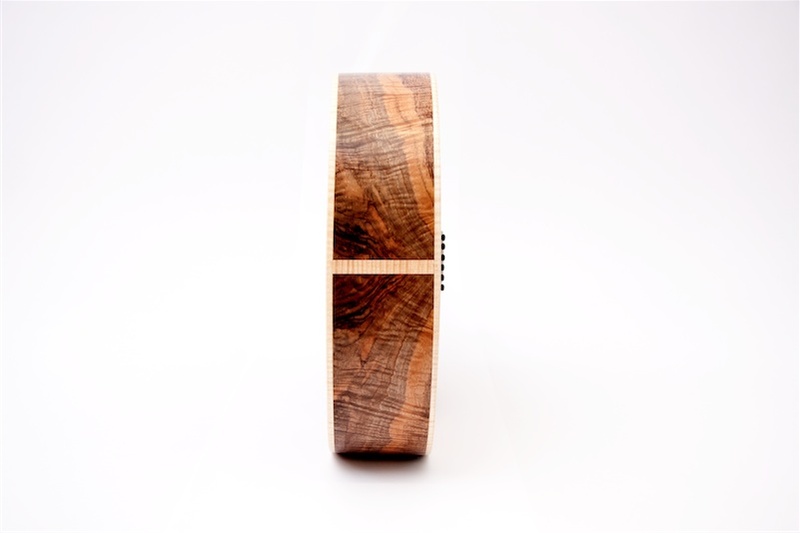 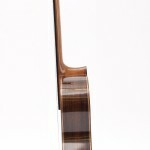 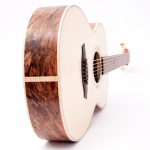 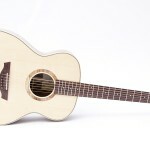 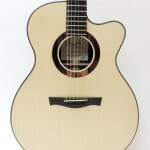 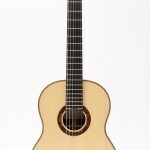 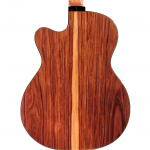 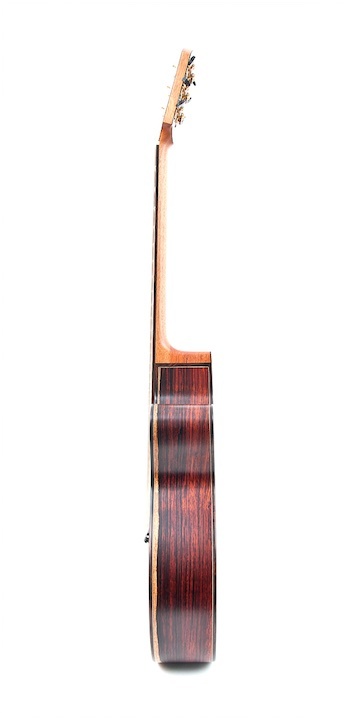 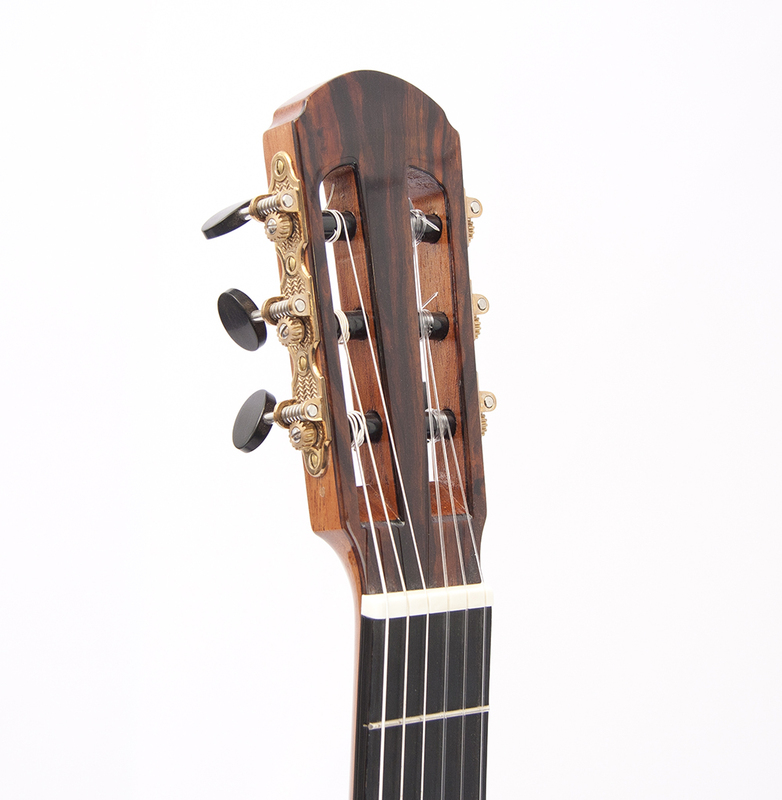 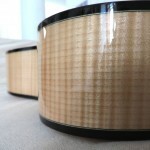 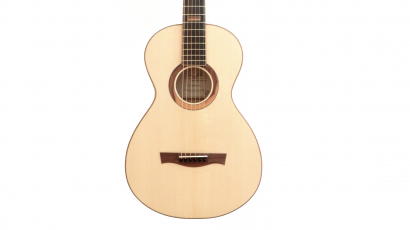 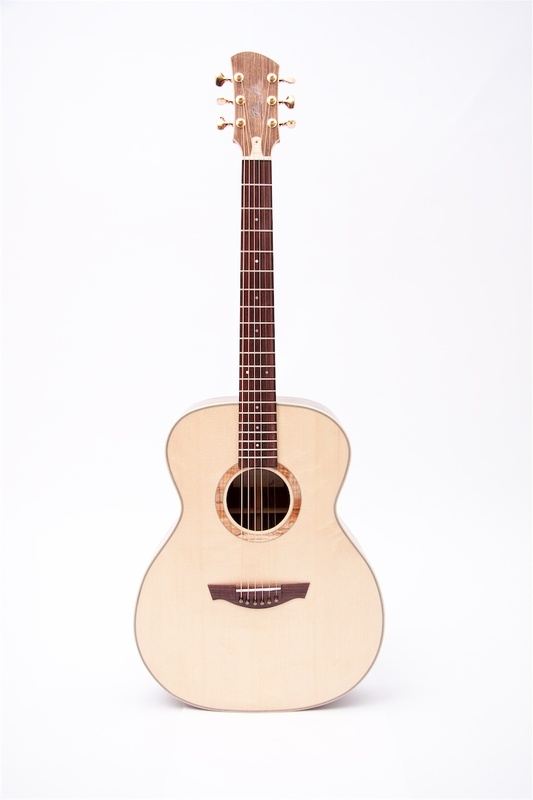 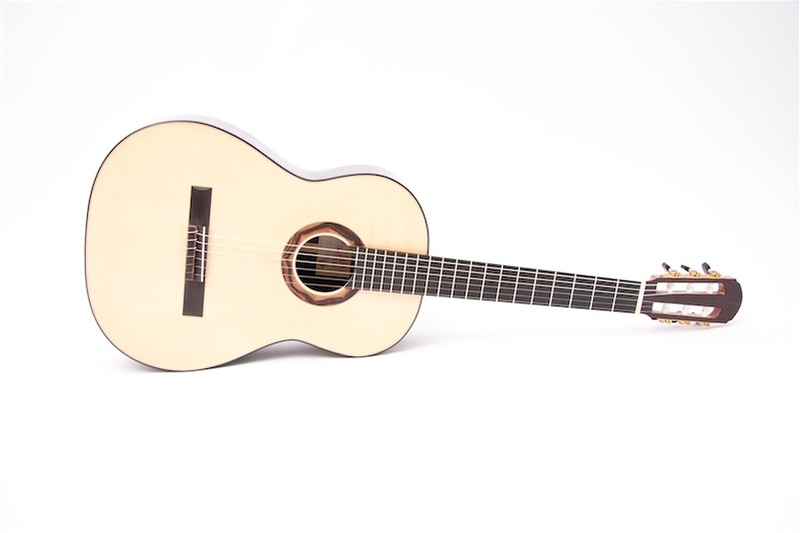 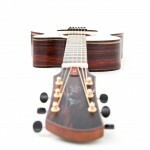 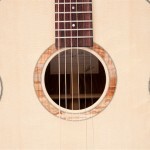 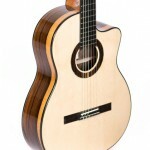 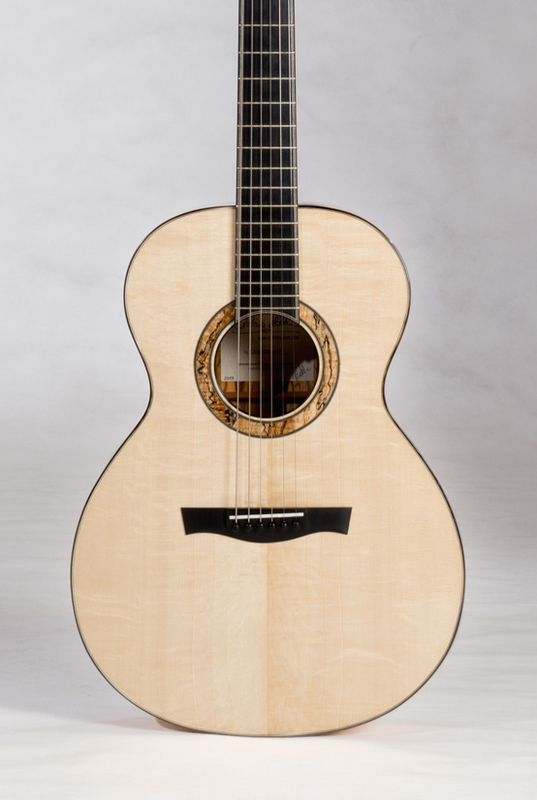 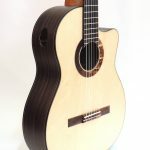 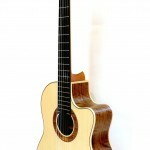 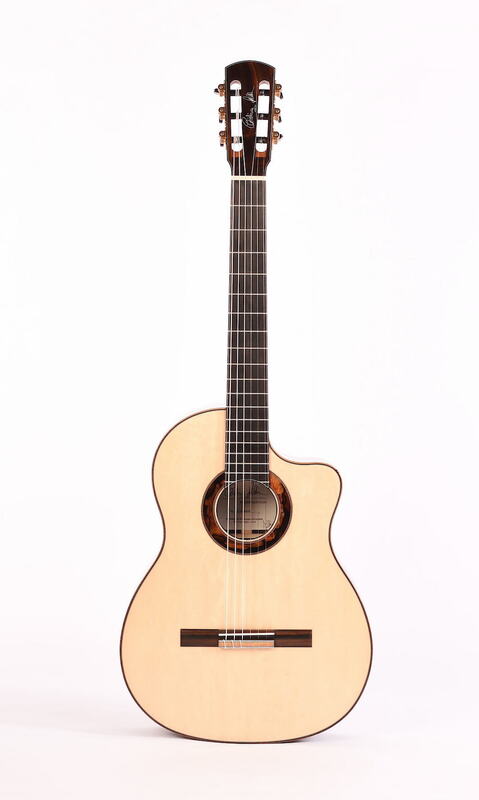 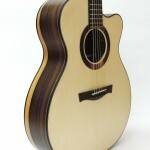 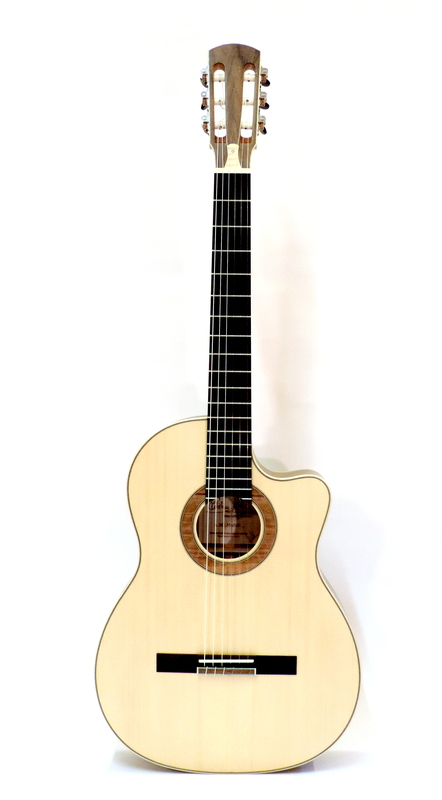 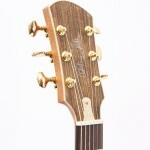 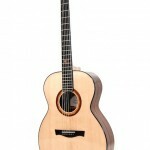 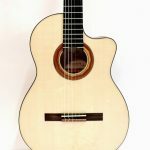 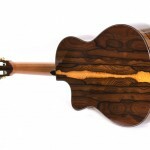 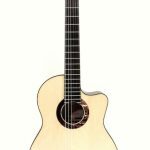 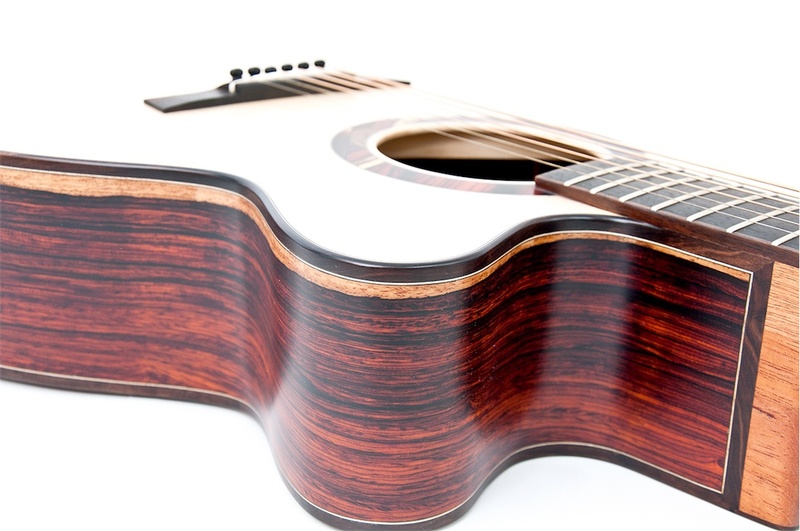 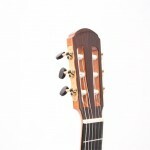 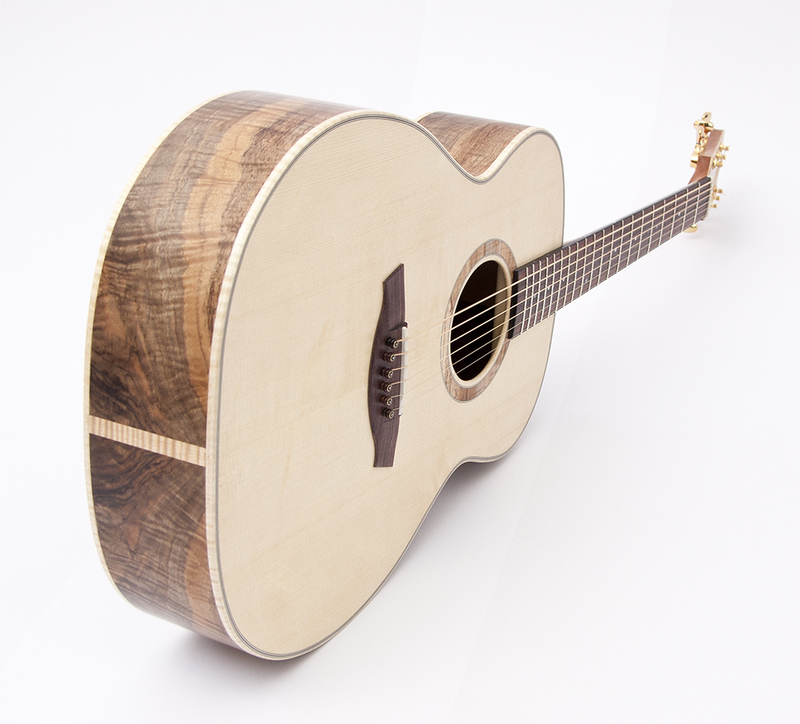 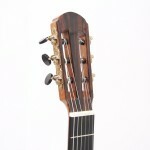 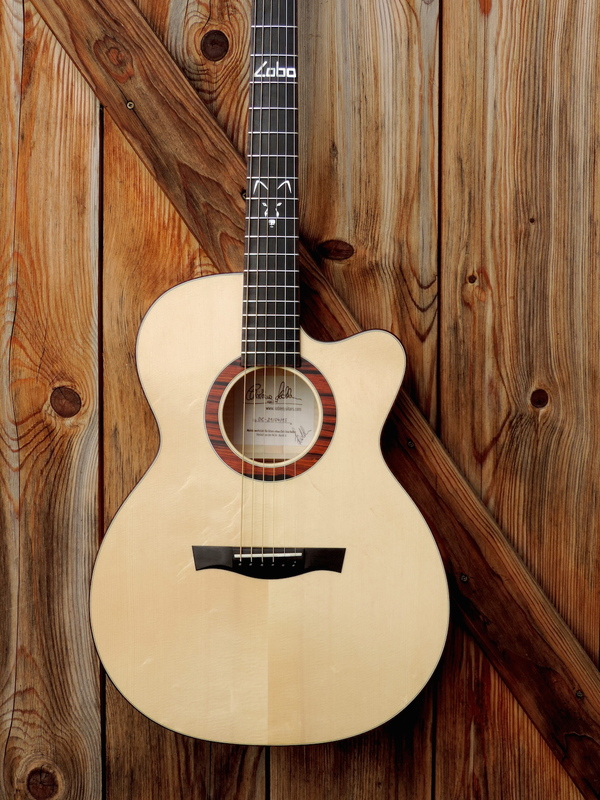 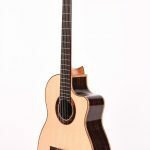 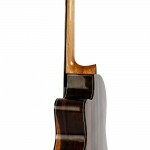 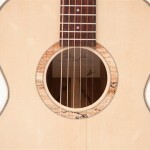 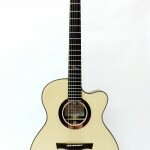 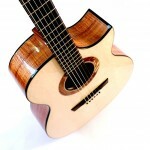 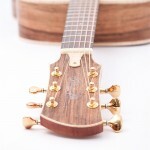 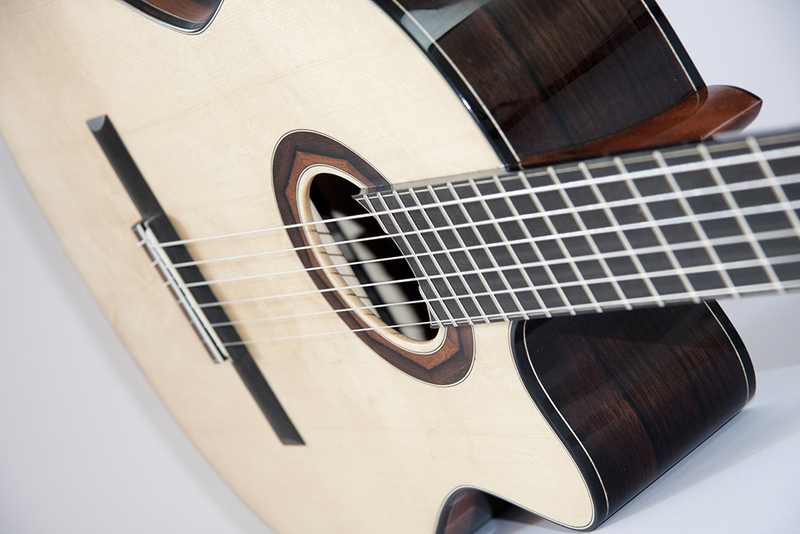 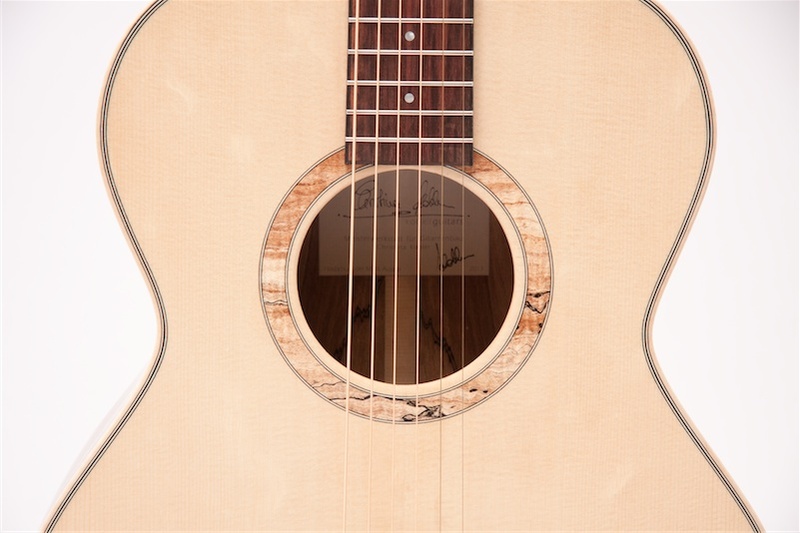 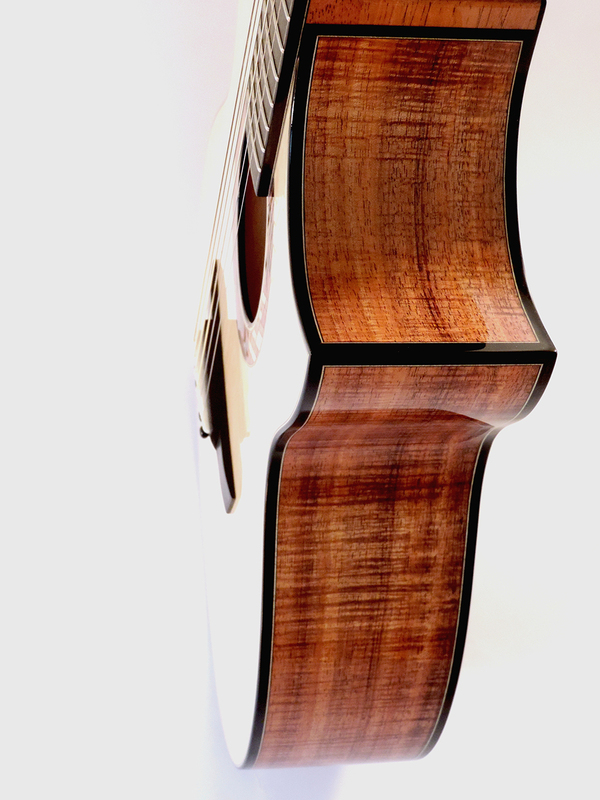 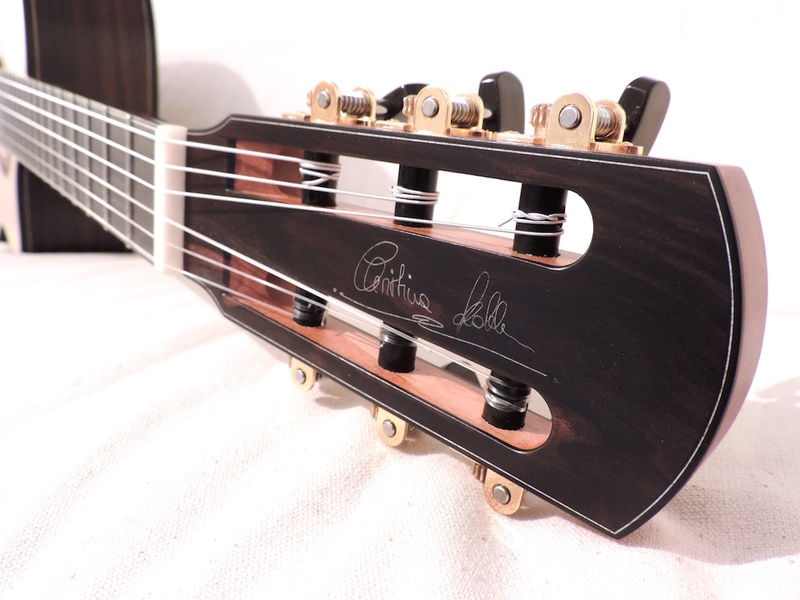 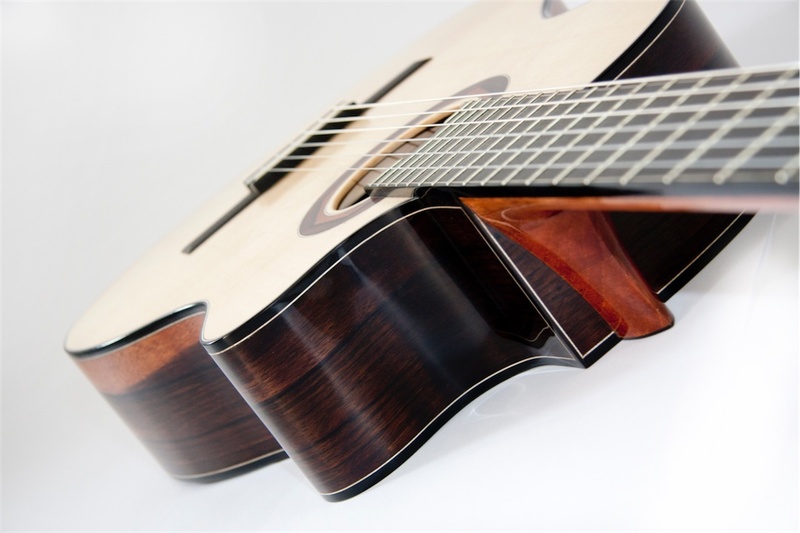 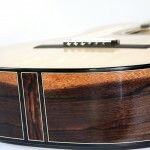 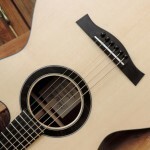 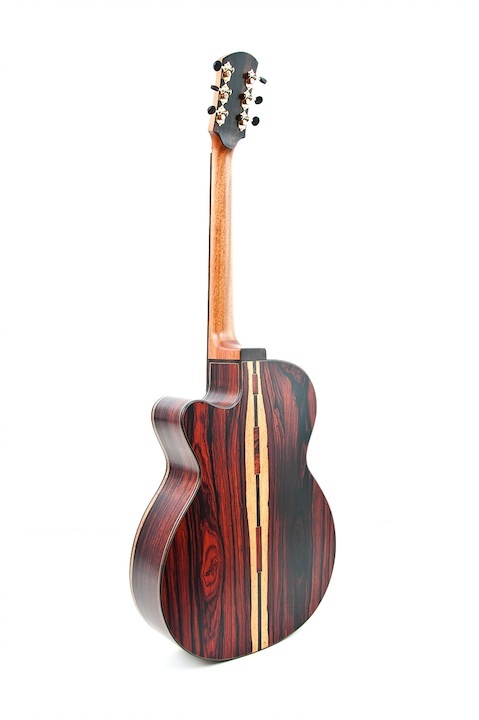 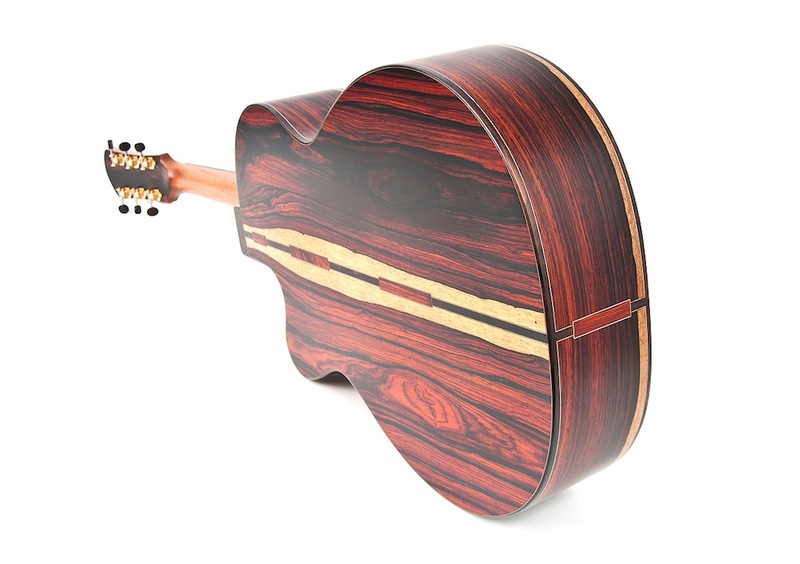 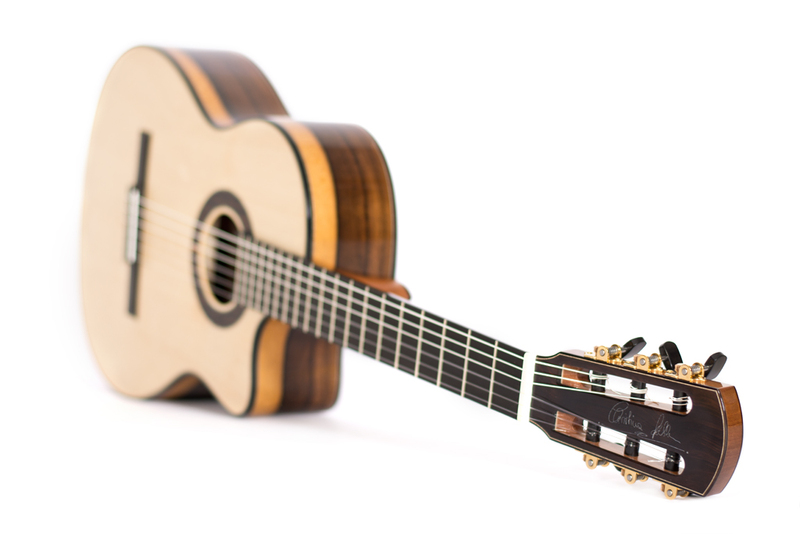 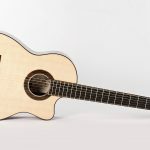 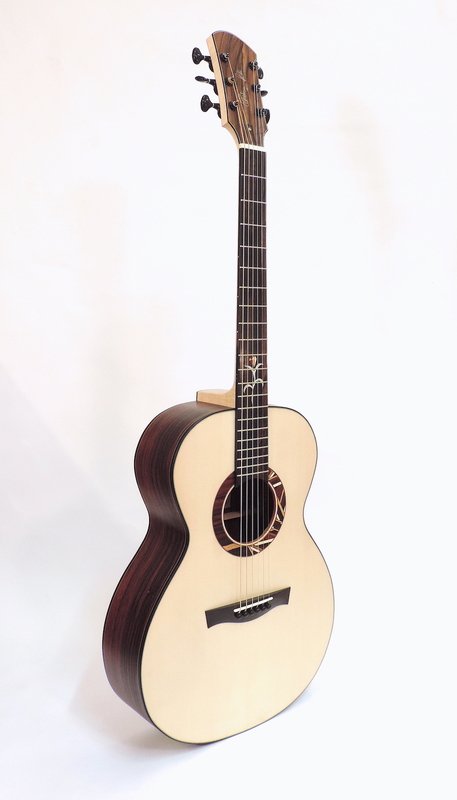 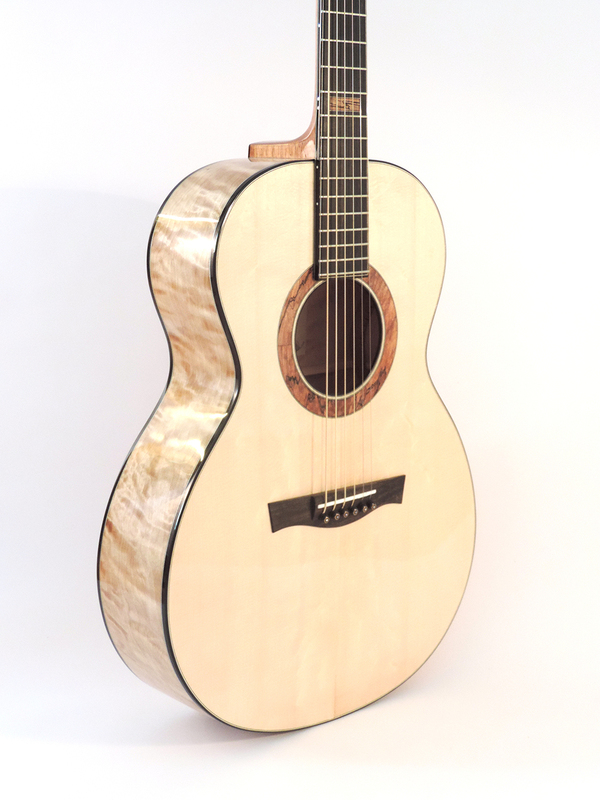 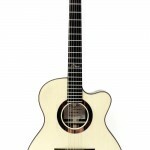 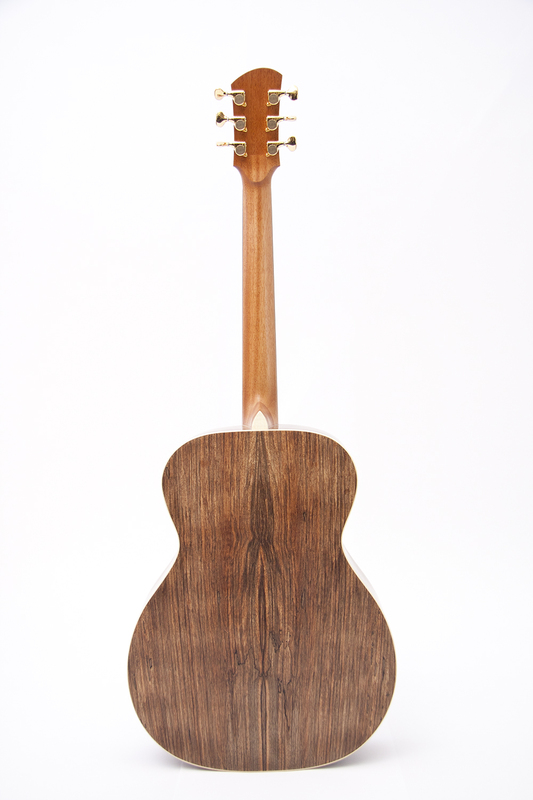 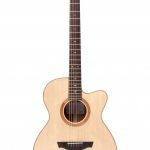 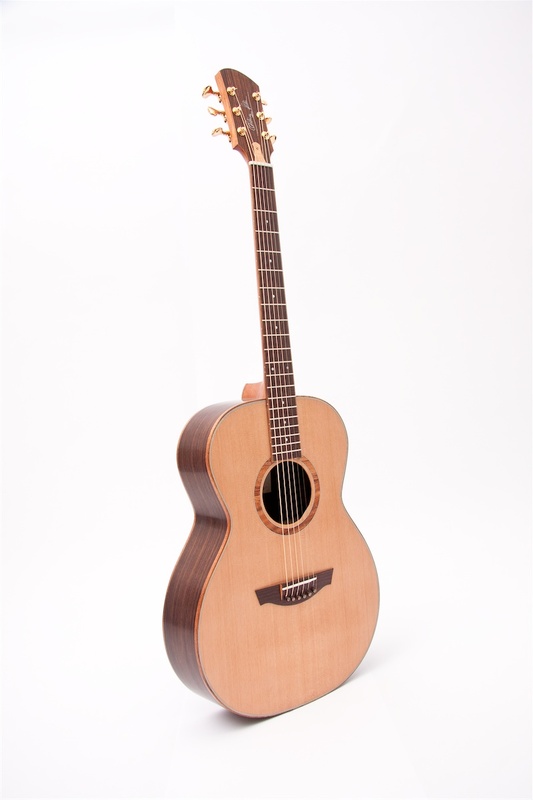 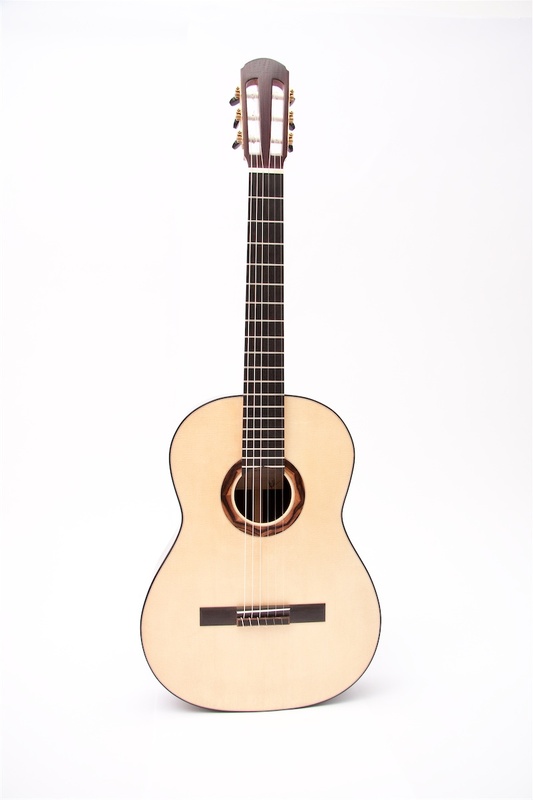 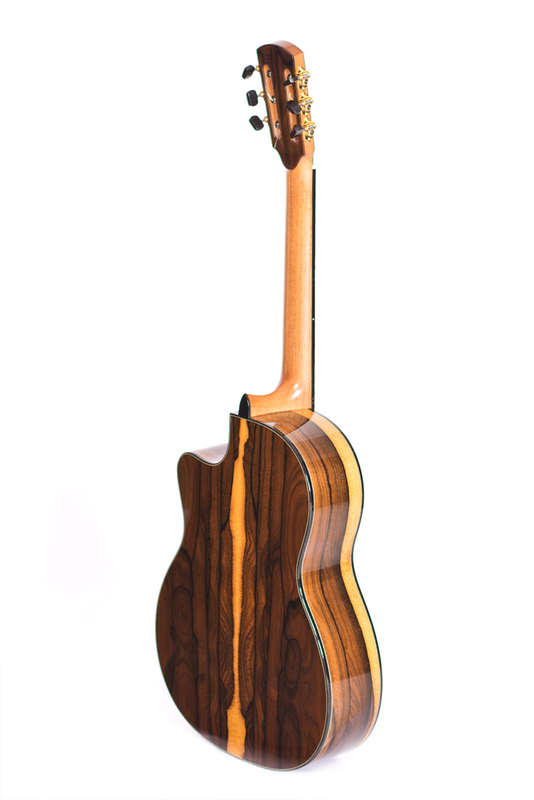 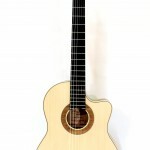 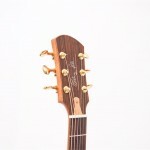 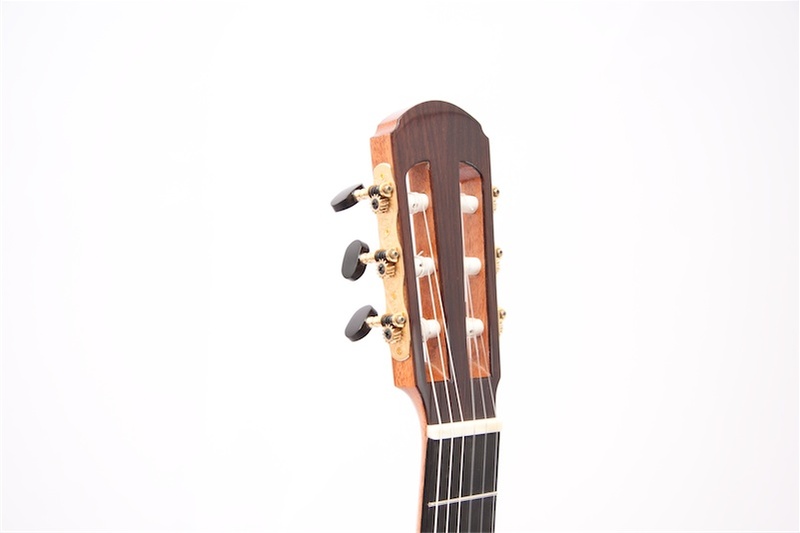 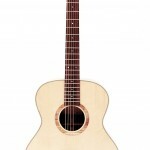 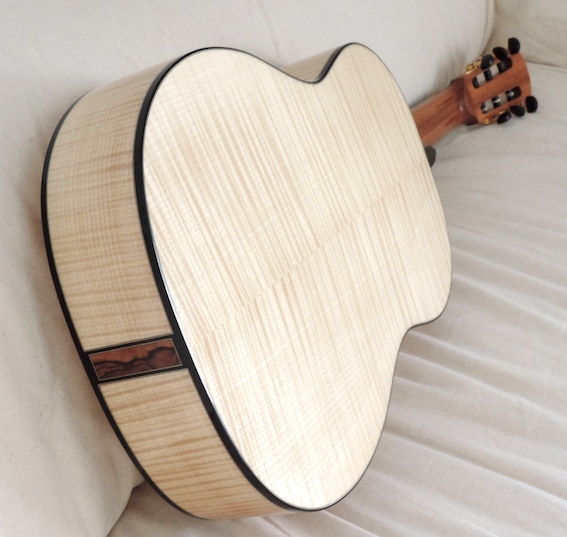 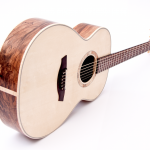 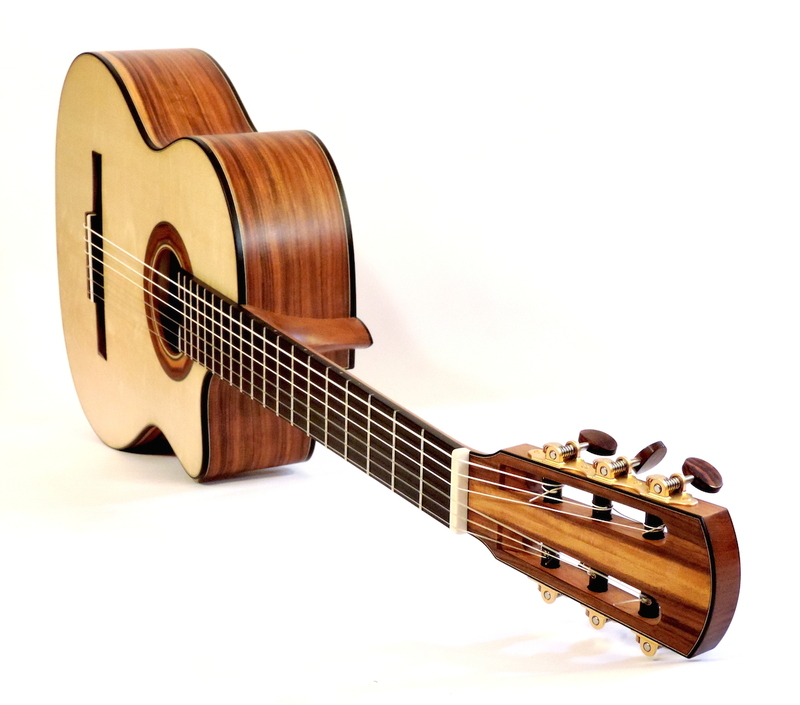 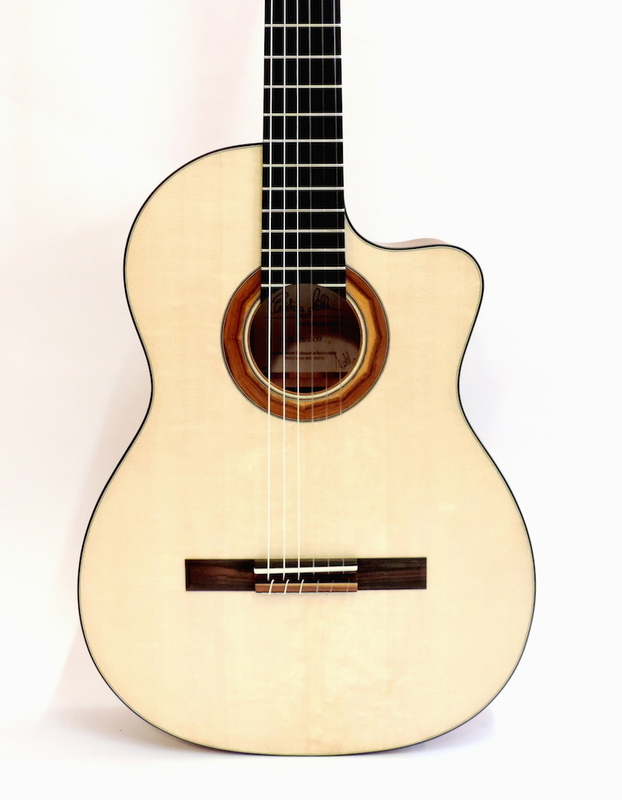 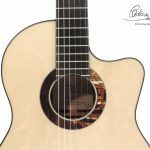 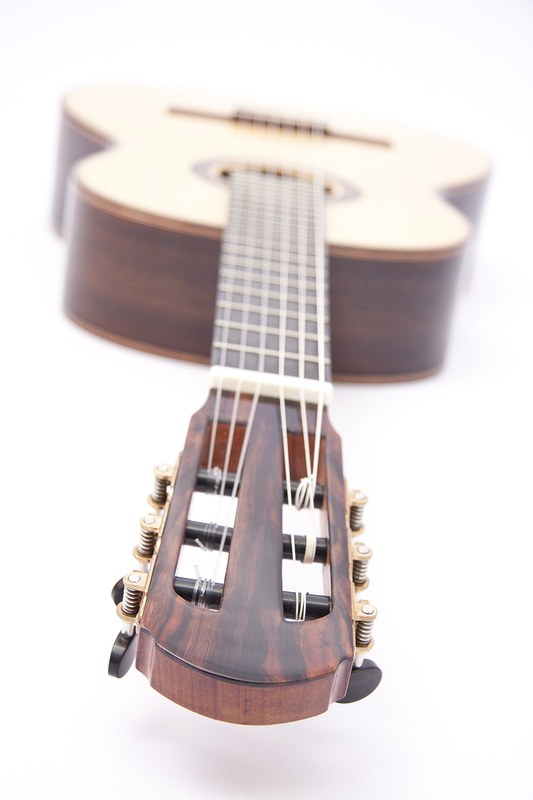 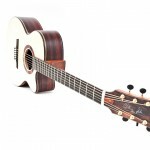 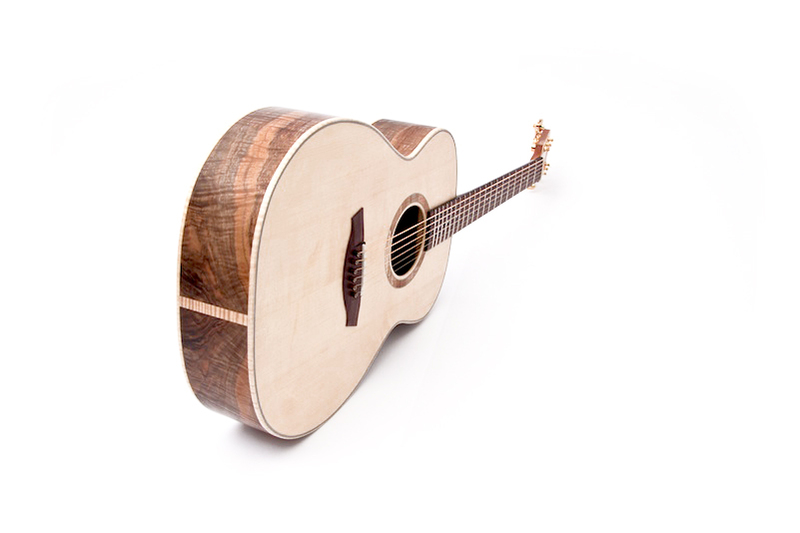 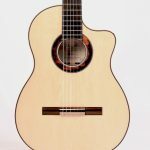 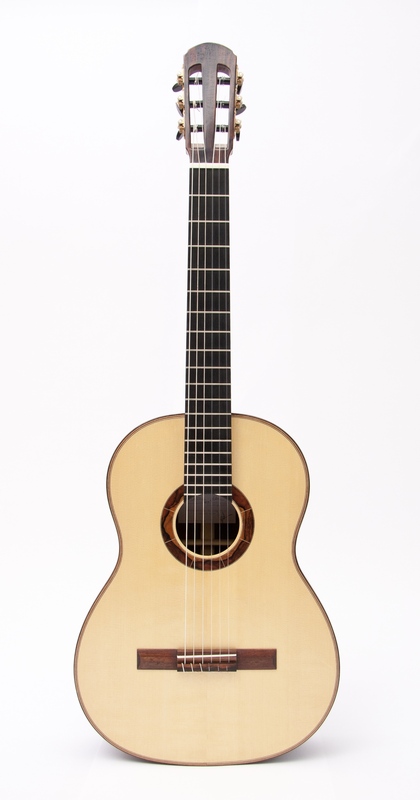 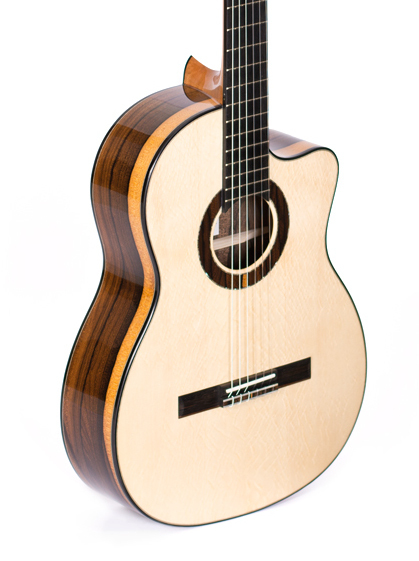 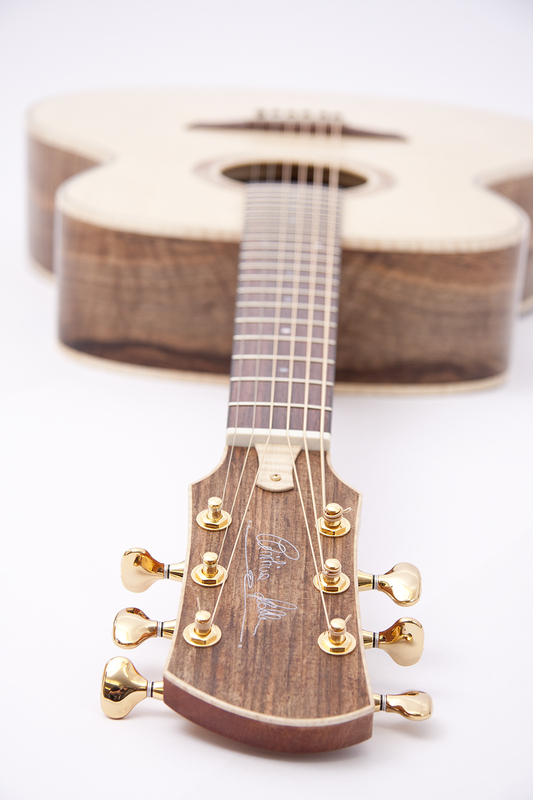 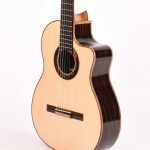 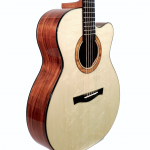 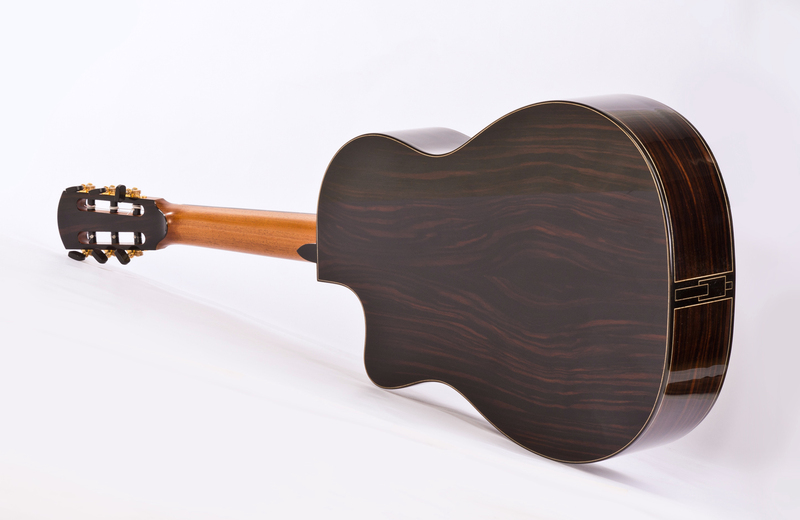 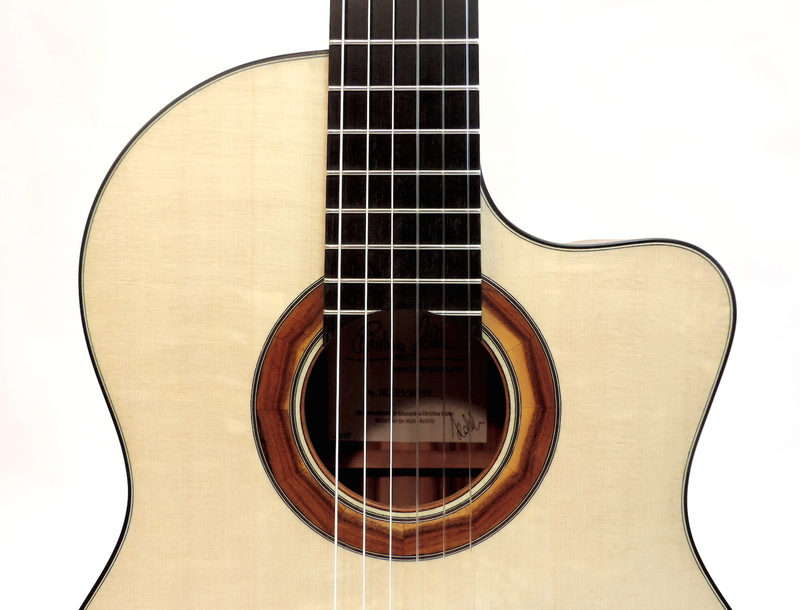 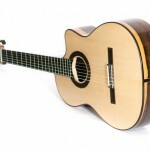 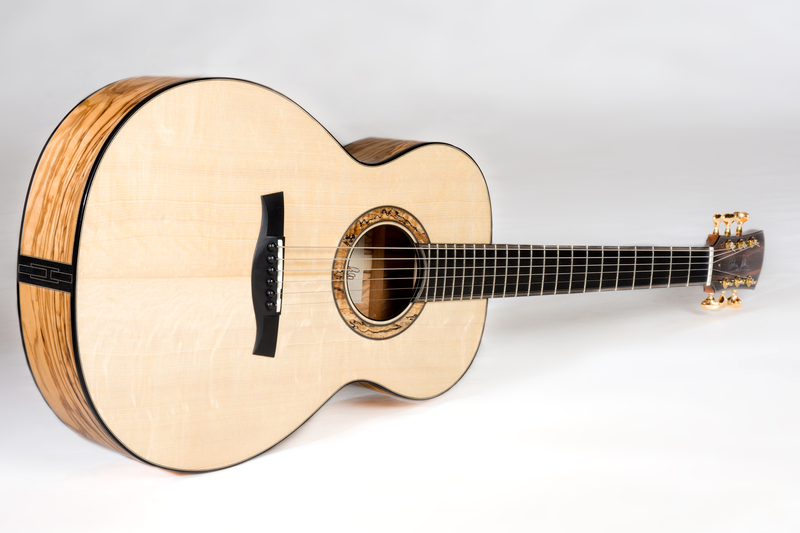 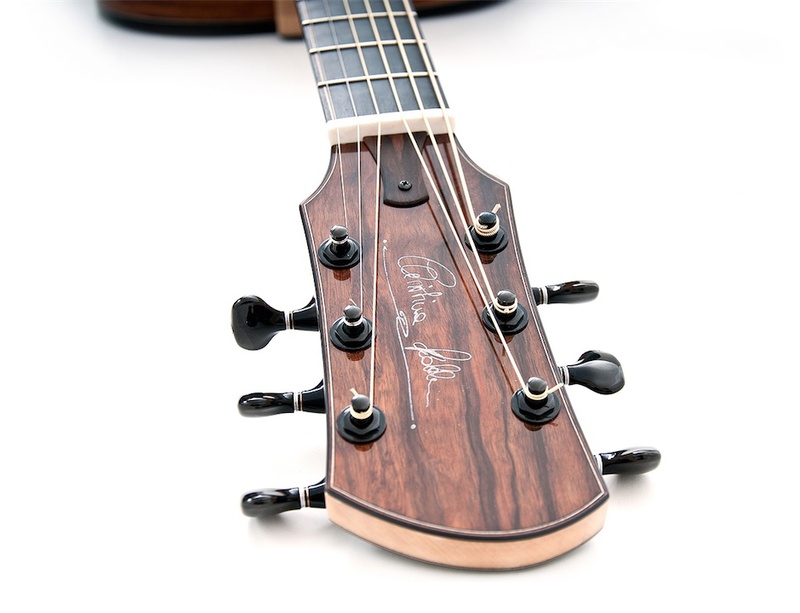 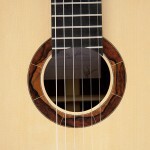 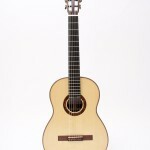 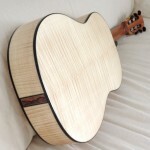 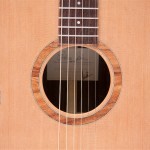 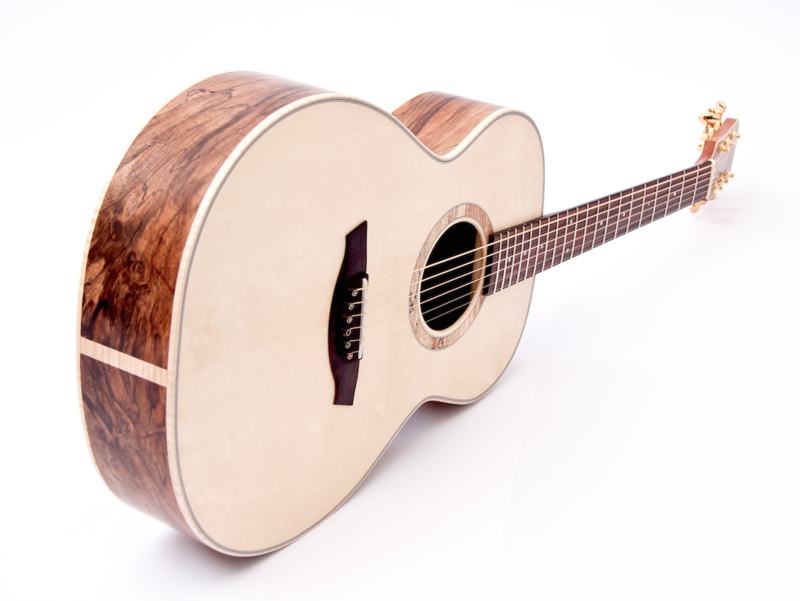 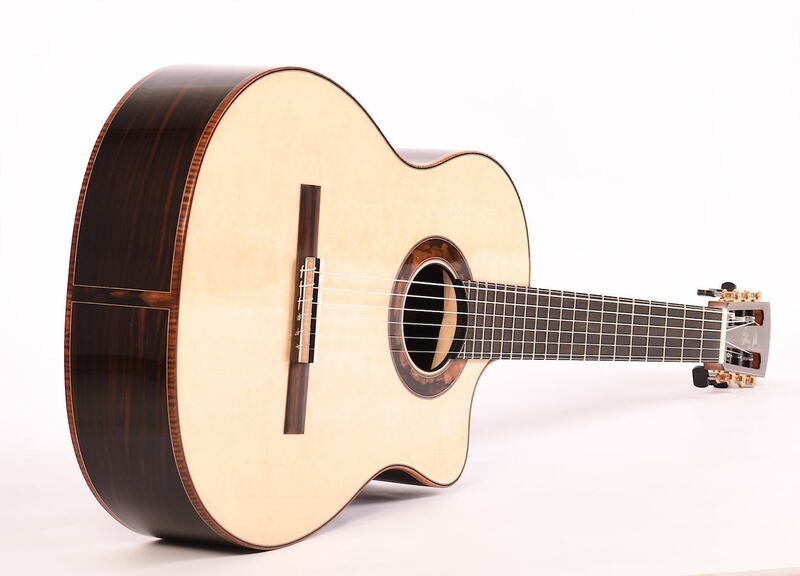 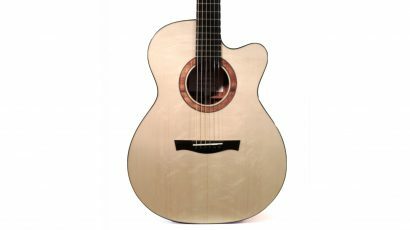 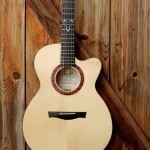 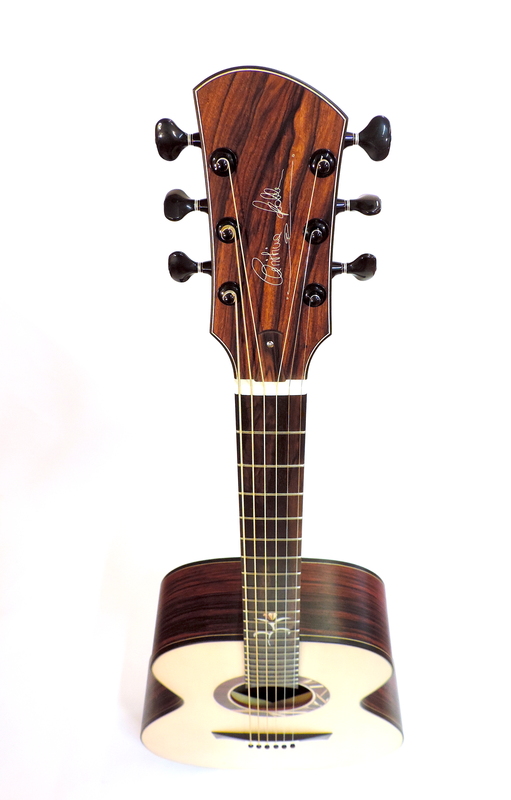 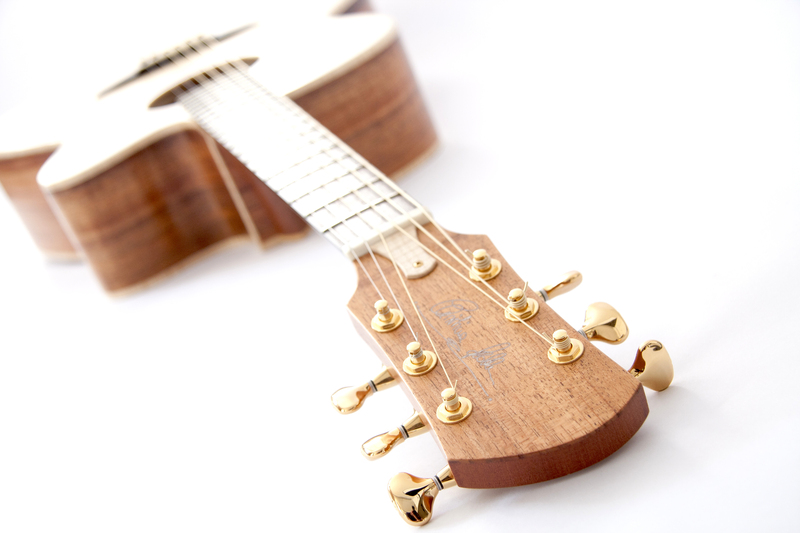 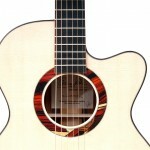 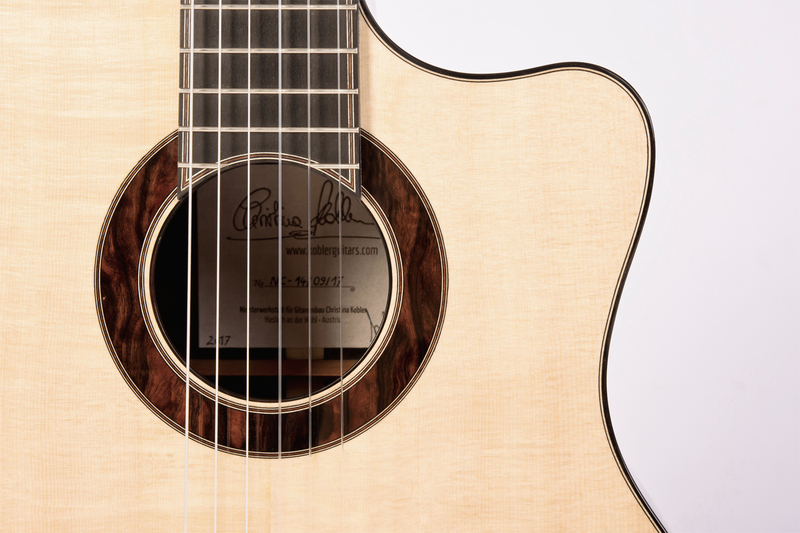 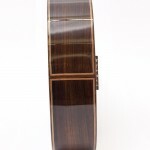 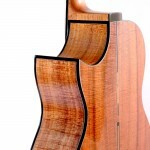 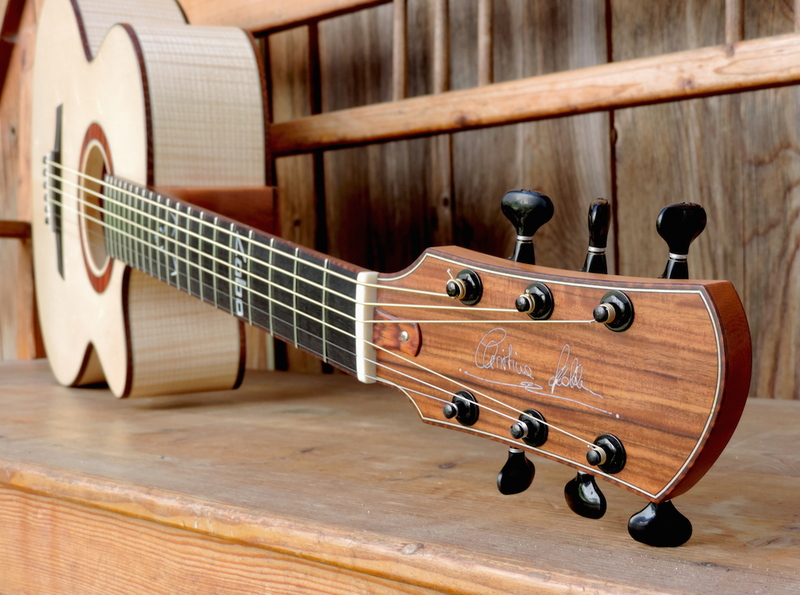 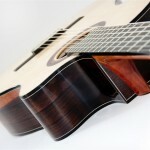 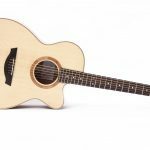 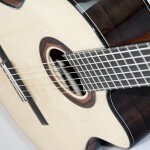 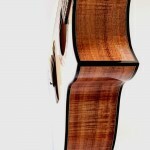 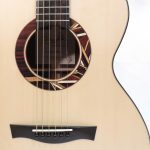 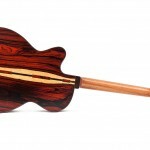 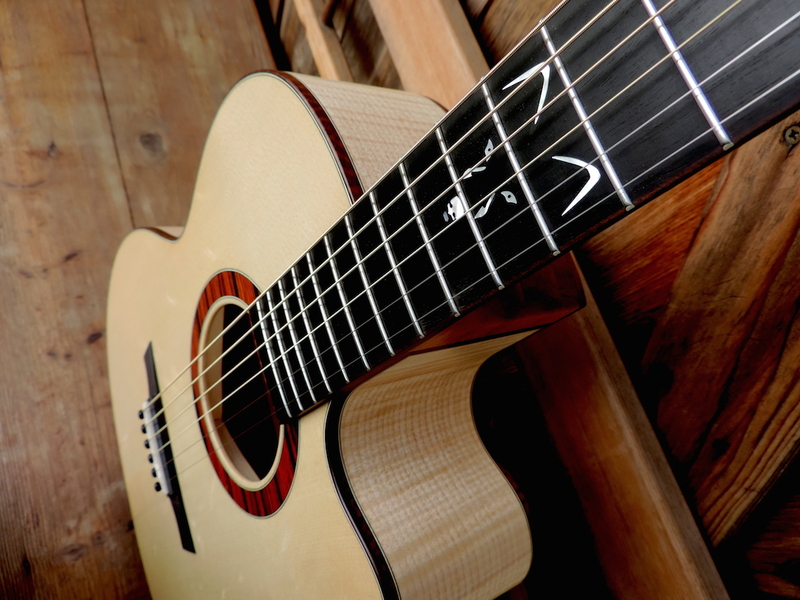 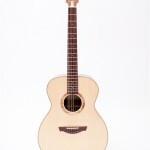 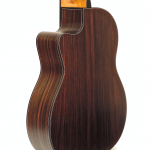 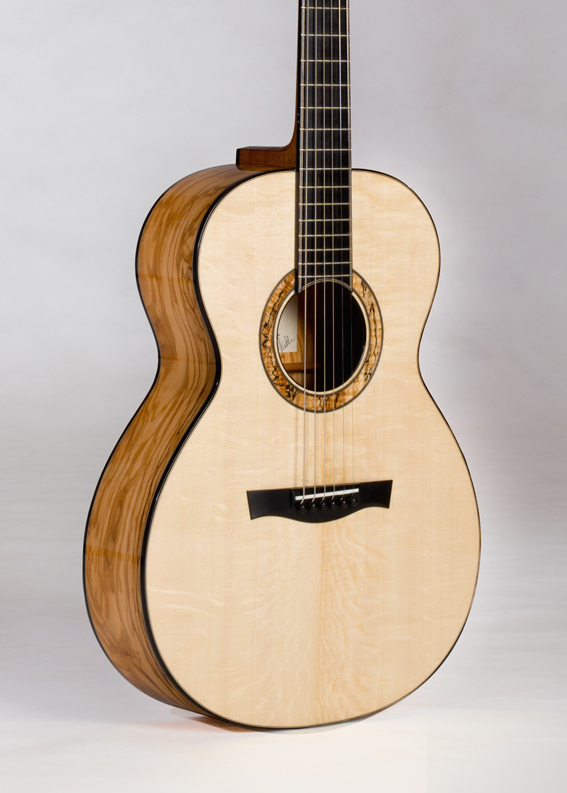 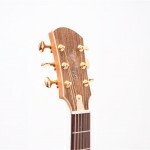 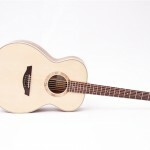 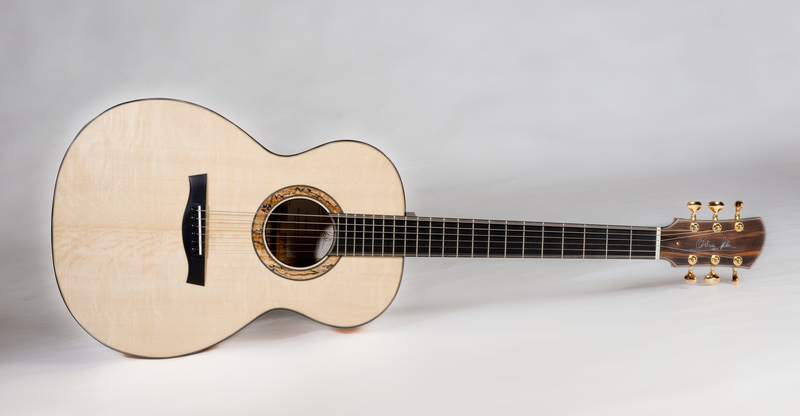 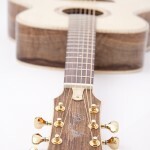 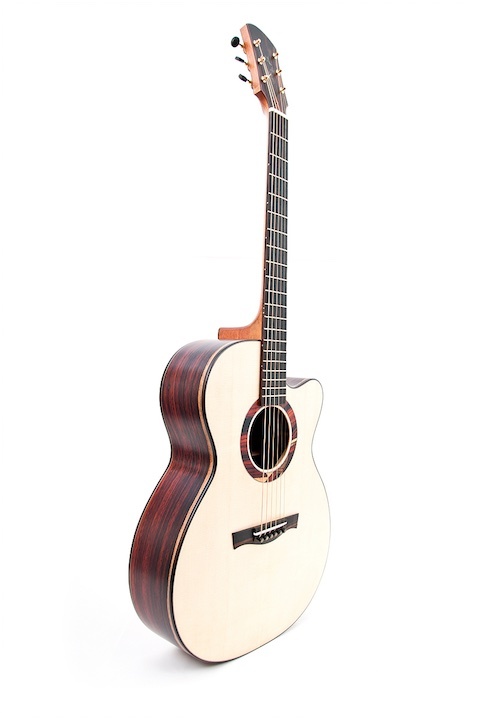 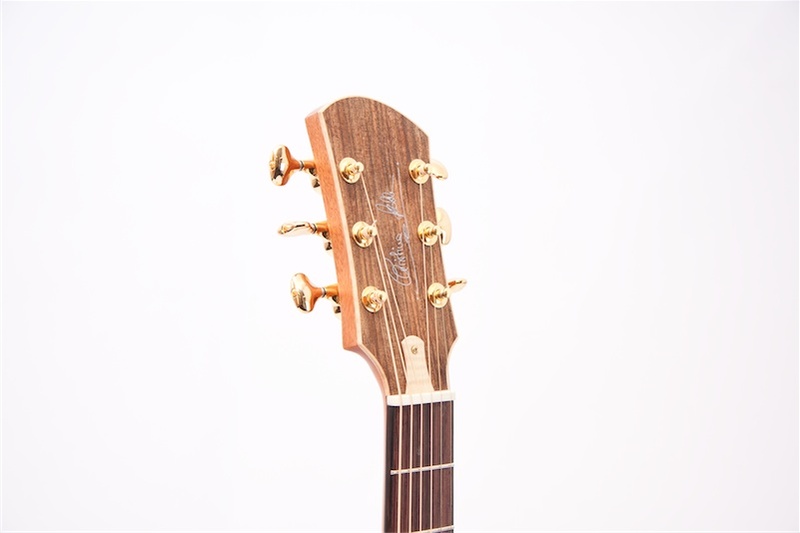 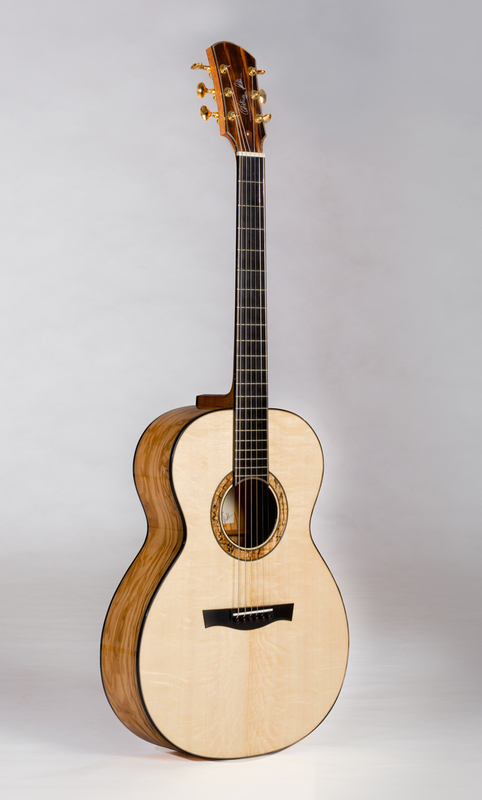 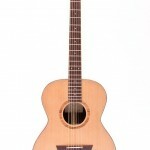 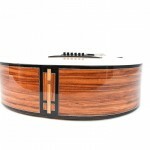 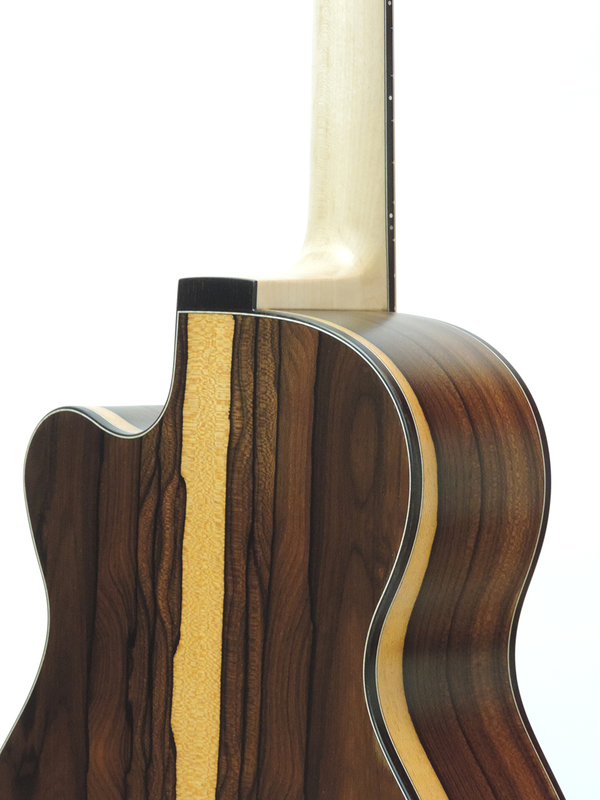 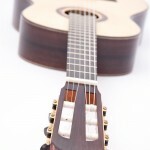 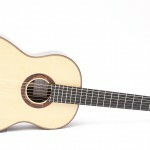 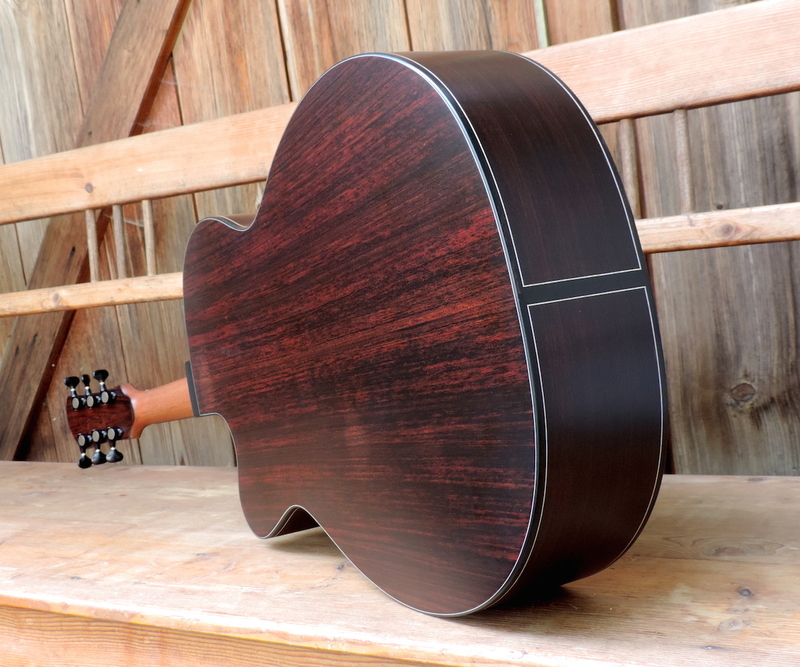 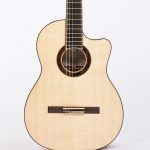 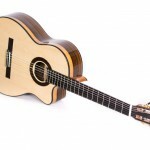 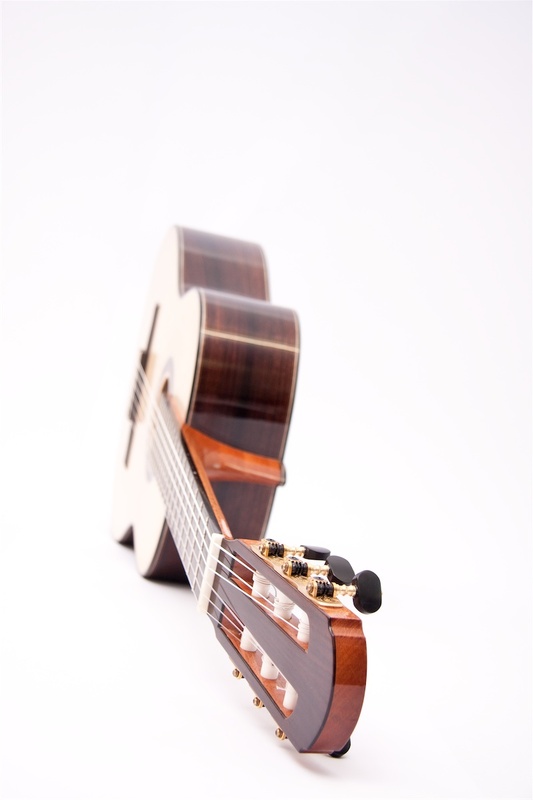 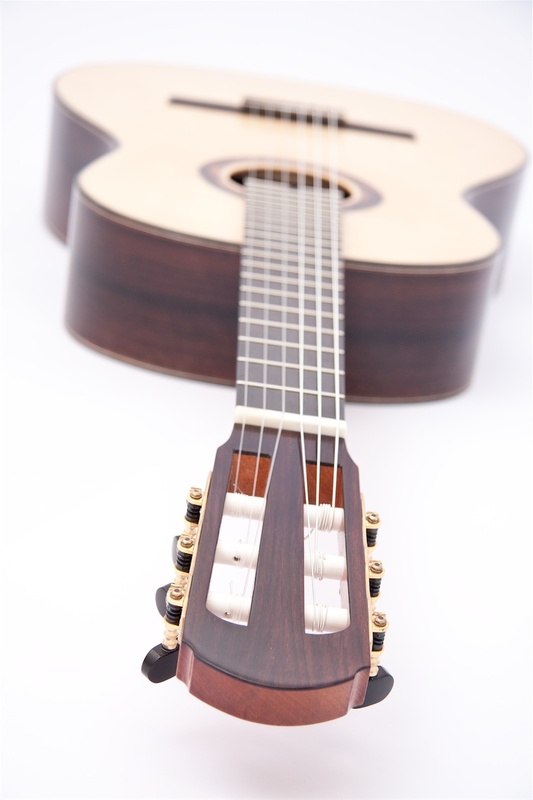 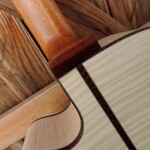 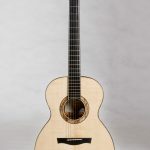 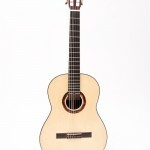 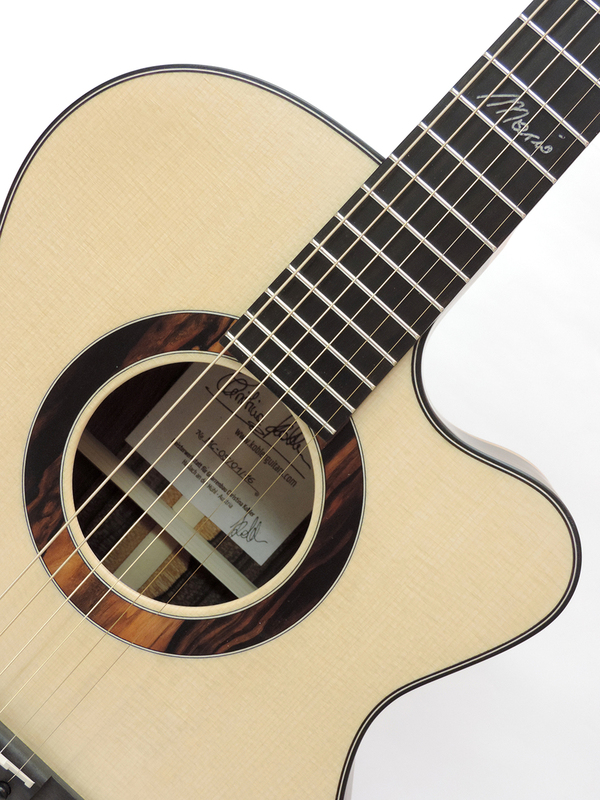 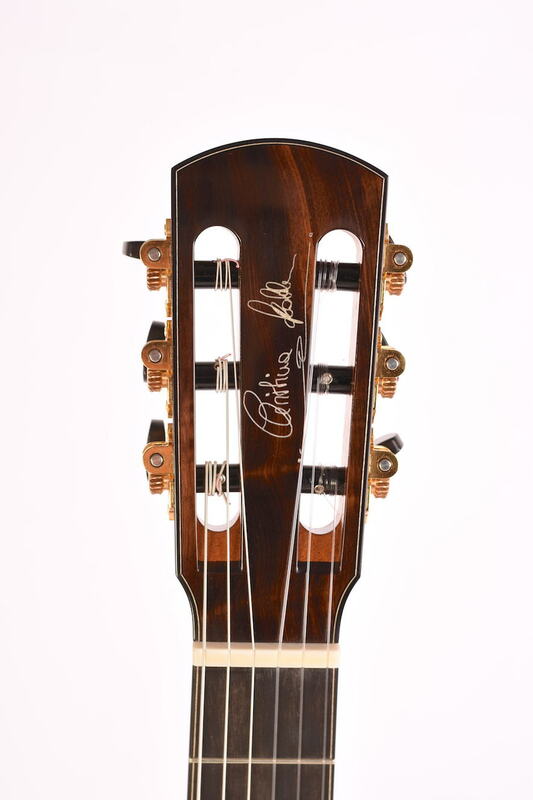 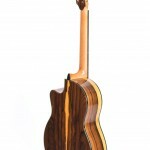 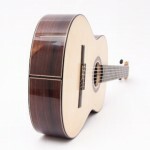 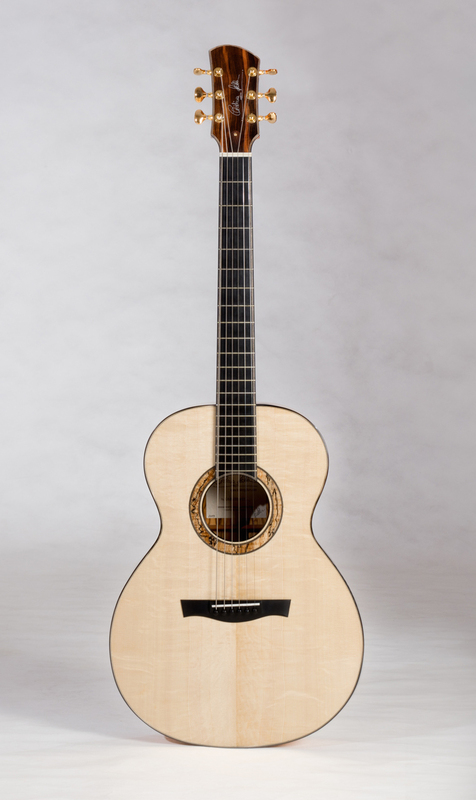 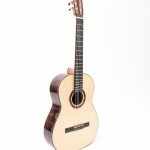 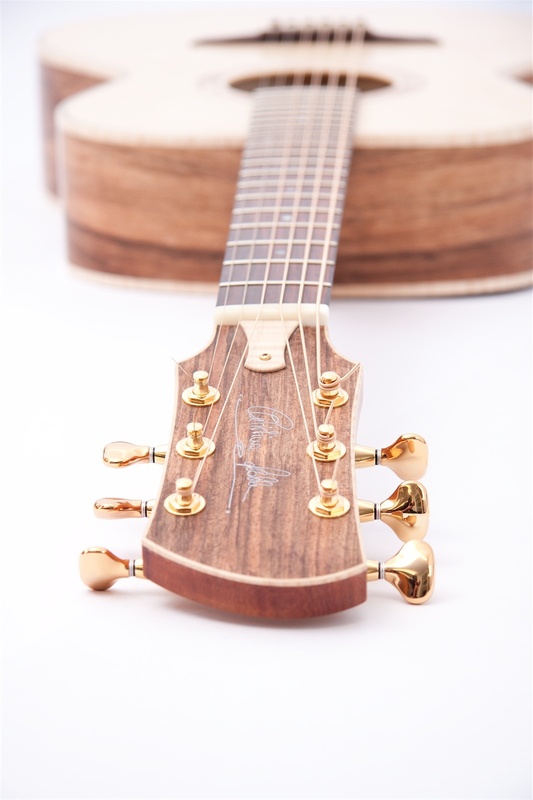 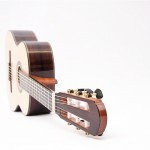 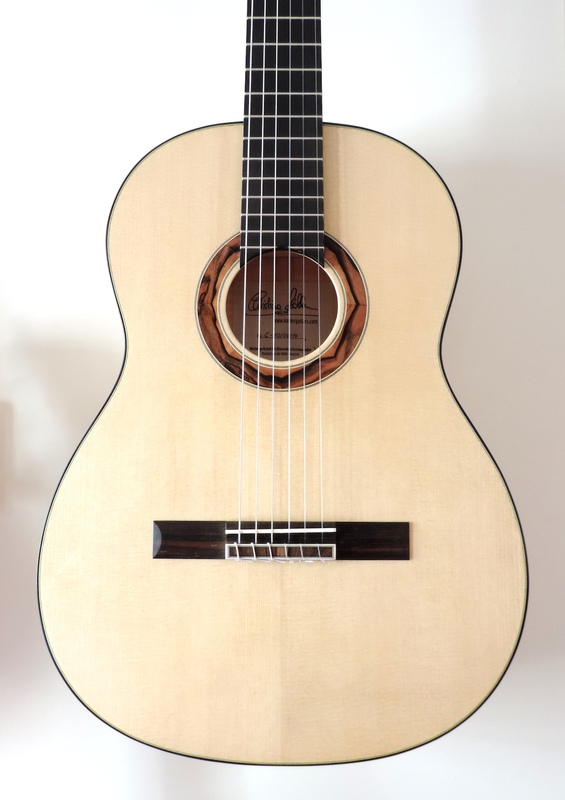 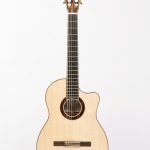 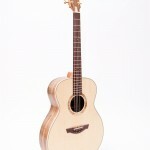 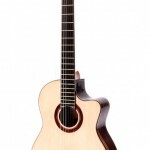 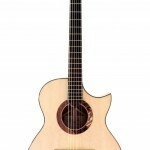 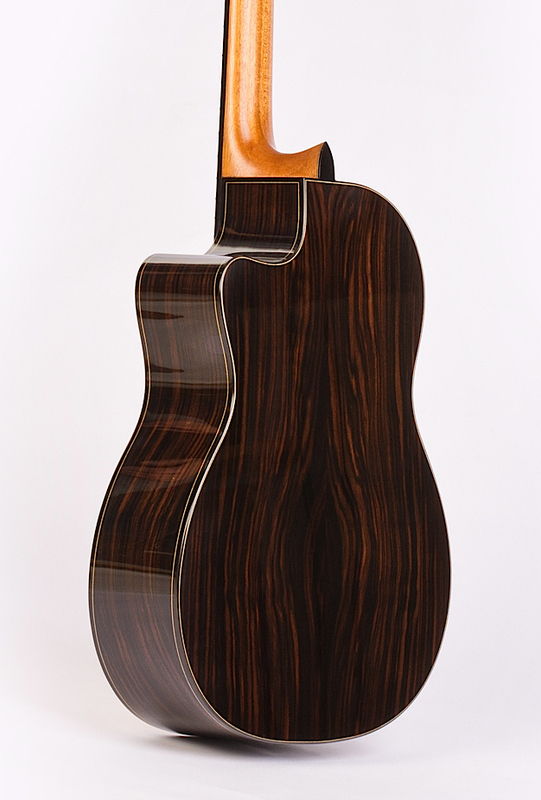 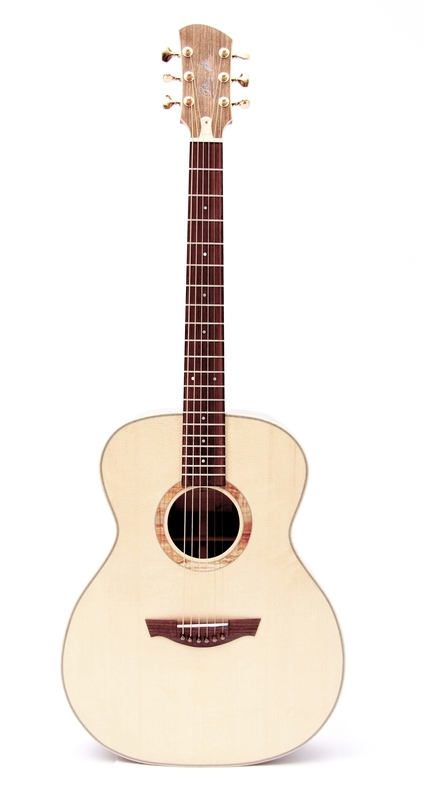 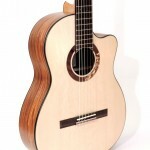 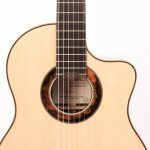 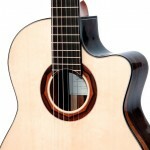 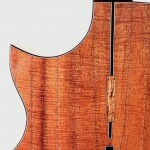 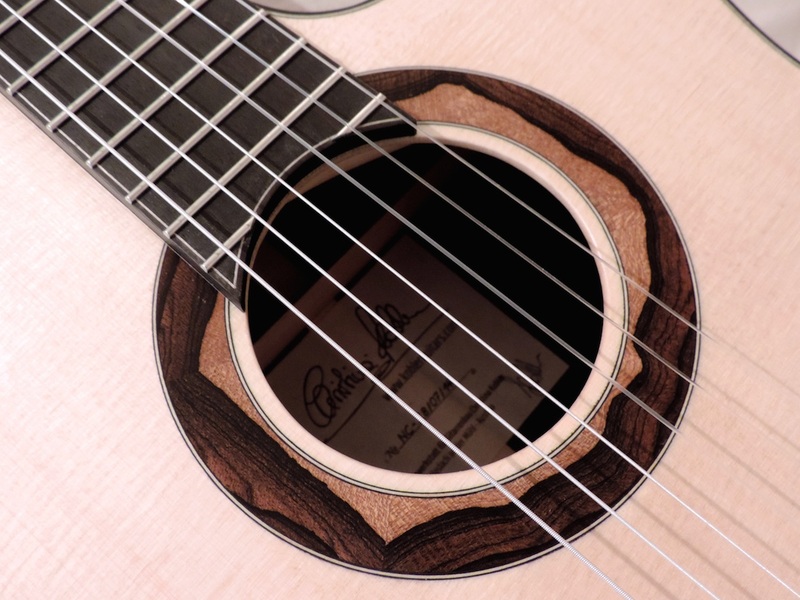 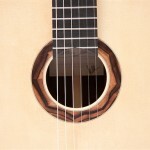 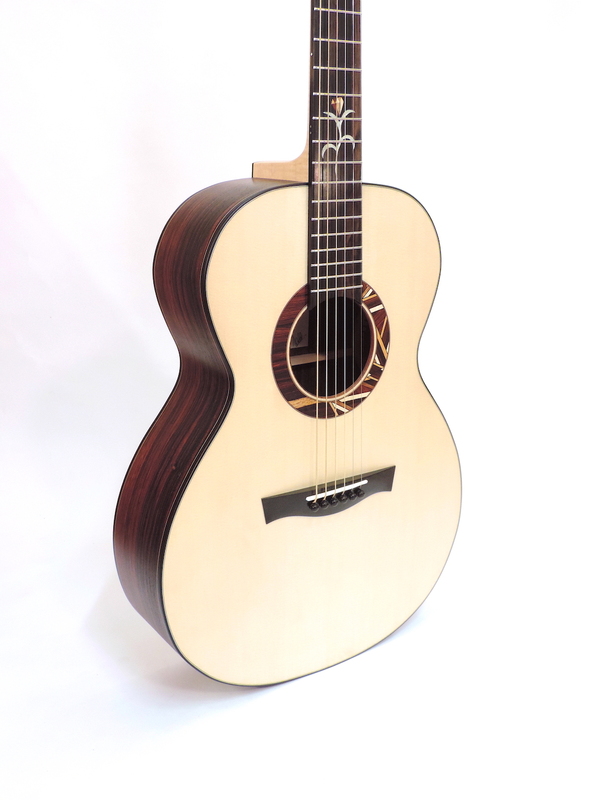 In addition, a soft cutaway provides an exceptional playing comfort at higher registers. 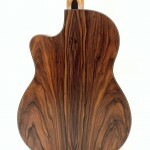 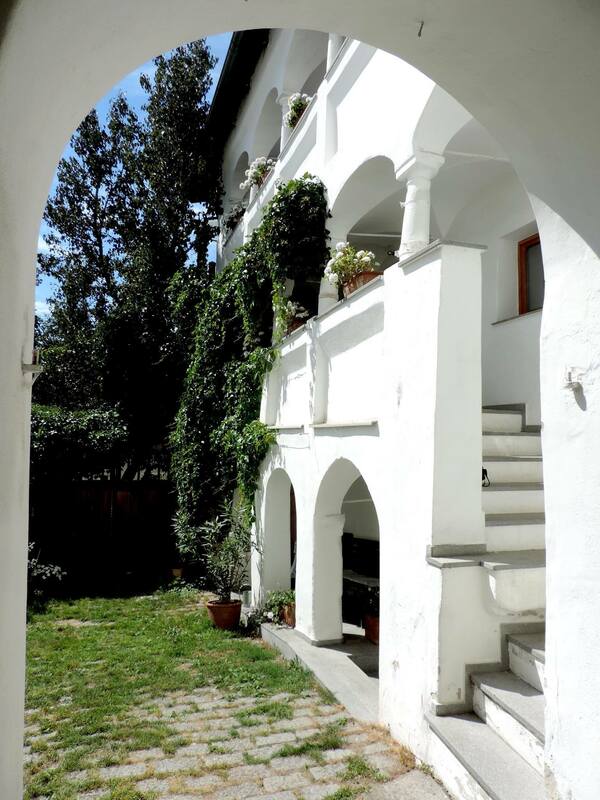 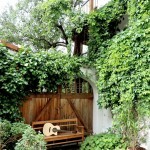 and impresses with its rich tones and its sustainability.